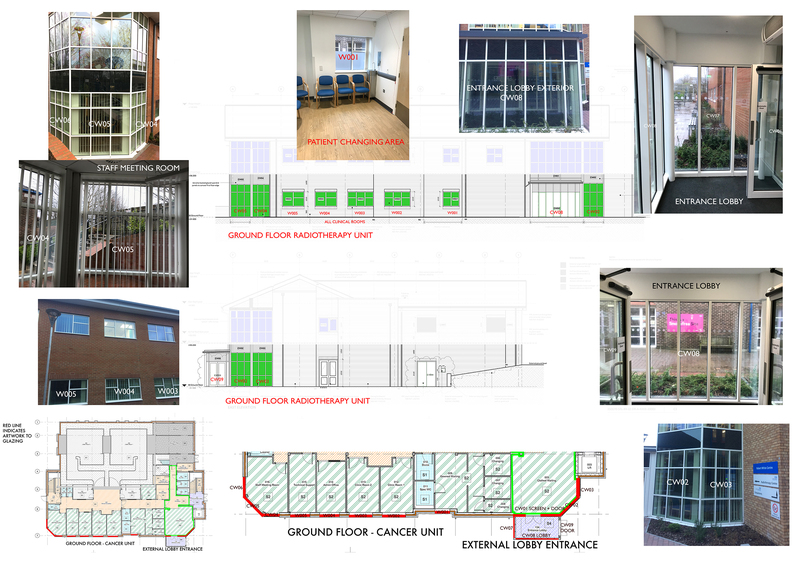 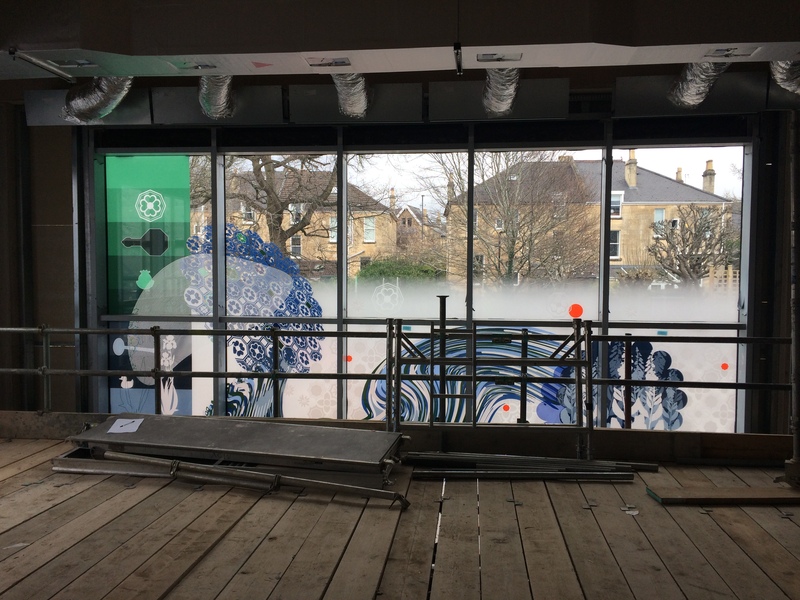 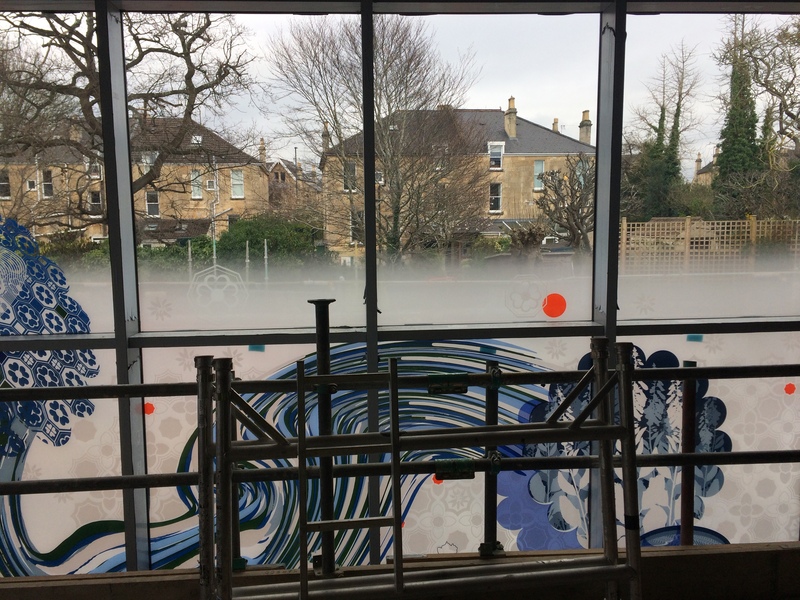 Drafts and sketches for the digitally printed glazing vinyl artwork for the ground floor Radiotherapy Unit of the Robert White Cancer Centre are now in progress in the studio. 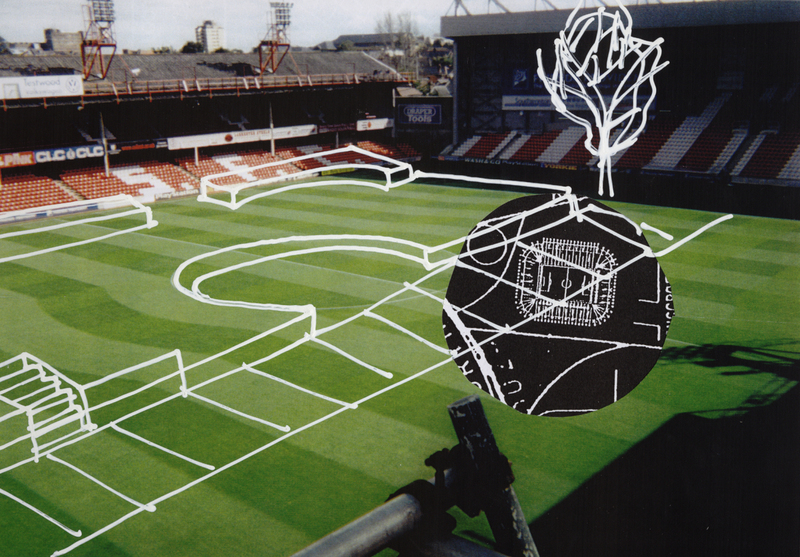 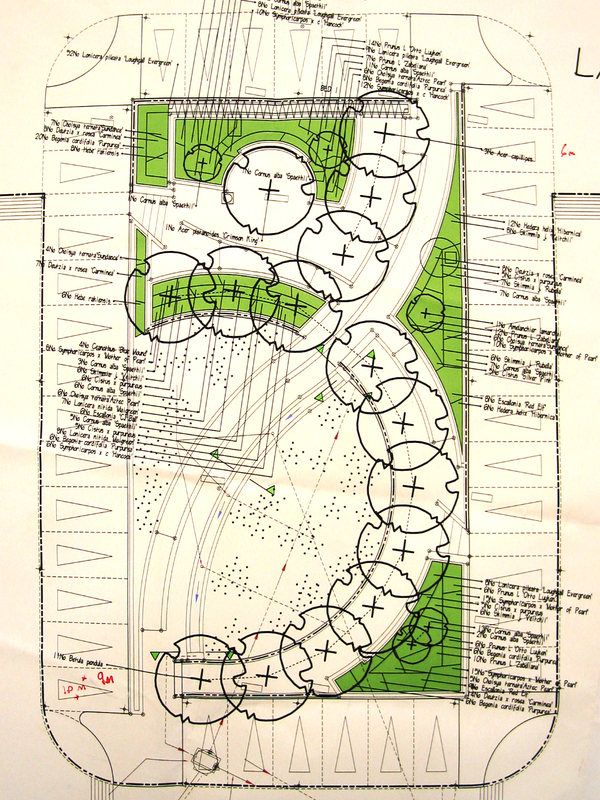 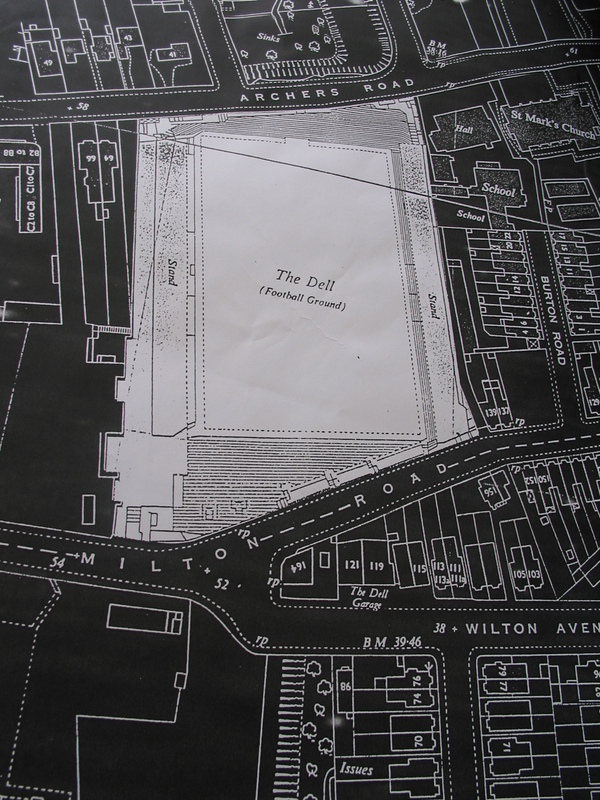 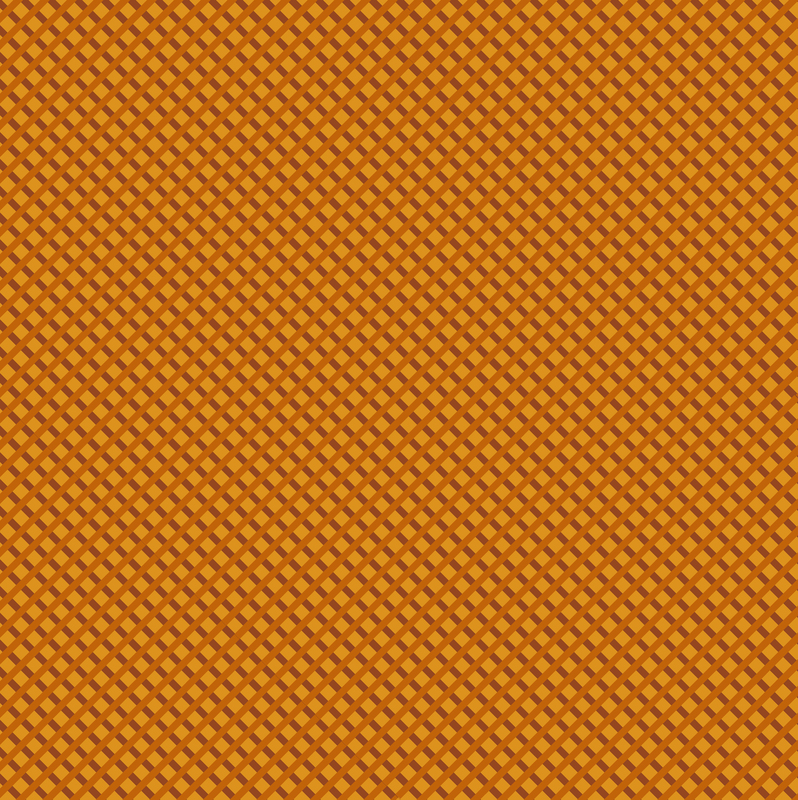 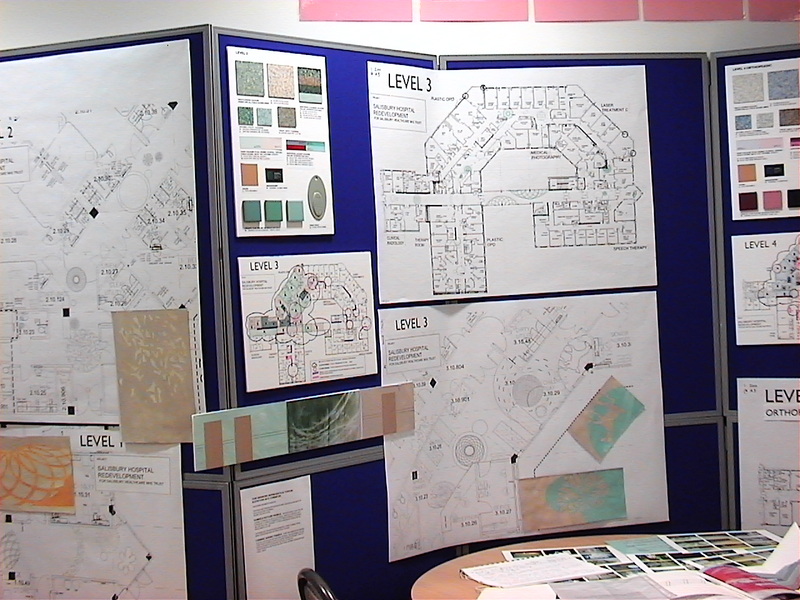 At this stage, the drafts are for comment and discussion and the final design work will be tailored in response to this process. 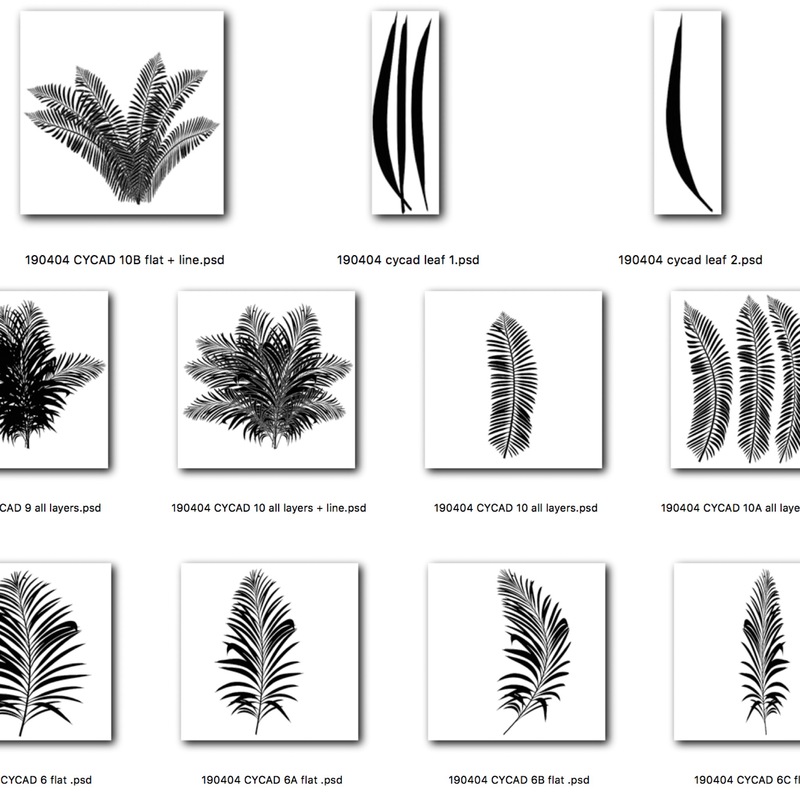 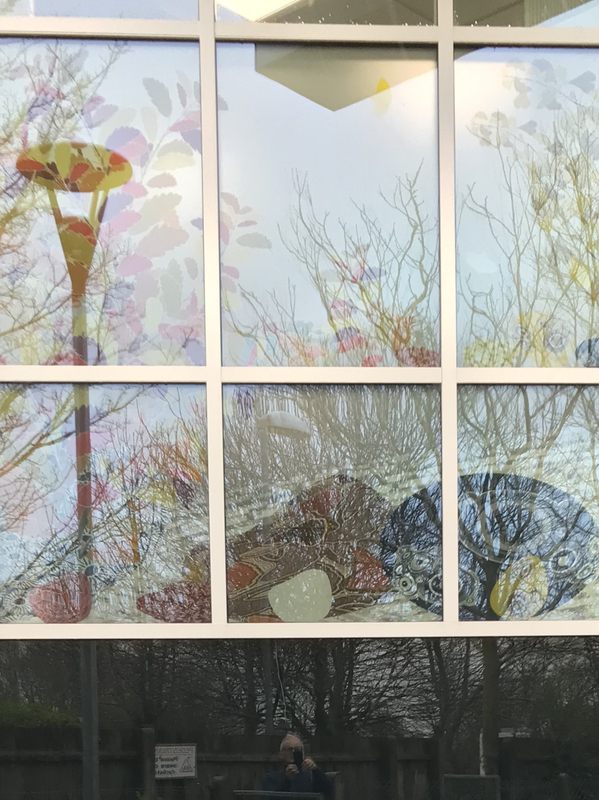 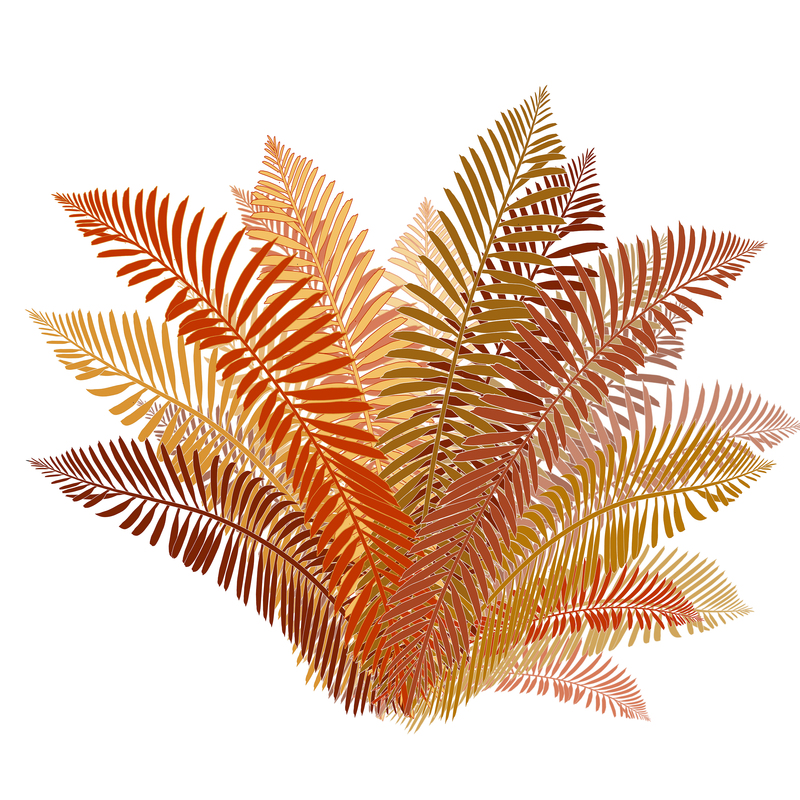 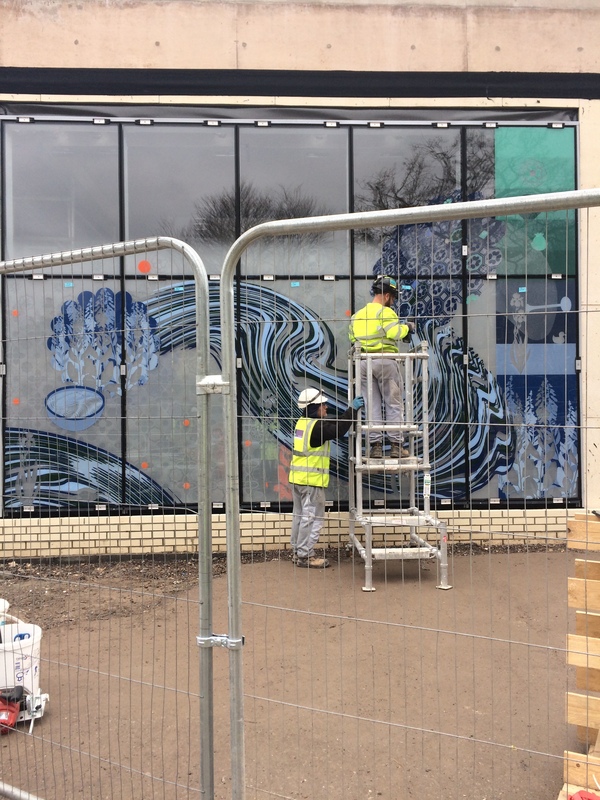 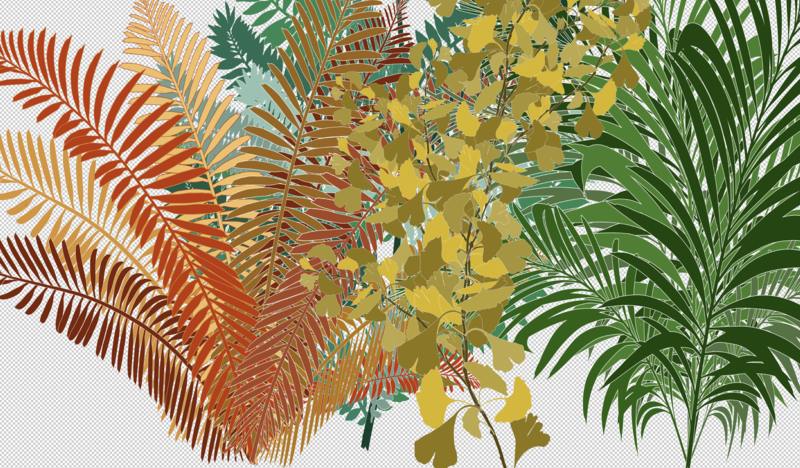 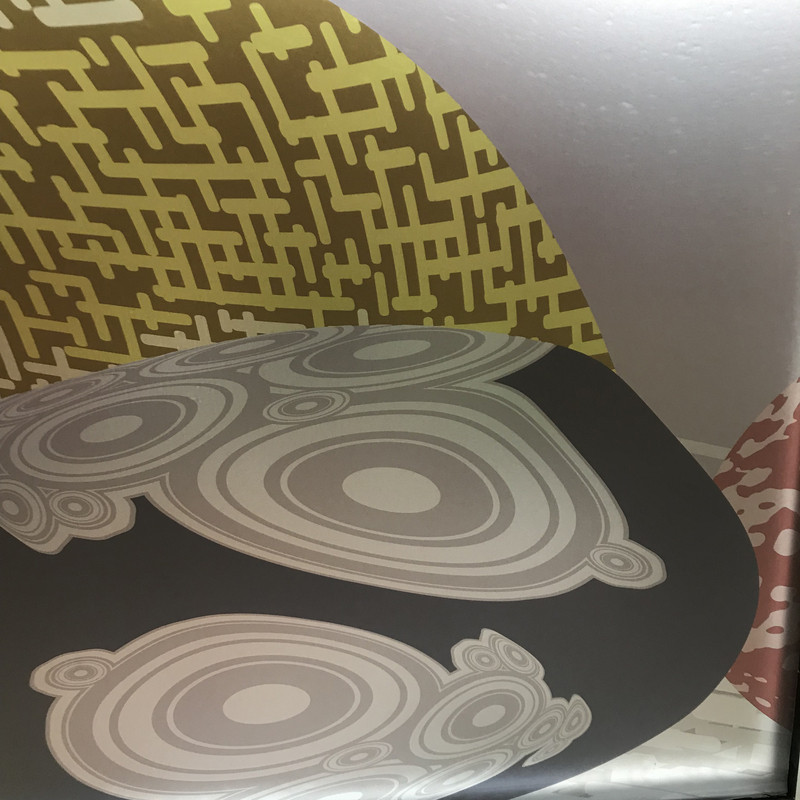 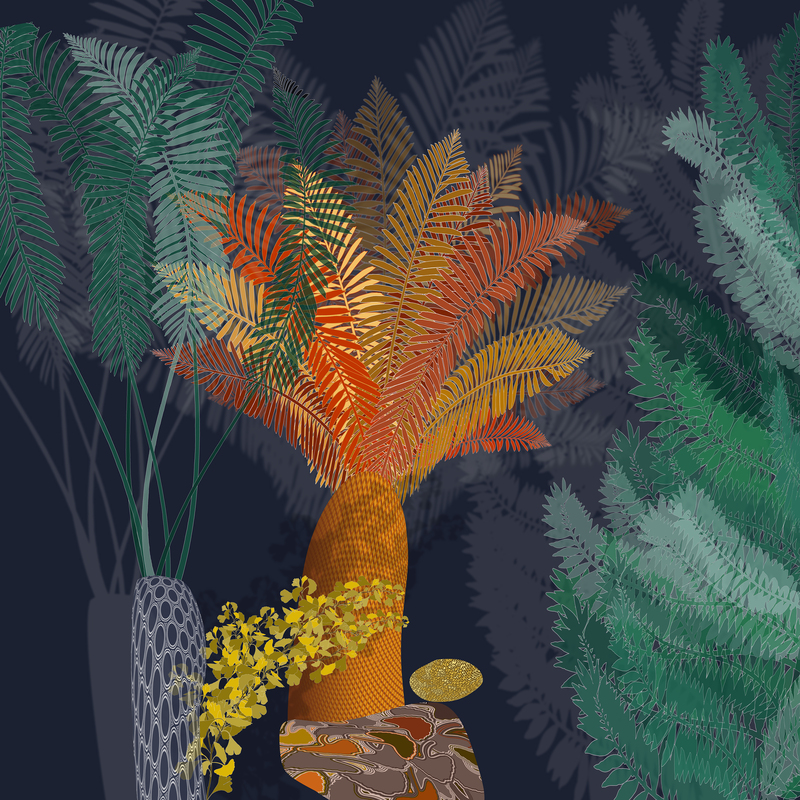 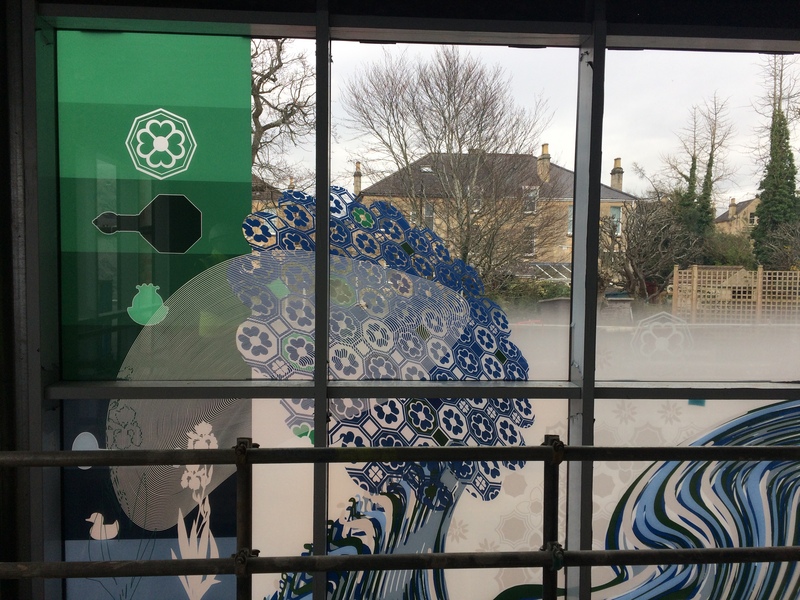 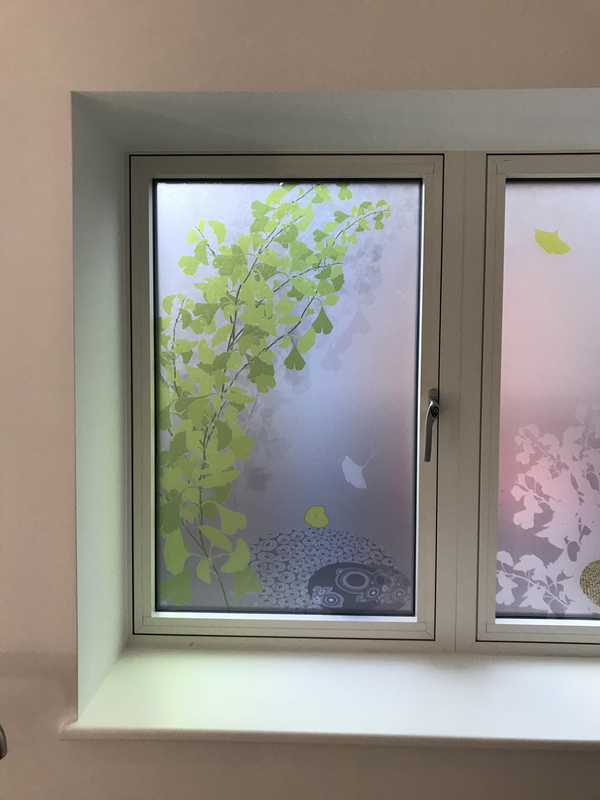 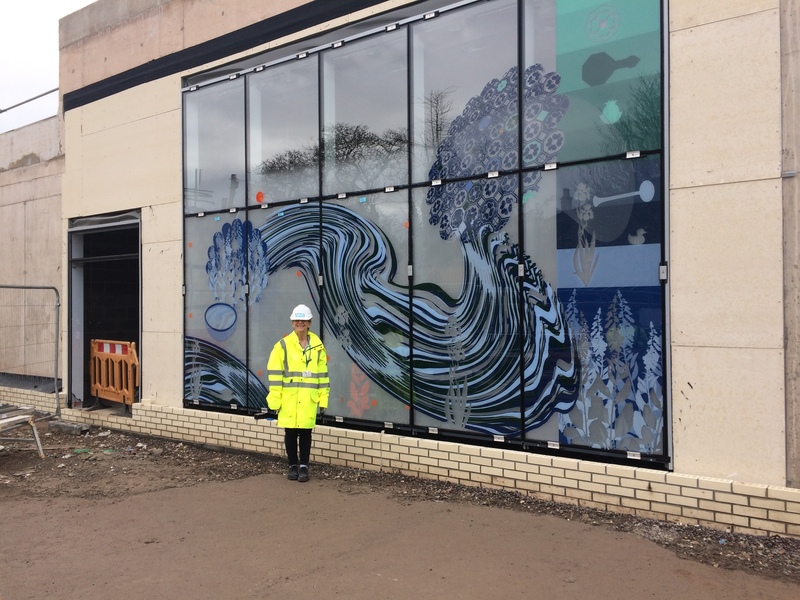 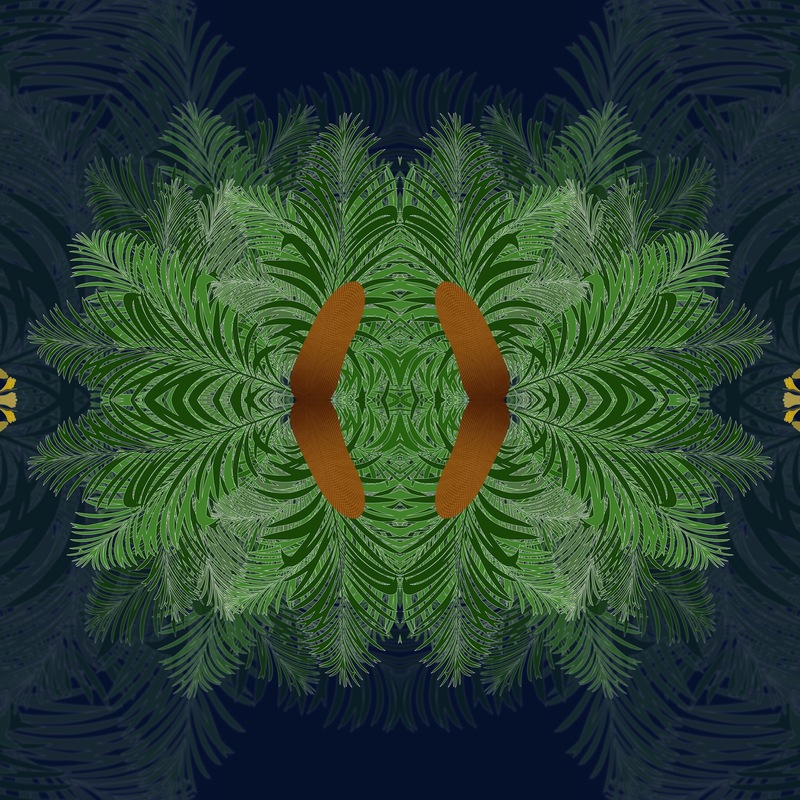 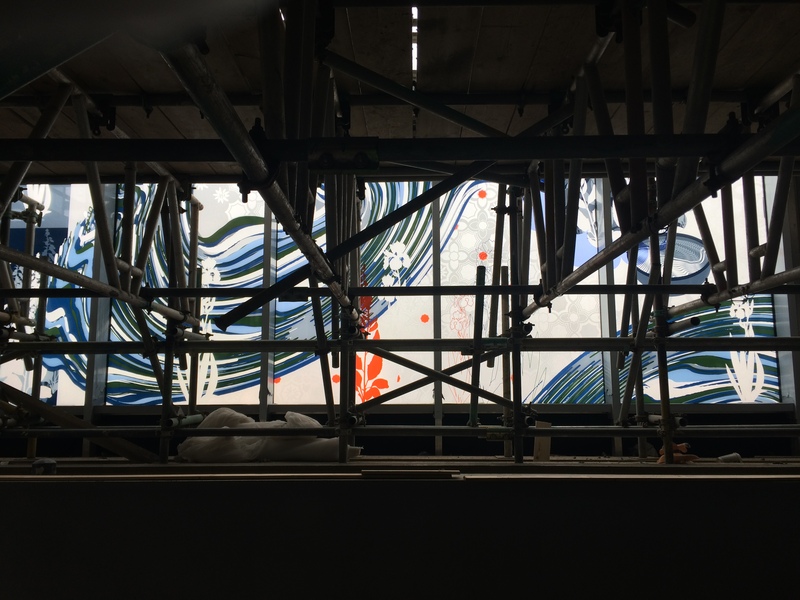 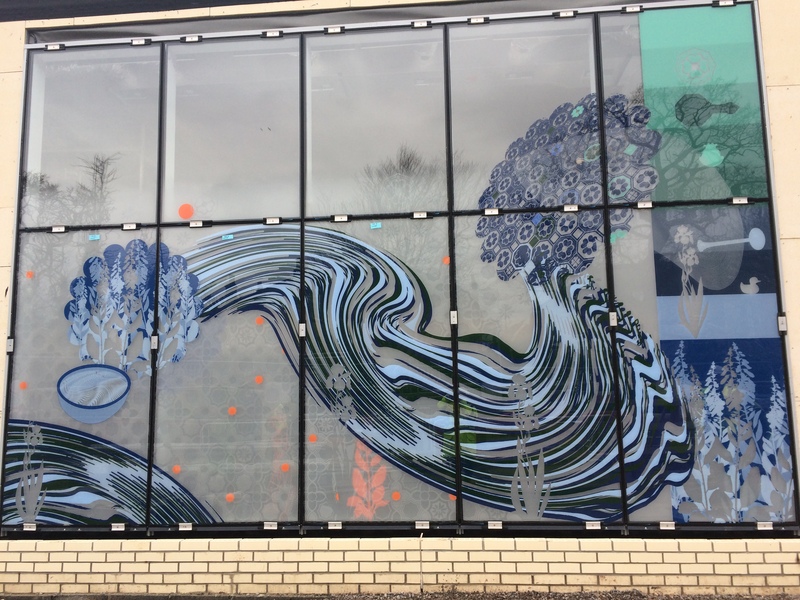 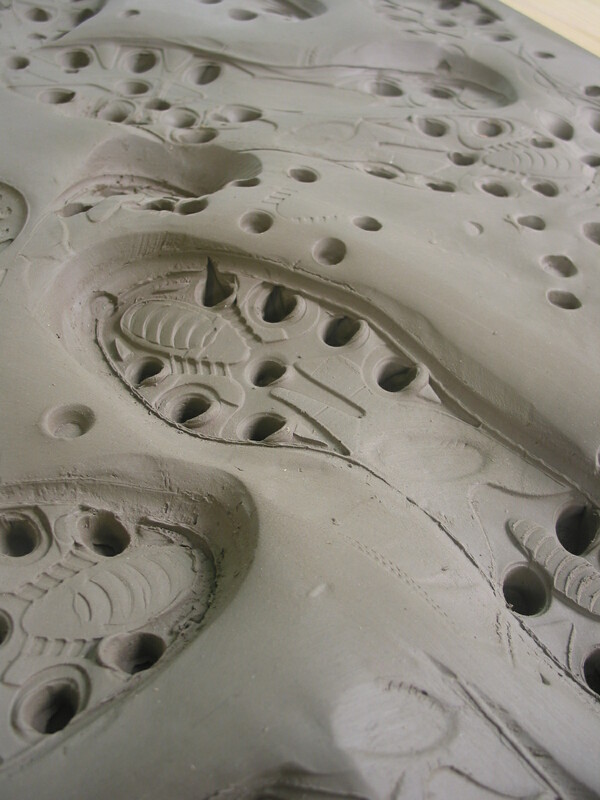 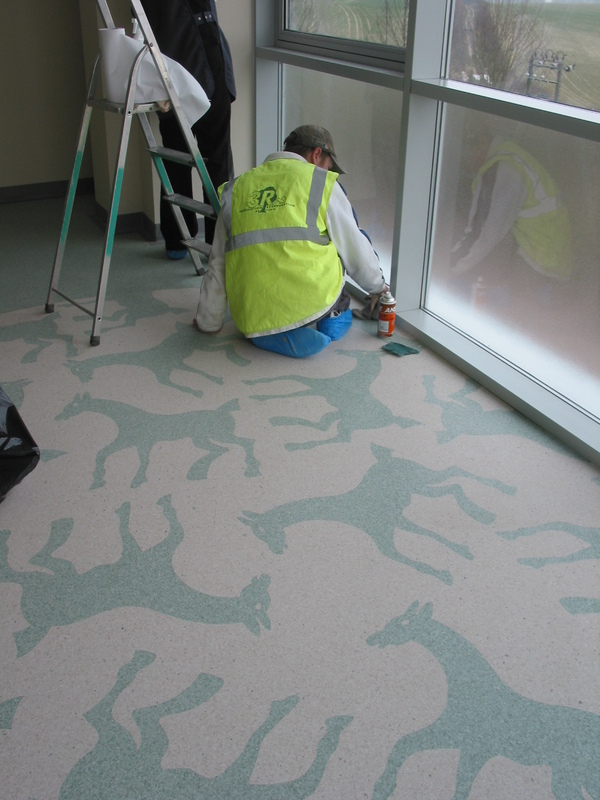 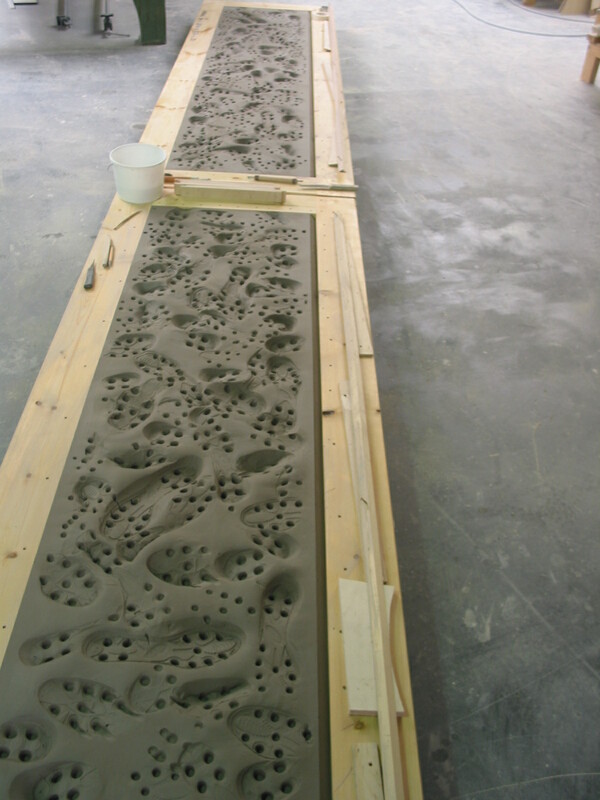 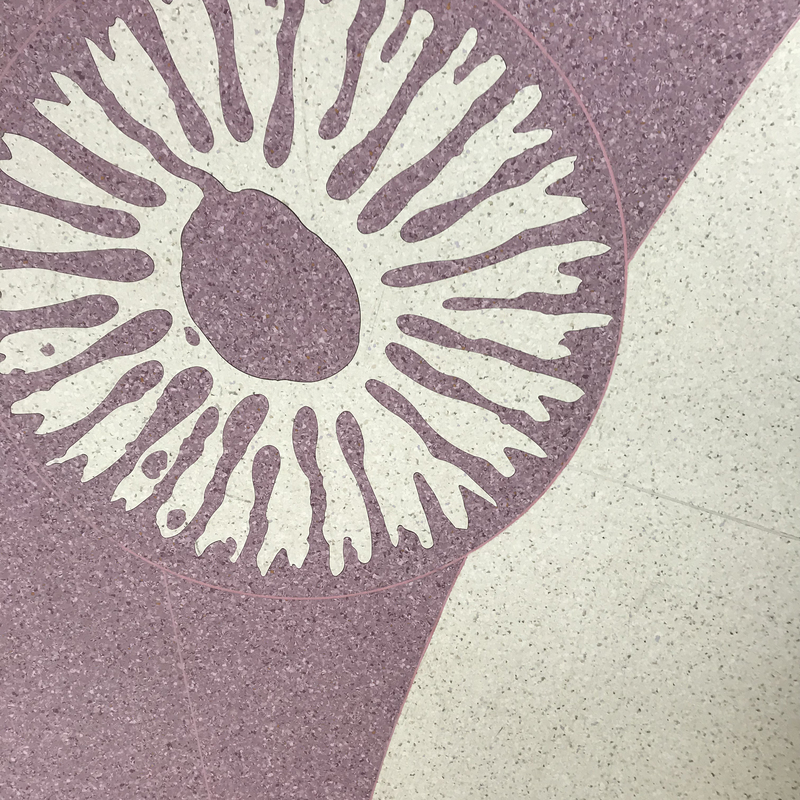 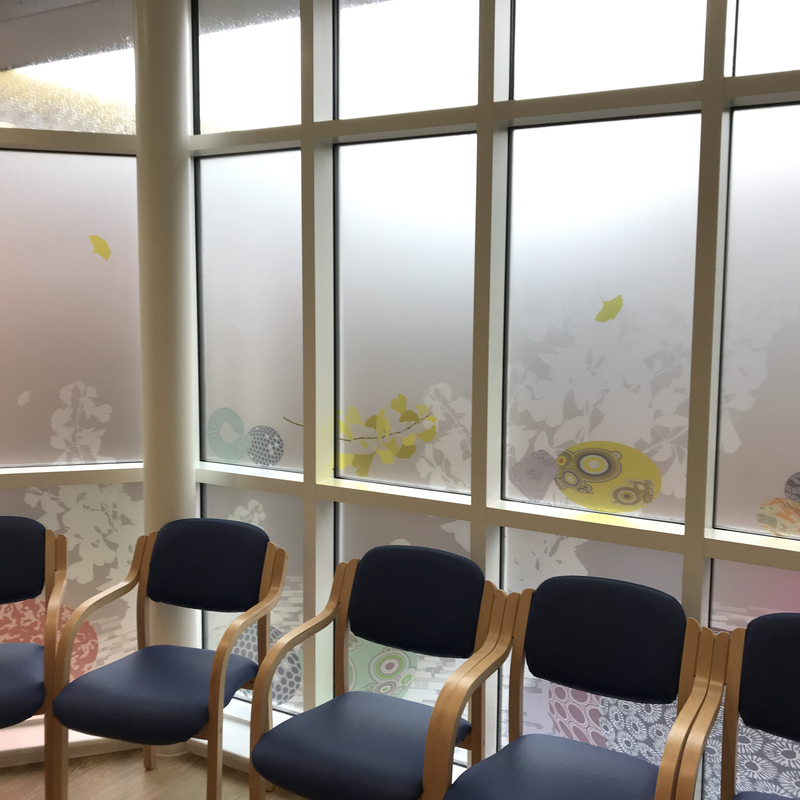 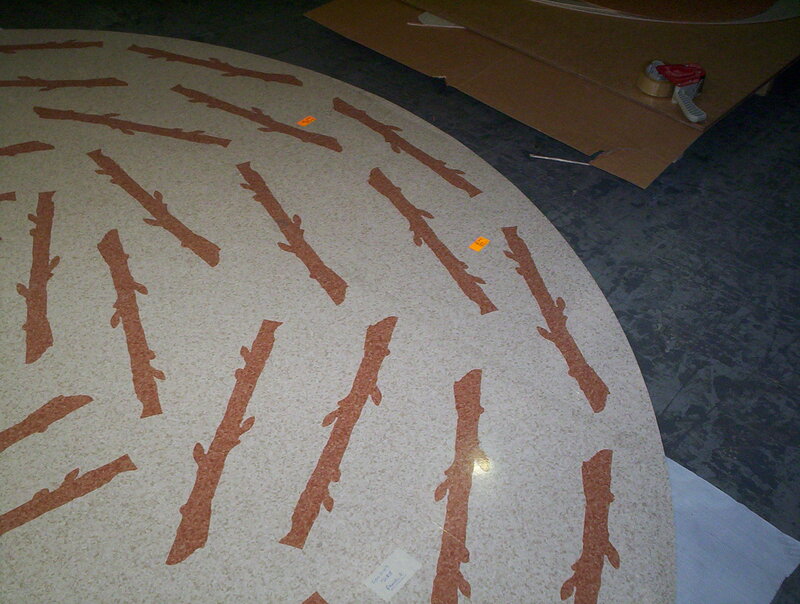 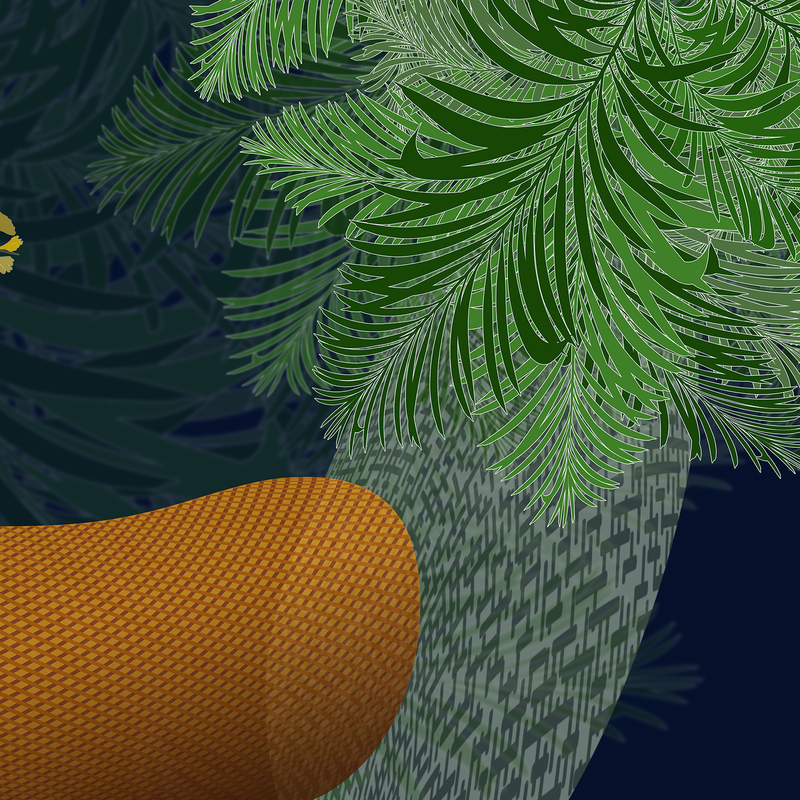 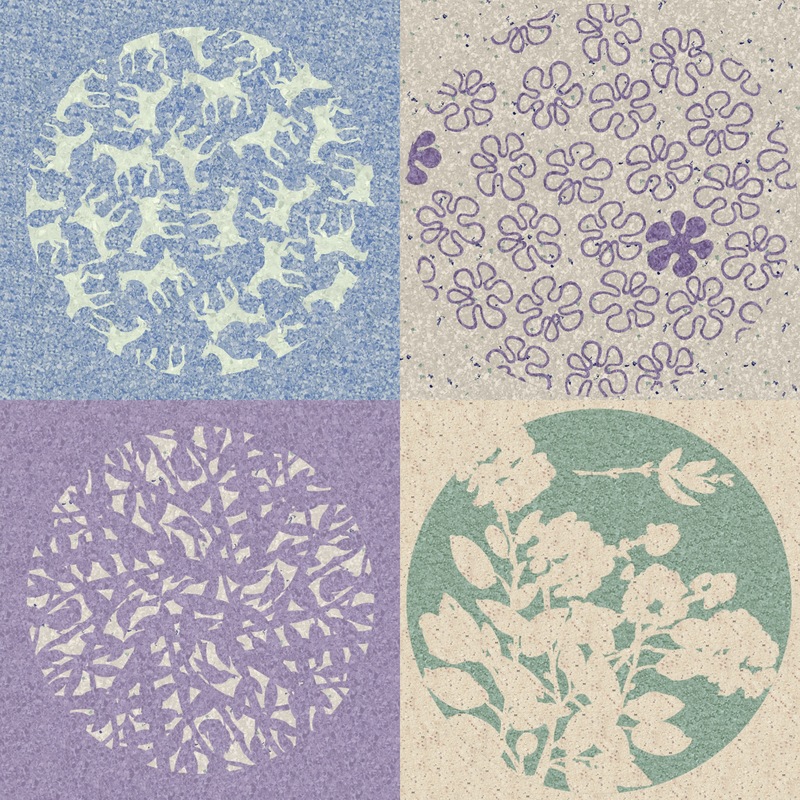 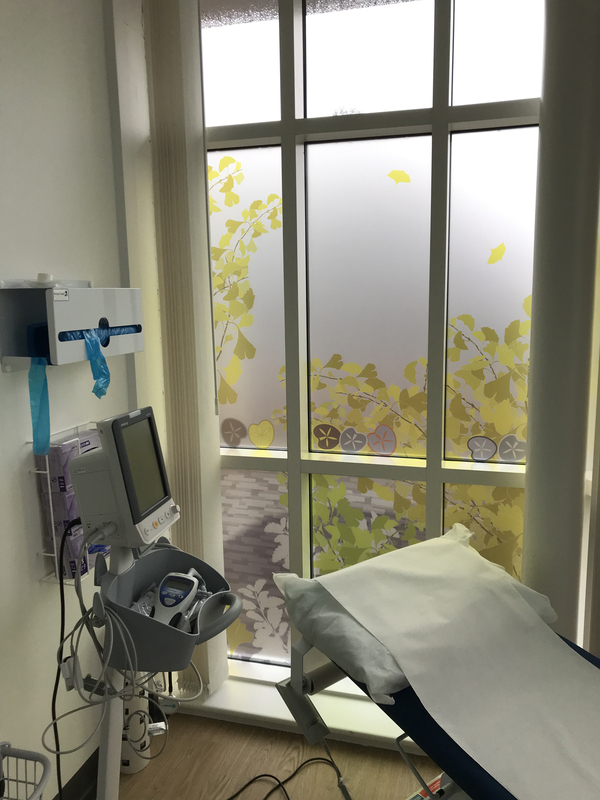 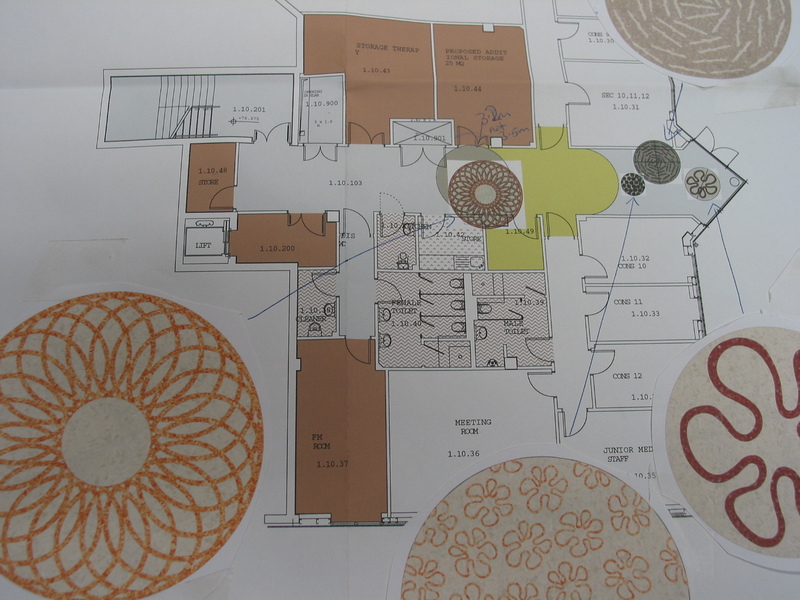 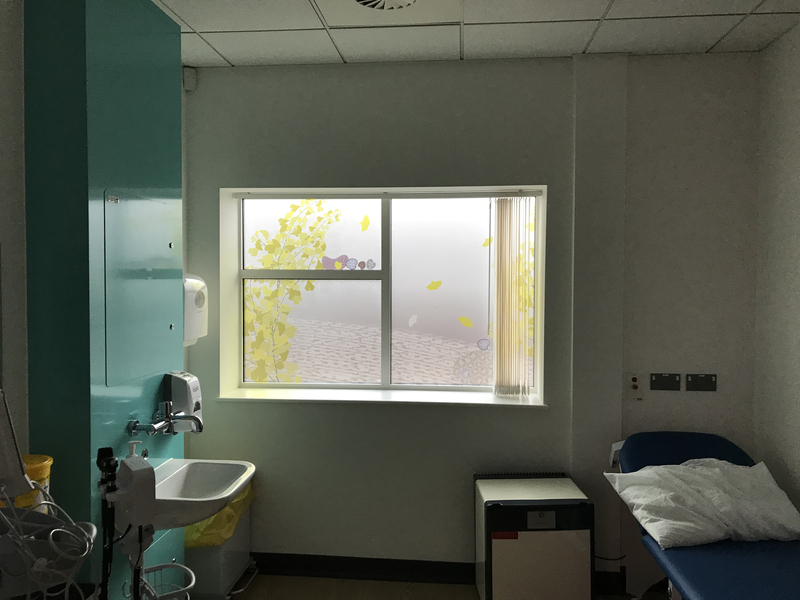 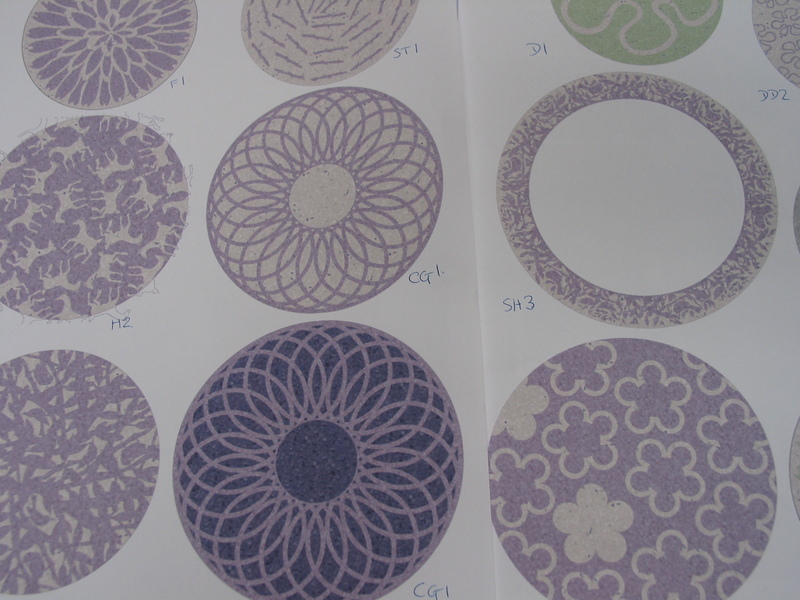 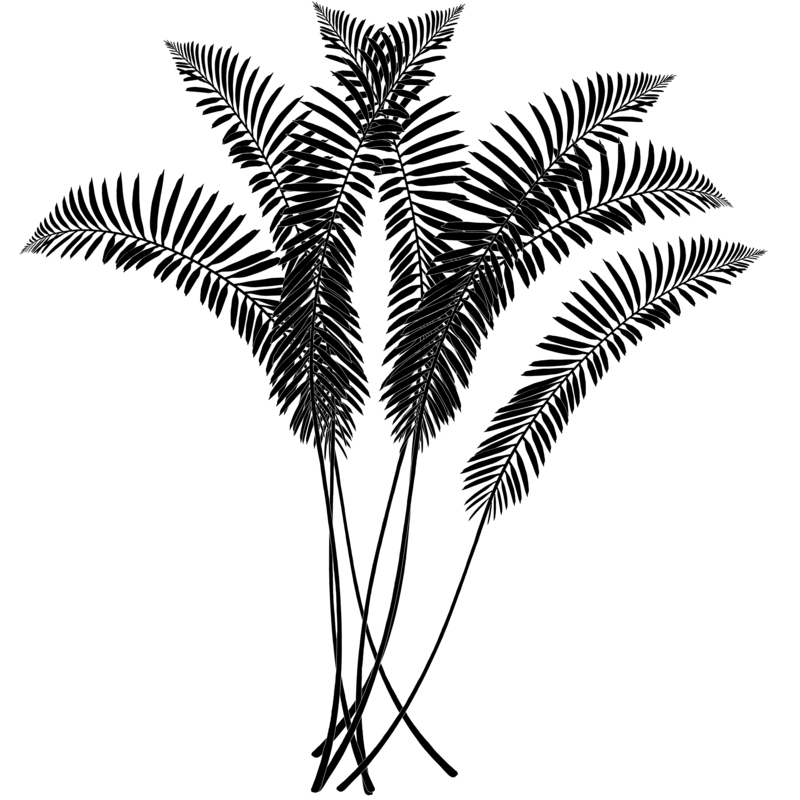 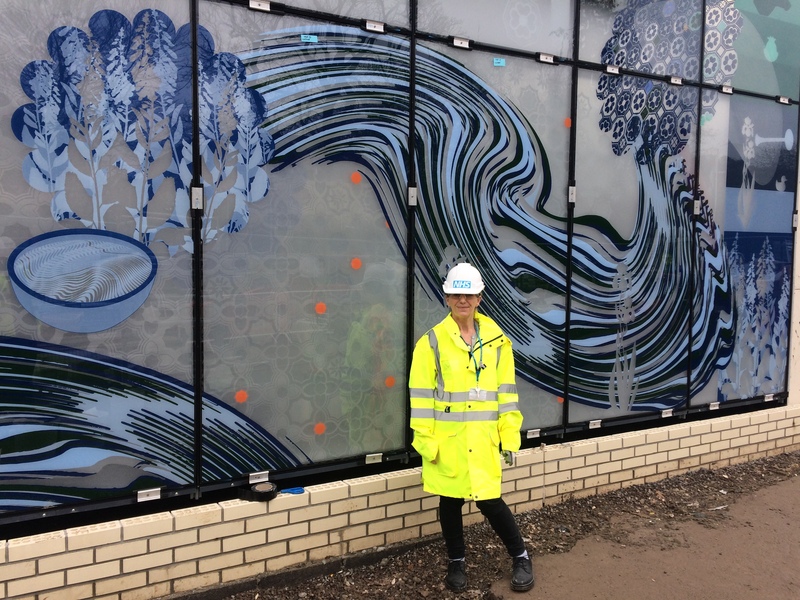 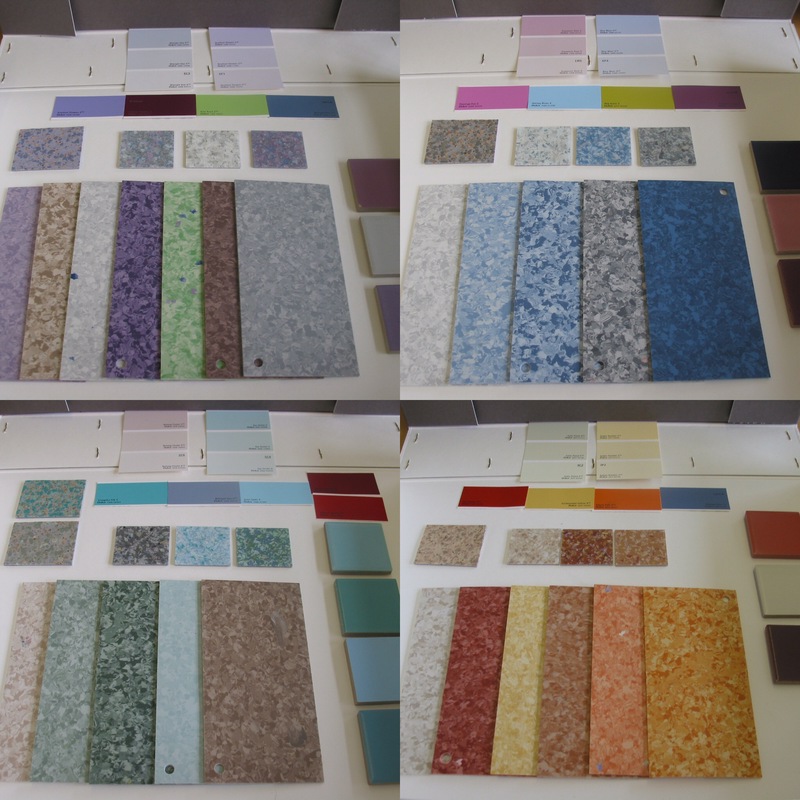 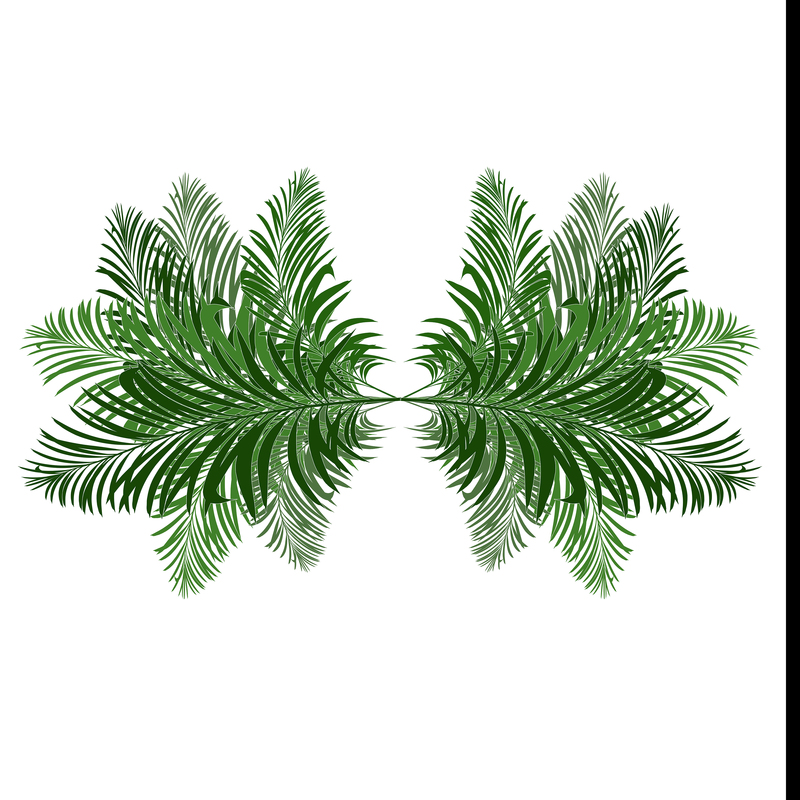 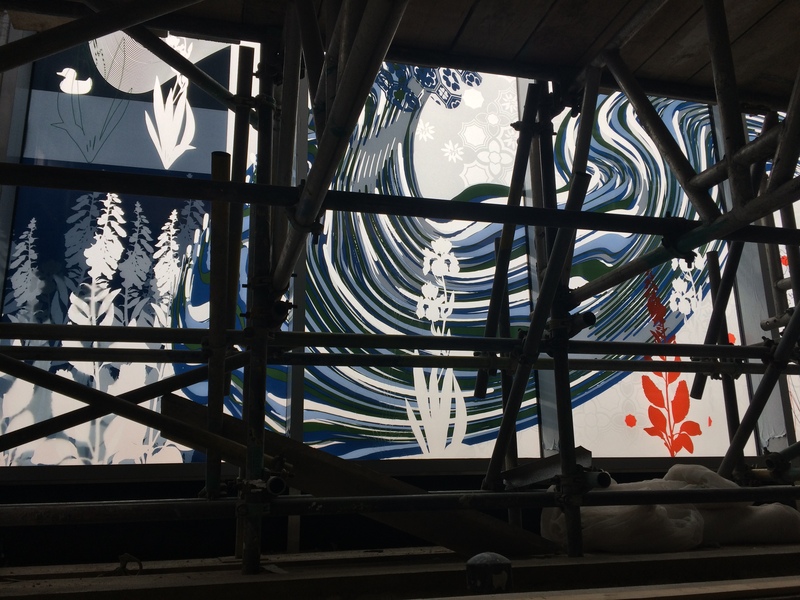 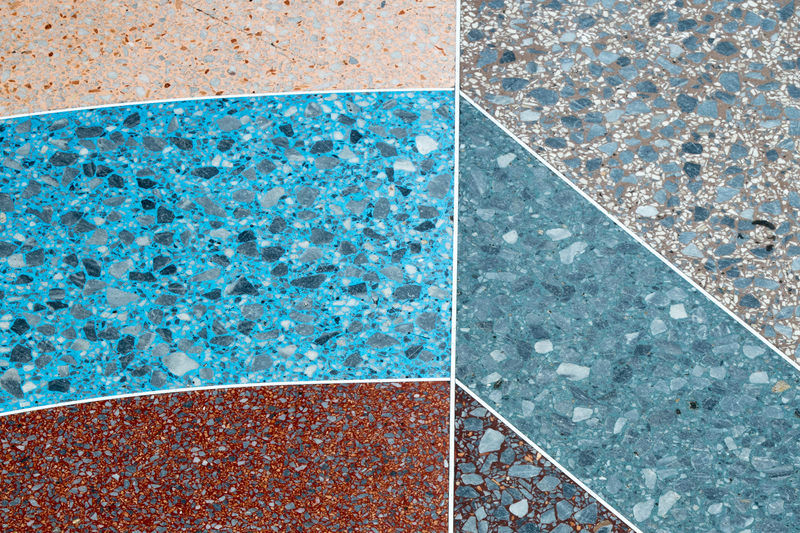 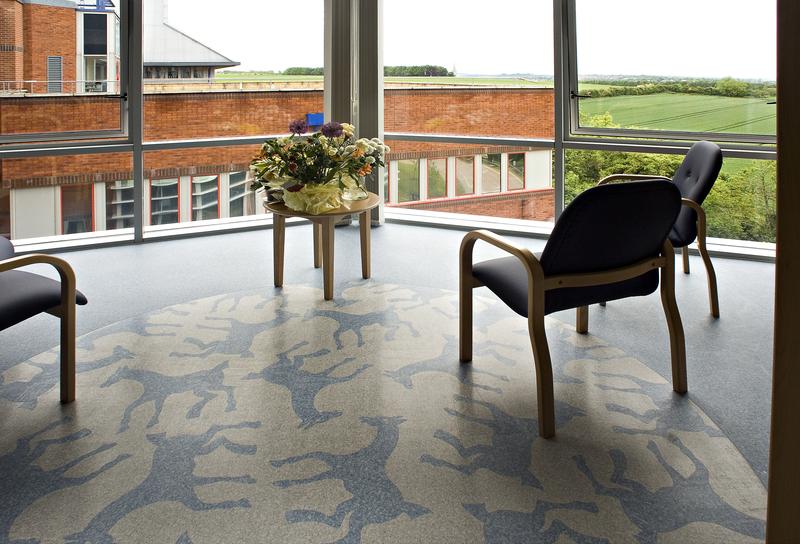 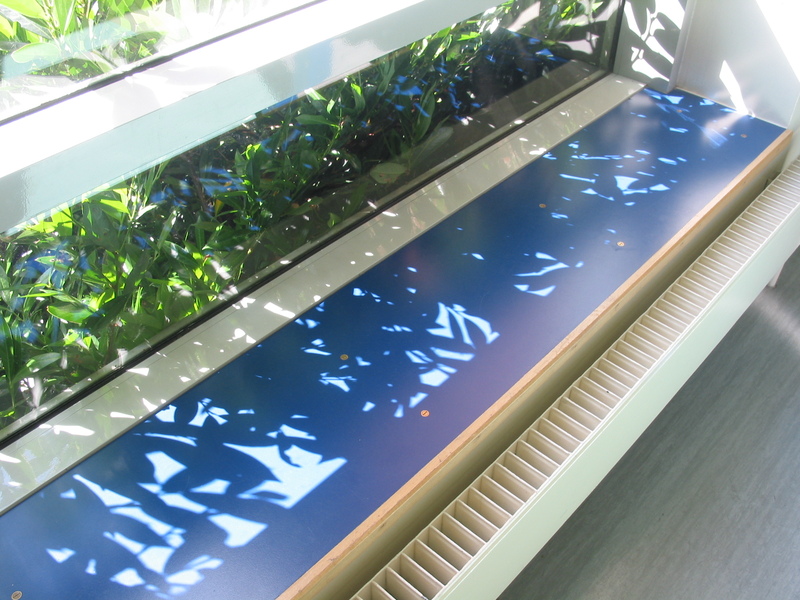 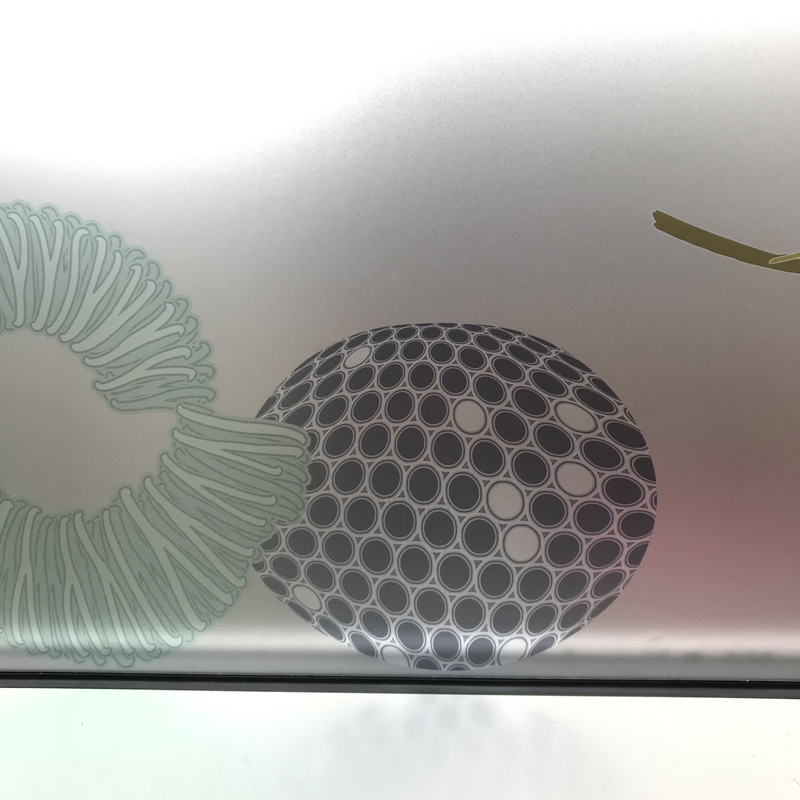 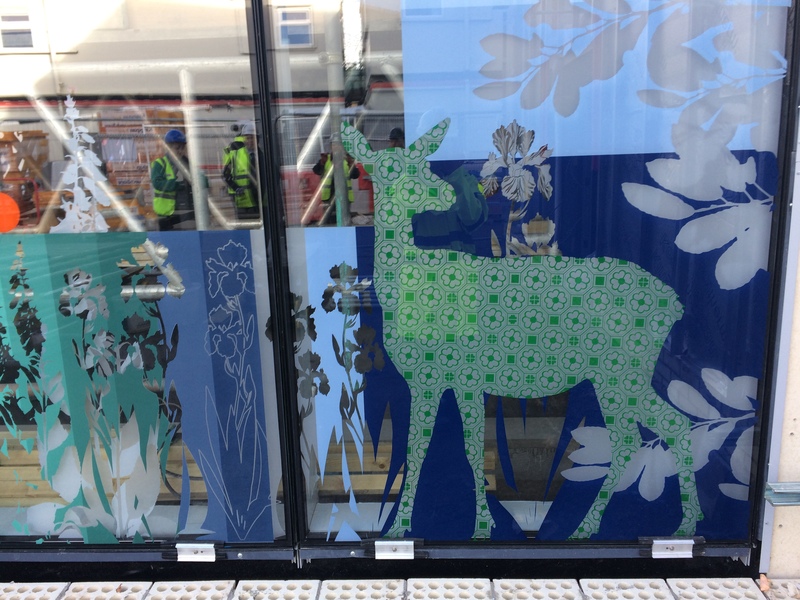 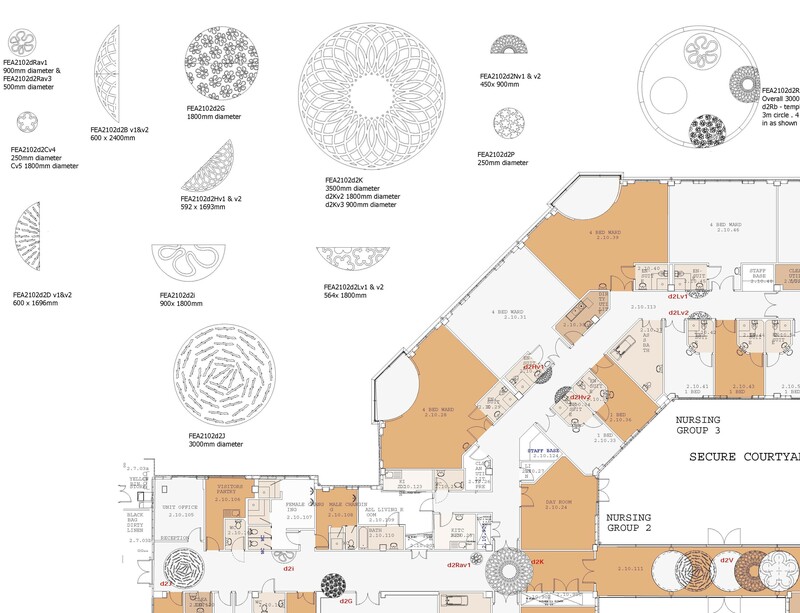 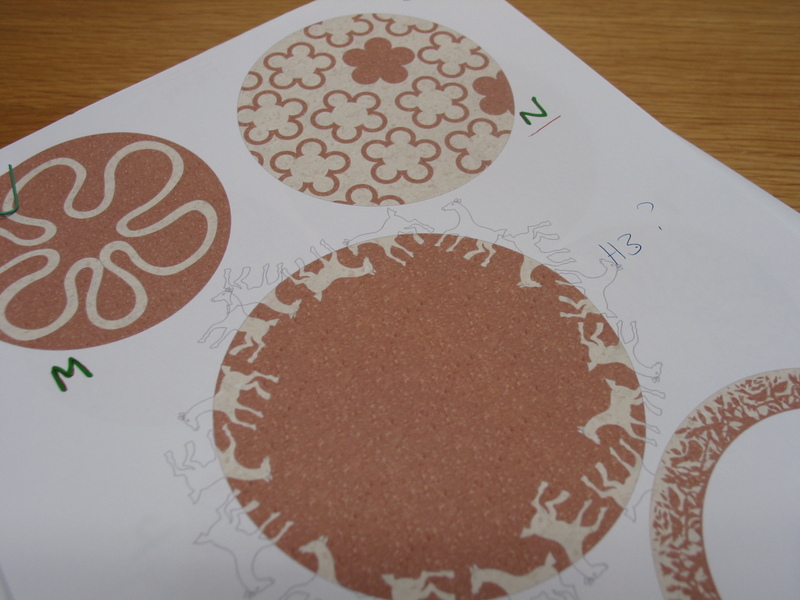 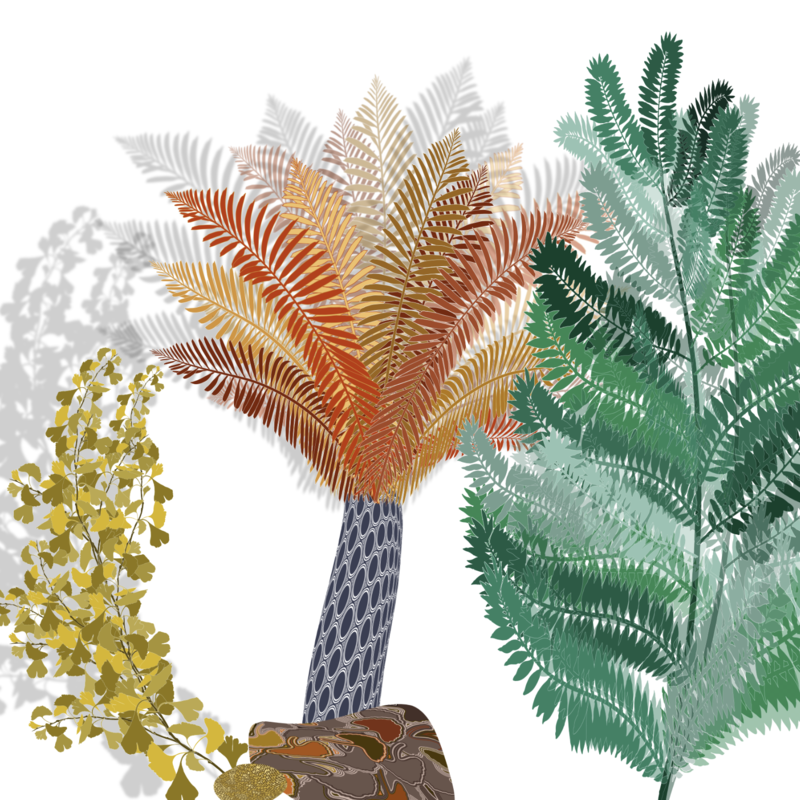 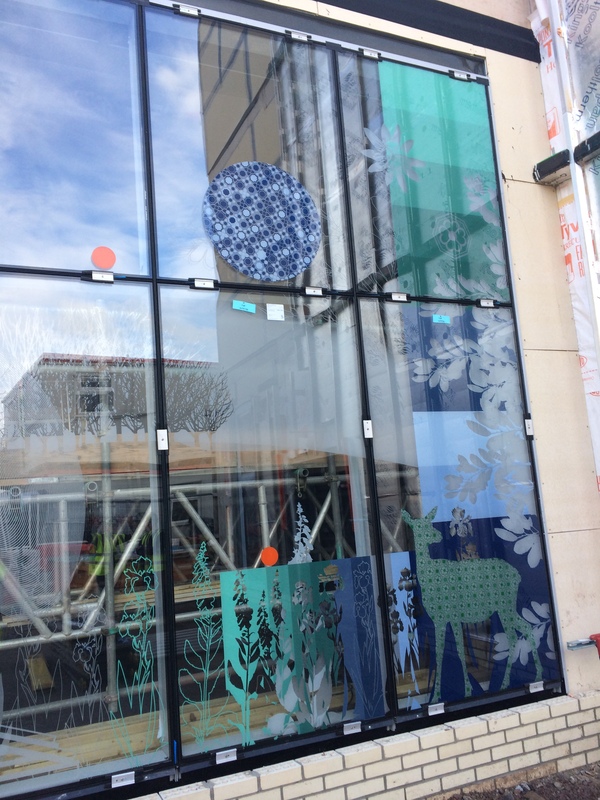 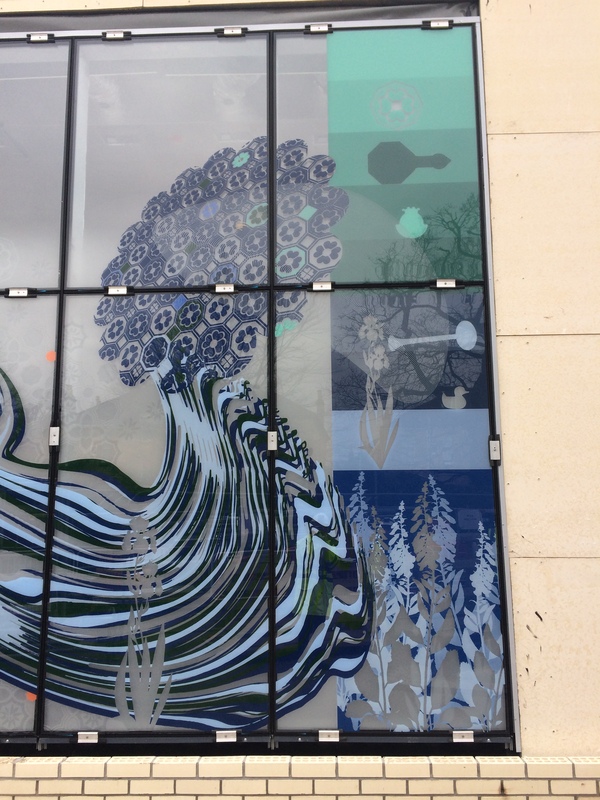 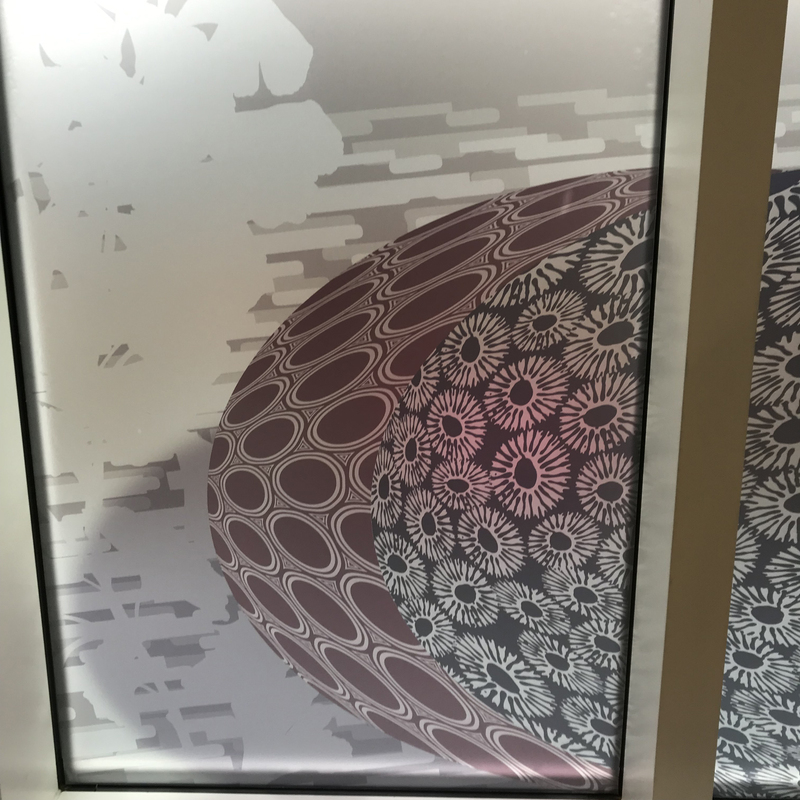 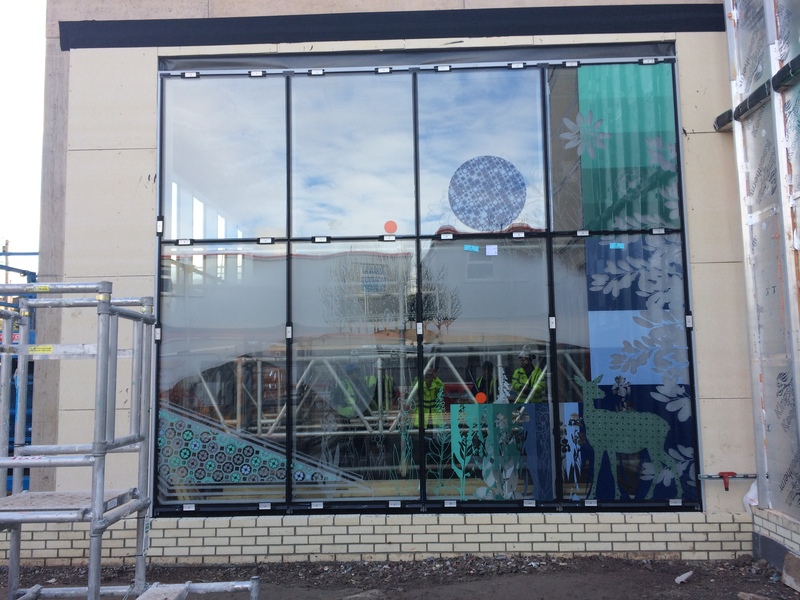 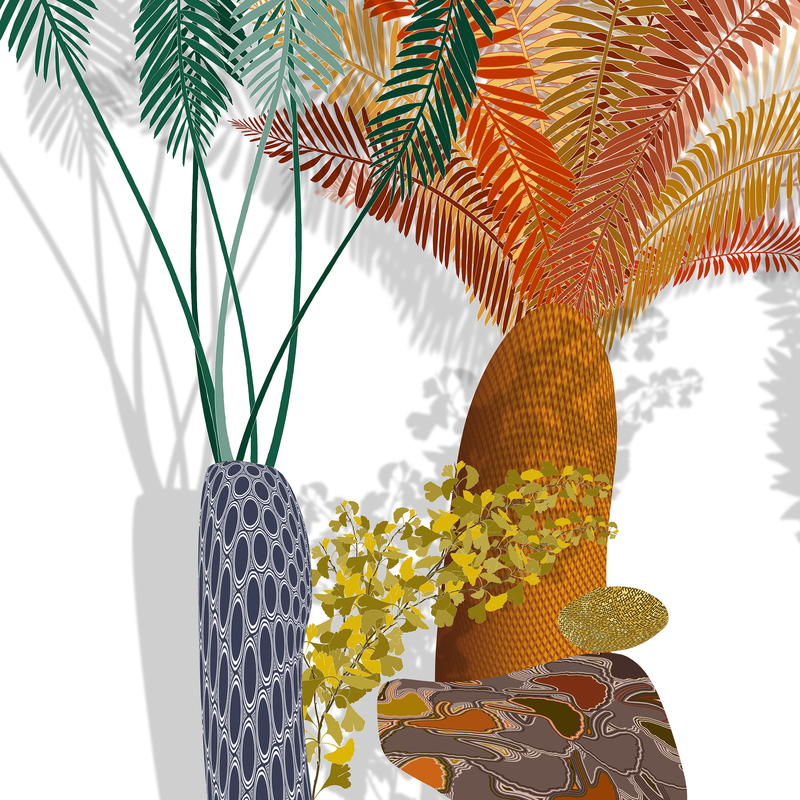 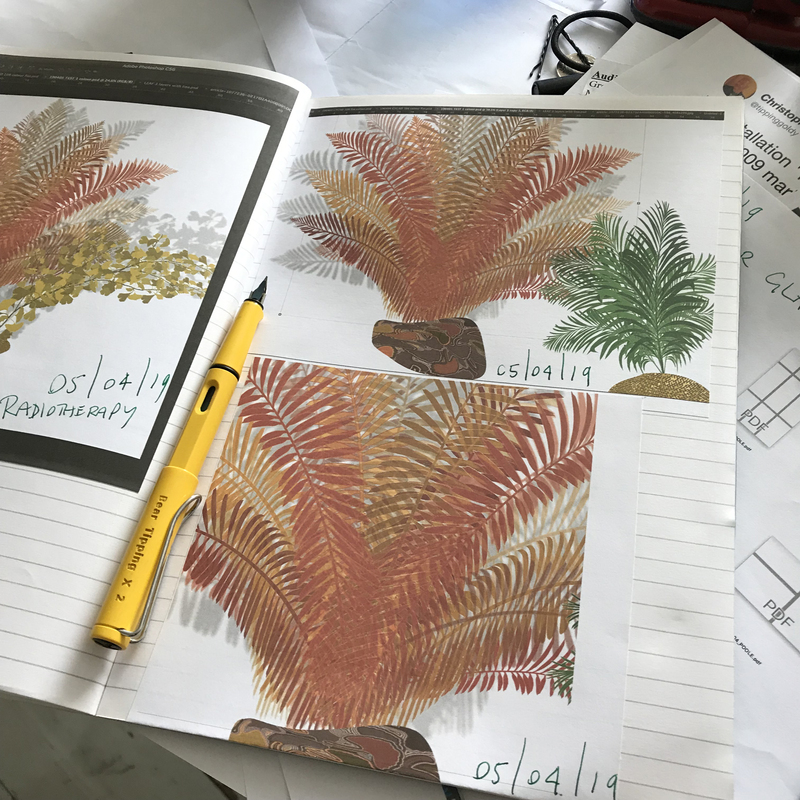 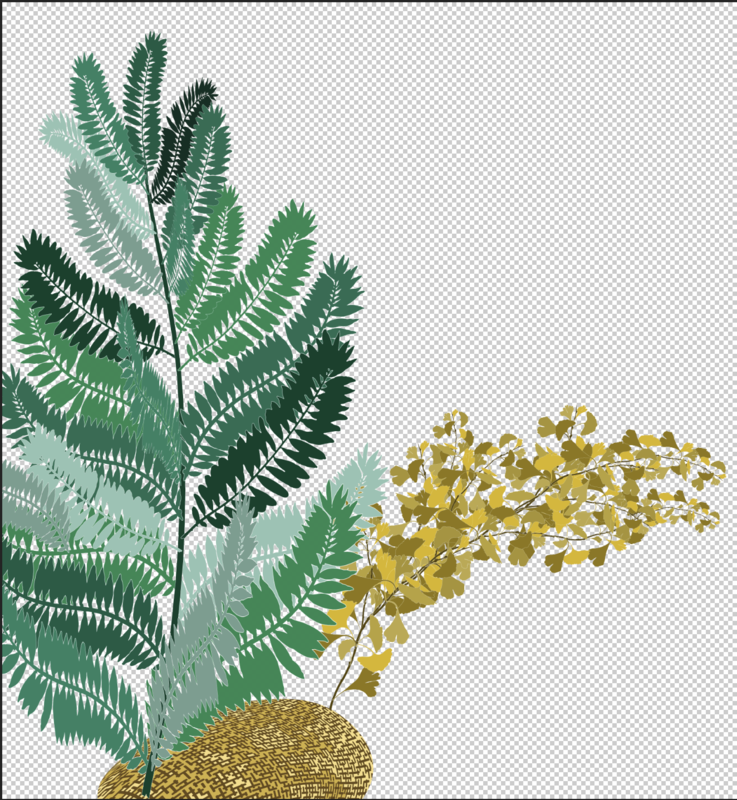 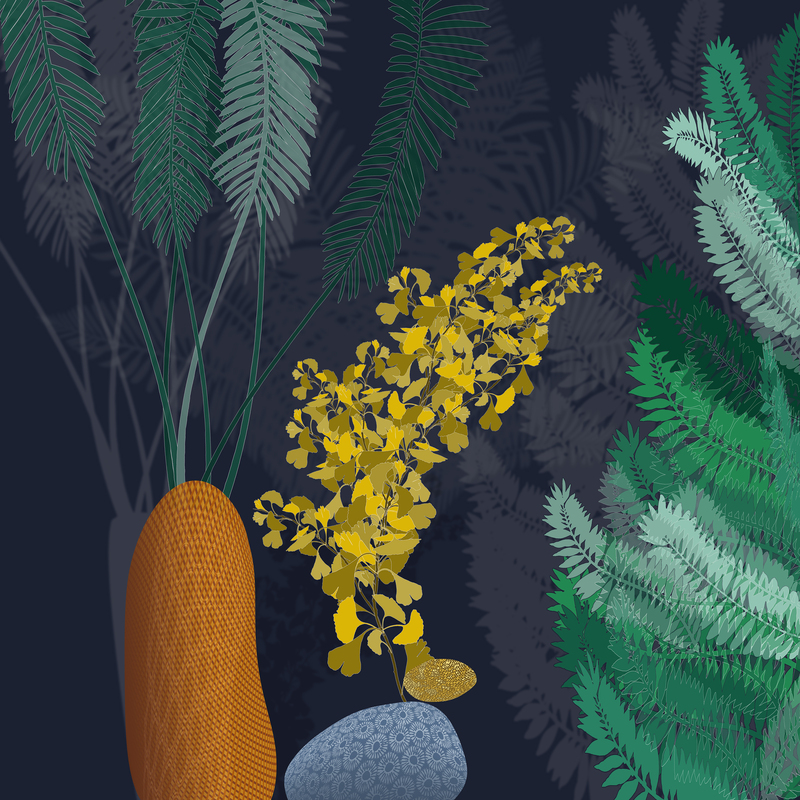 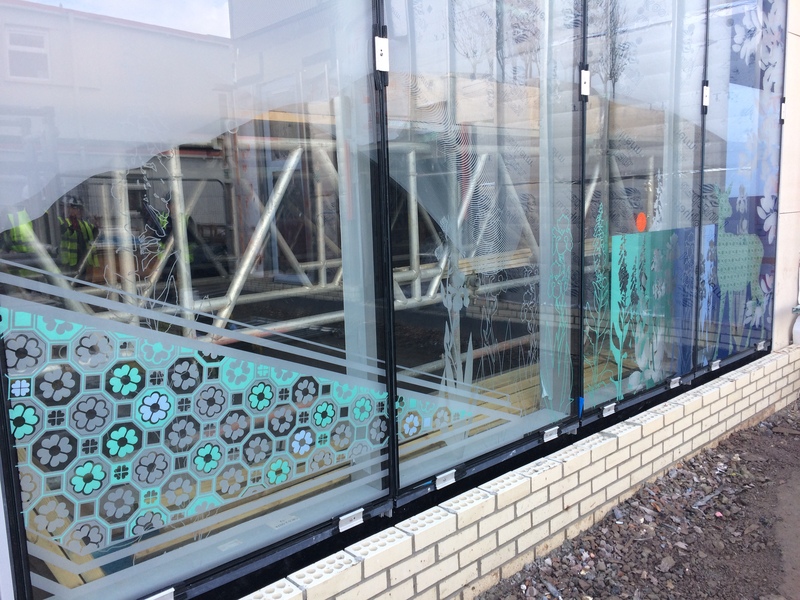 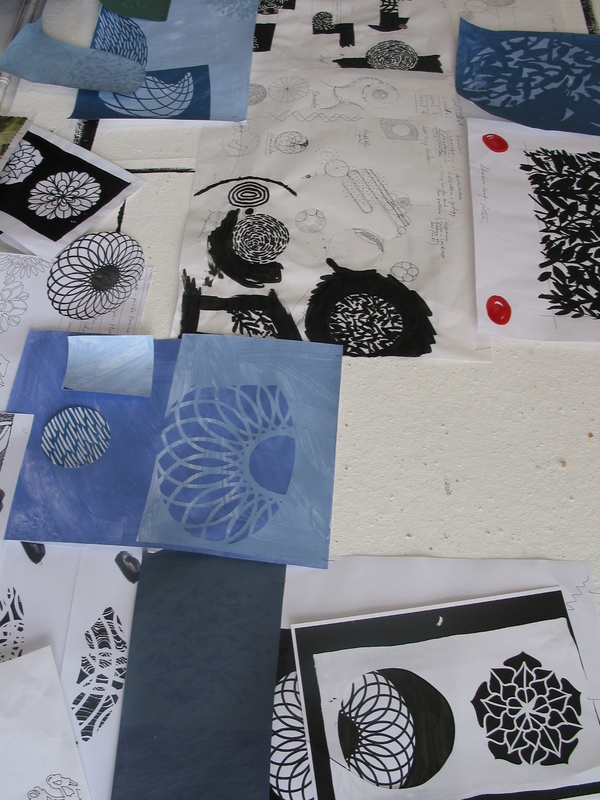 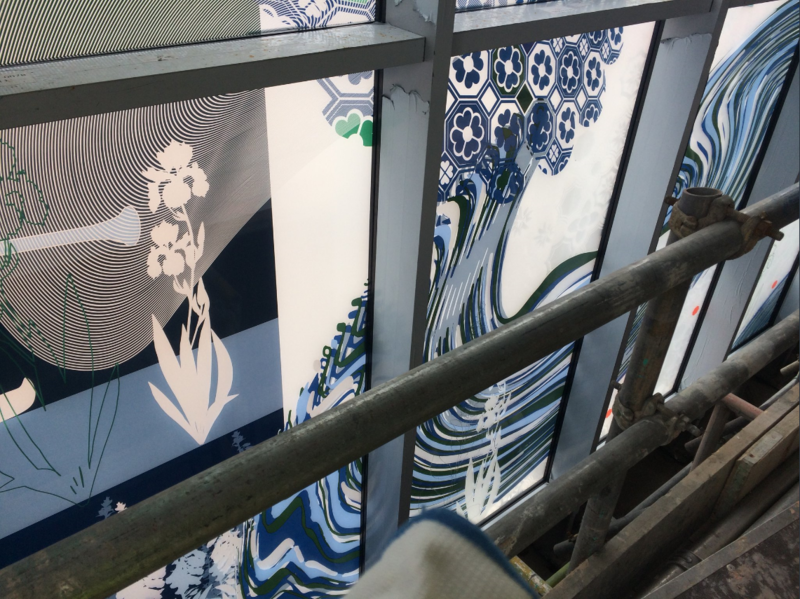 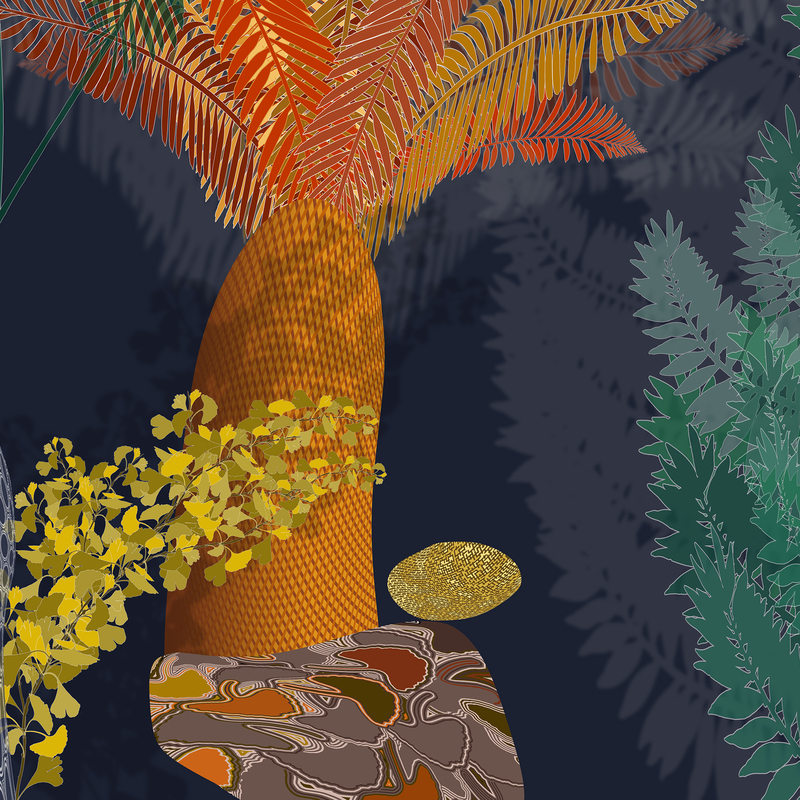 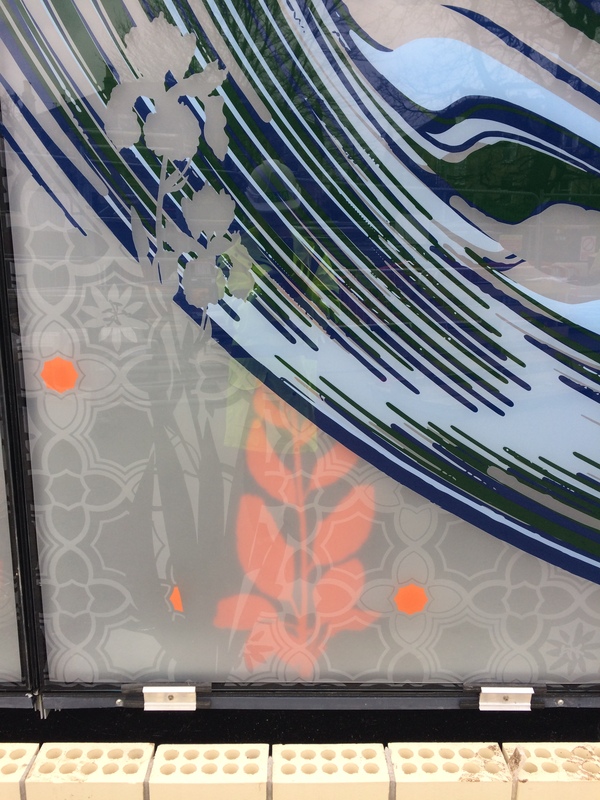 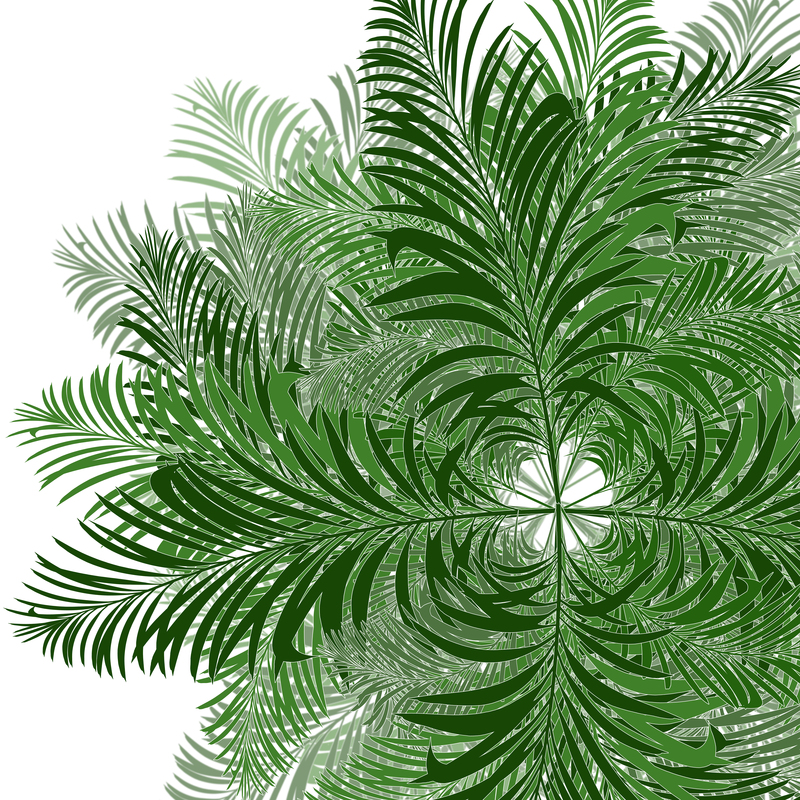 Inspired by Jurassic plant fossils, such as Cycads, Tree Ferns, Magnolias, Monkey Puzzle and Gingko, the ideas are developing by way of a distinct colour palette and abstract pattern-making too, as well as looking to incorporate and blend in with the glazing artworks of the Outpatient Unit on the first floor, which were completed late in December 2018. 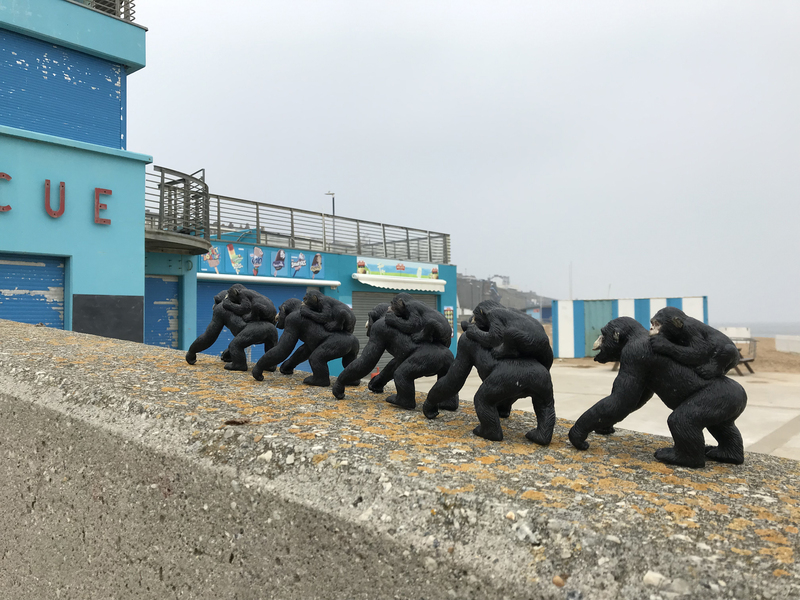 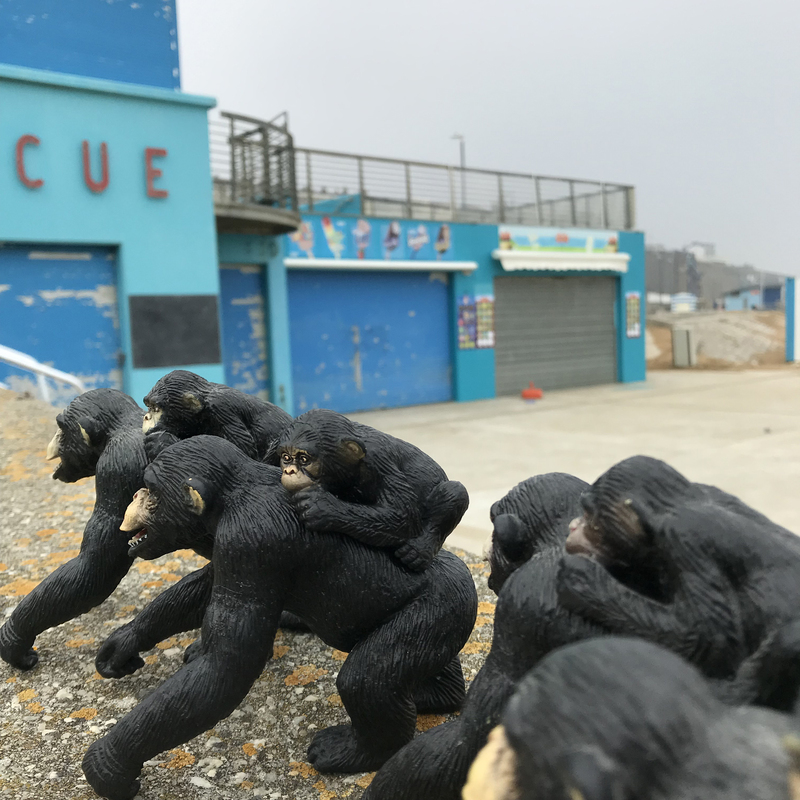 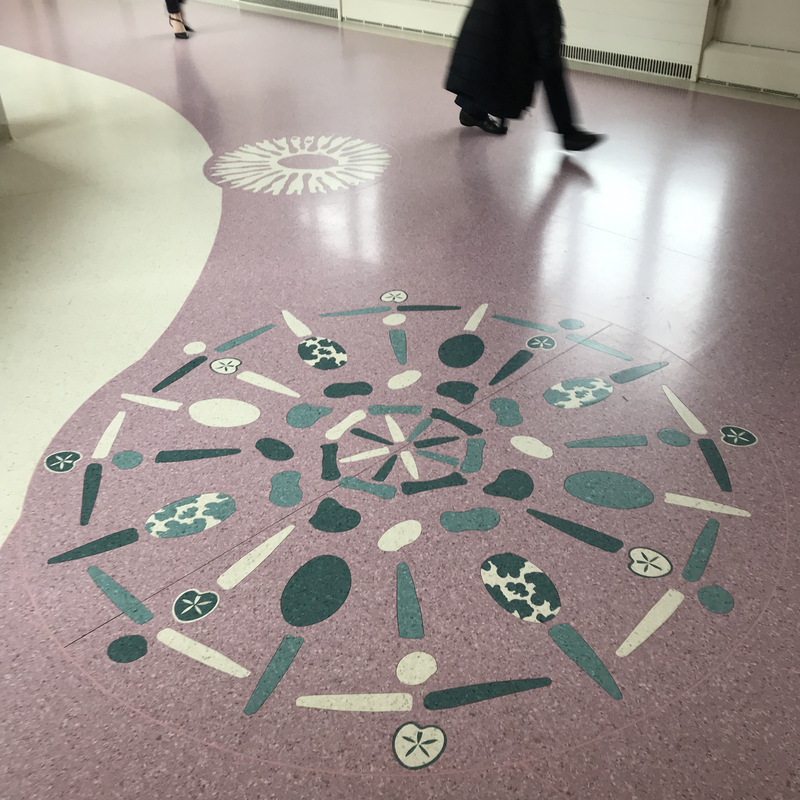 Although the two floors deliver independent services via Poole Hospital and Dorset County Hospitals, it is important that from the outside particularly, the artwork links the two floors and presents a united front elevation to all those visiting & working on this site. 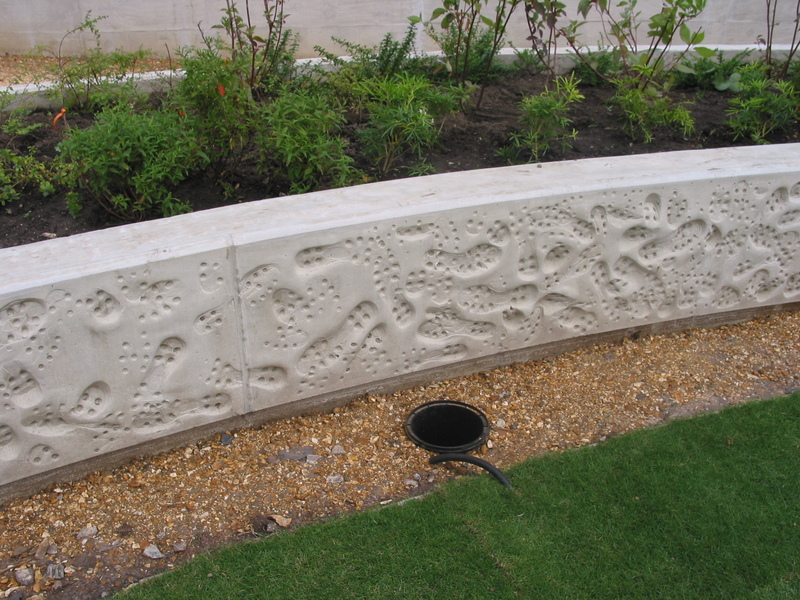 The Jurassic Coast and the Abbotsbury Sub-Tropical Gardens, have both been influential. 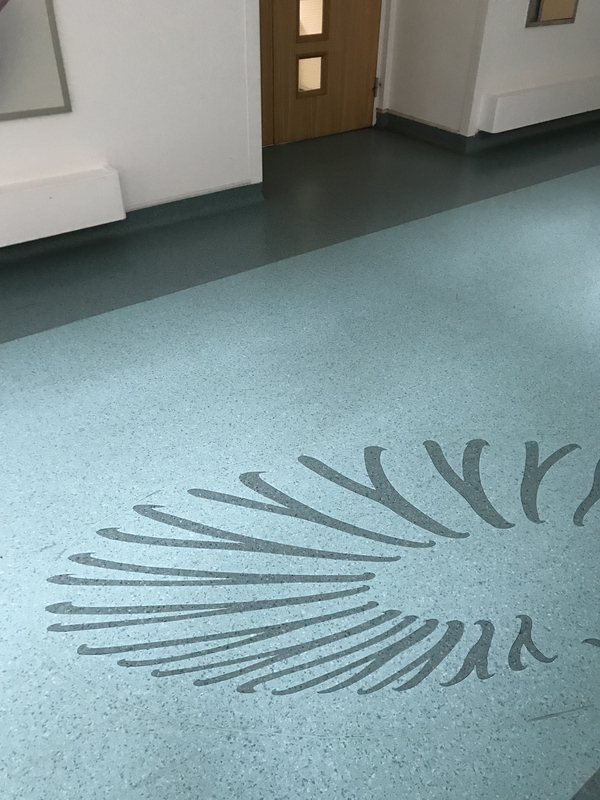 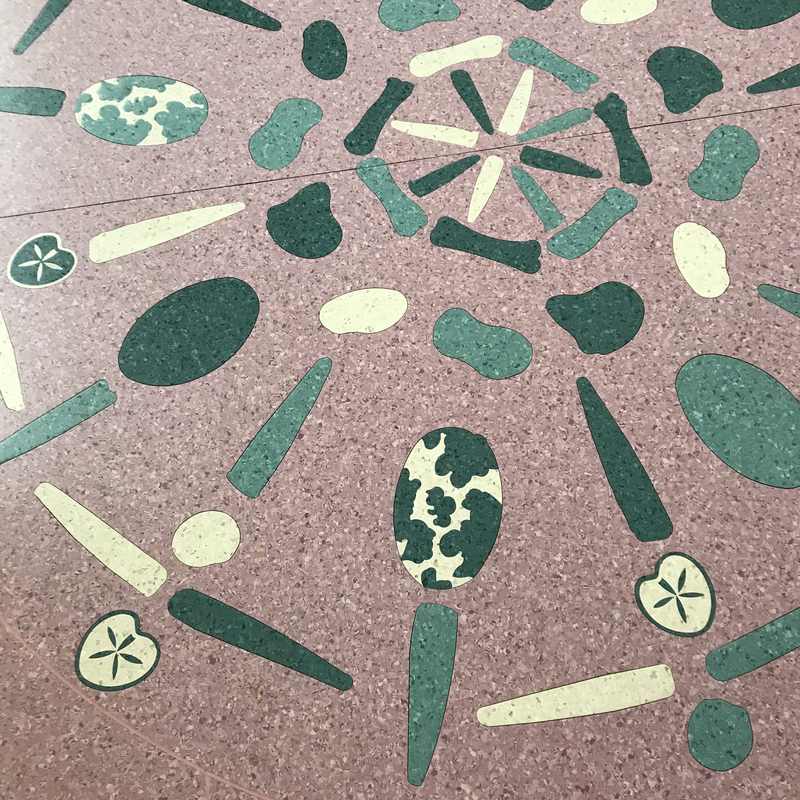 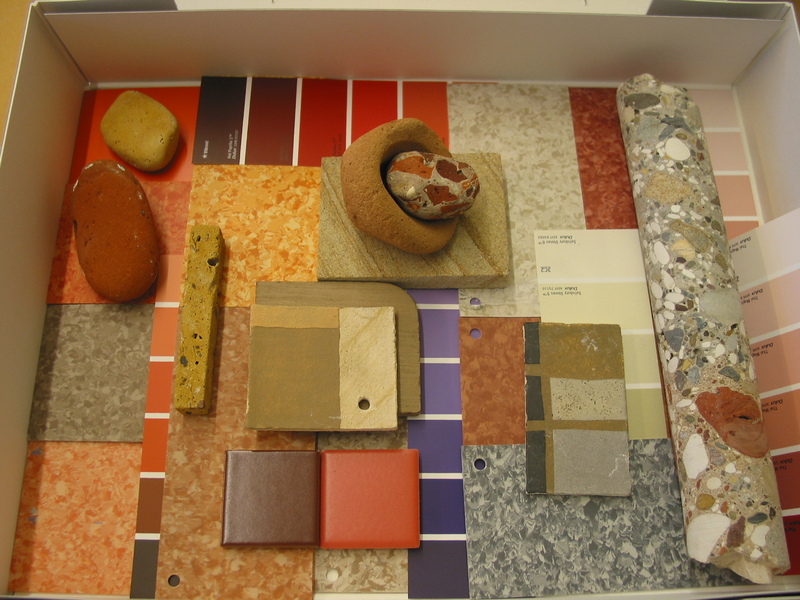 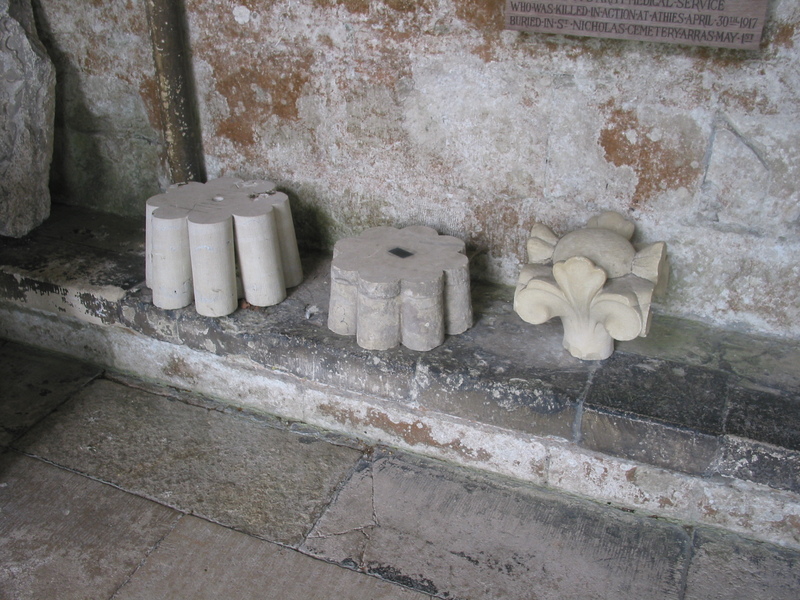 The coastal geology has been a particular fascination, with stones and fossils being very much the theme of the first floor Outpatients department. 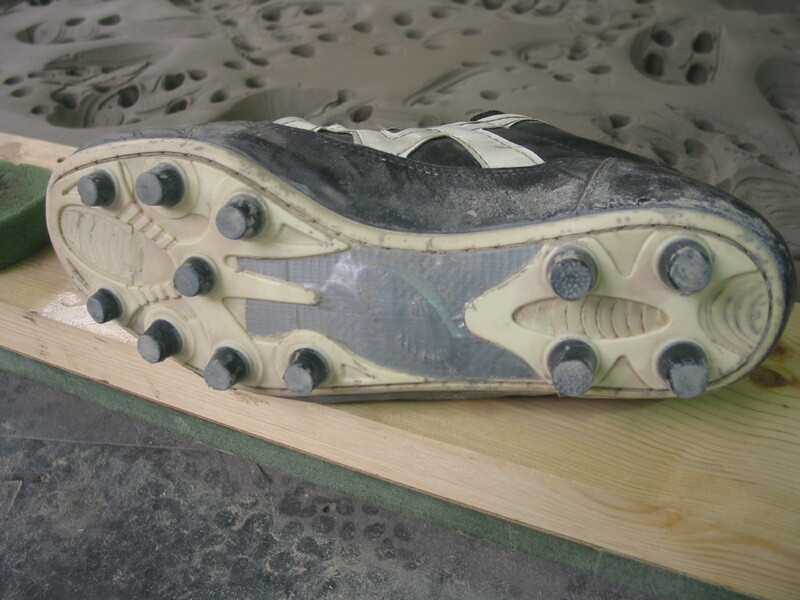 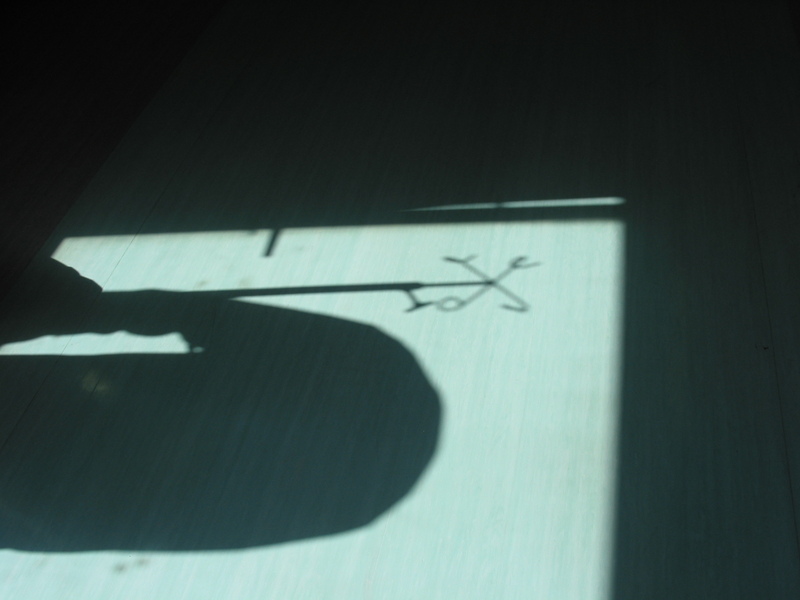 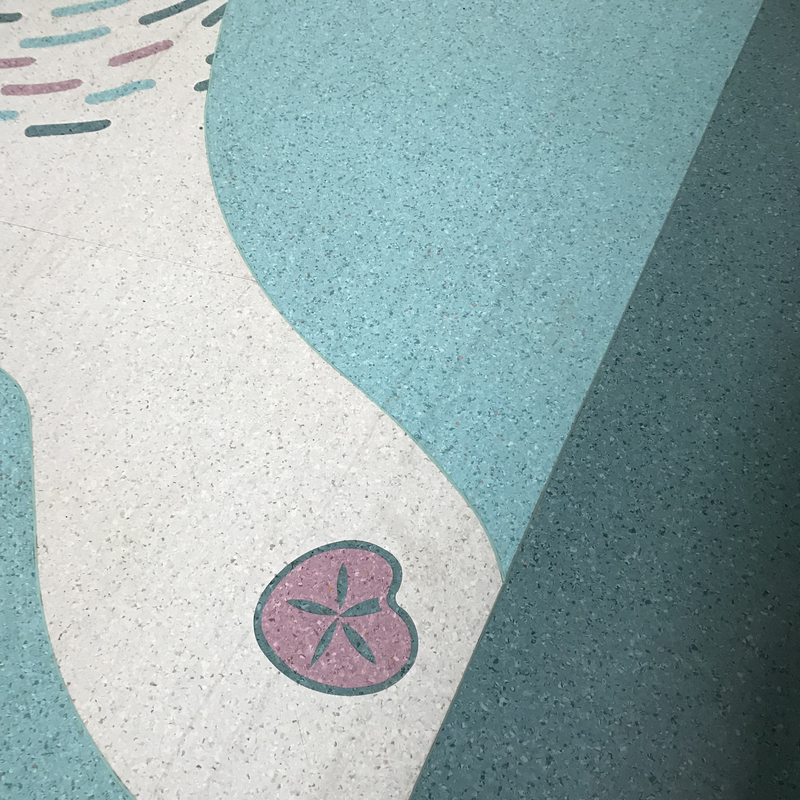 Above: Bespoke inlaid flooring with a Surgeon’s leg. 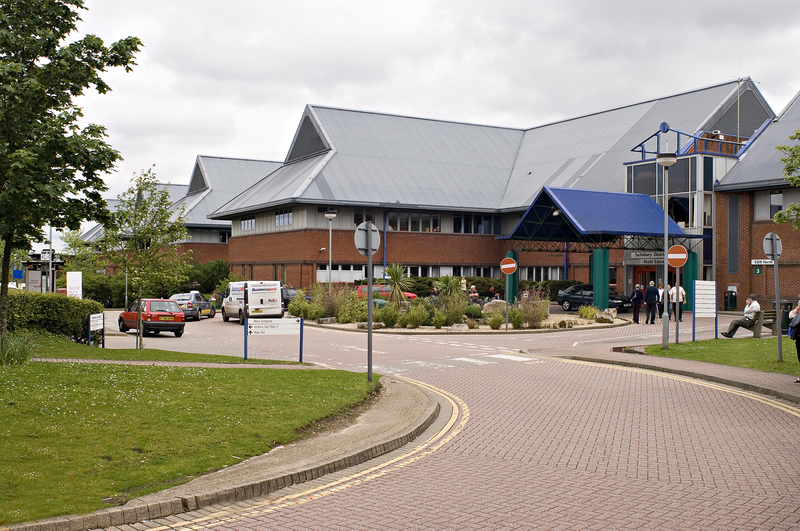 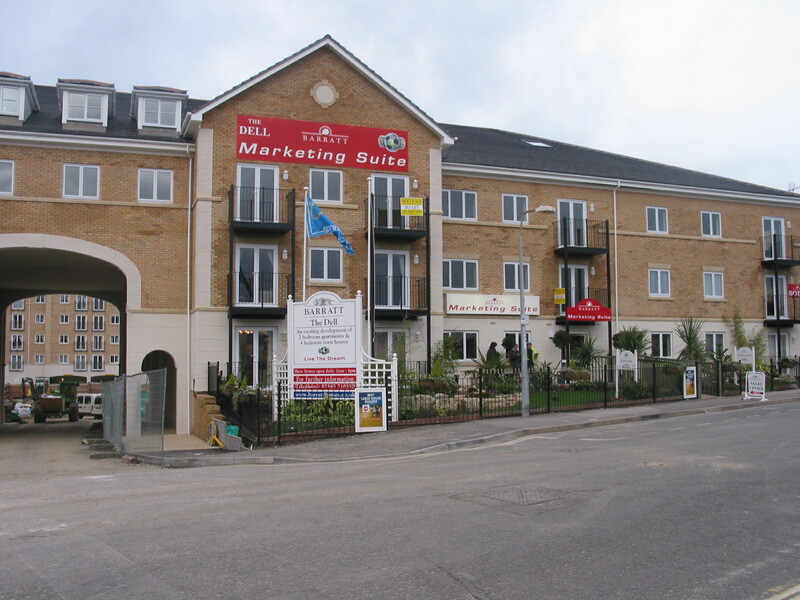 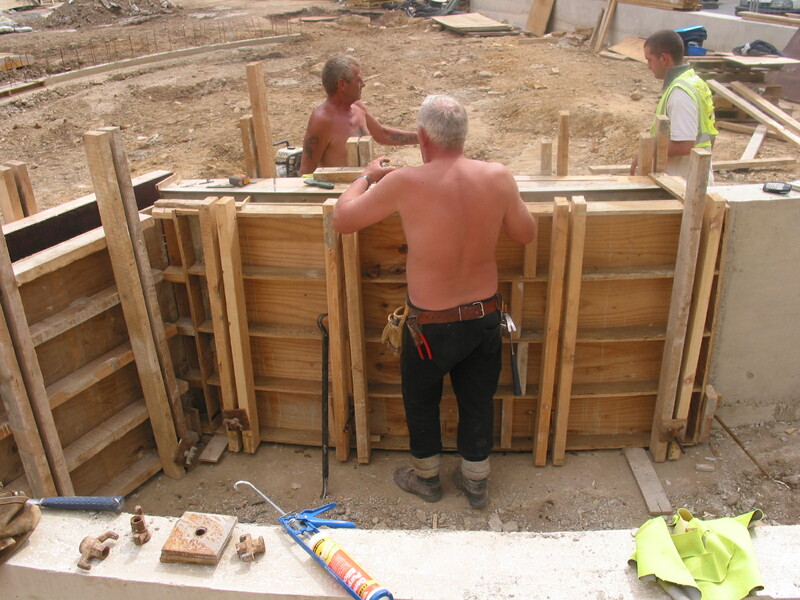 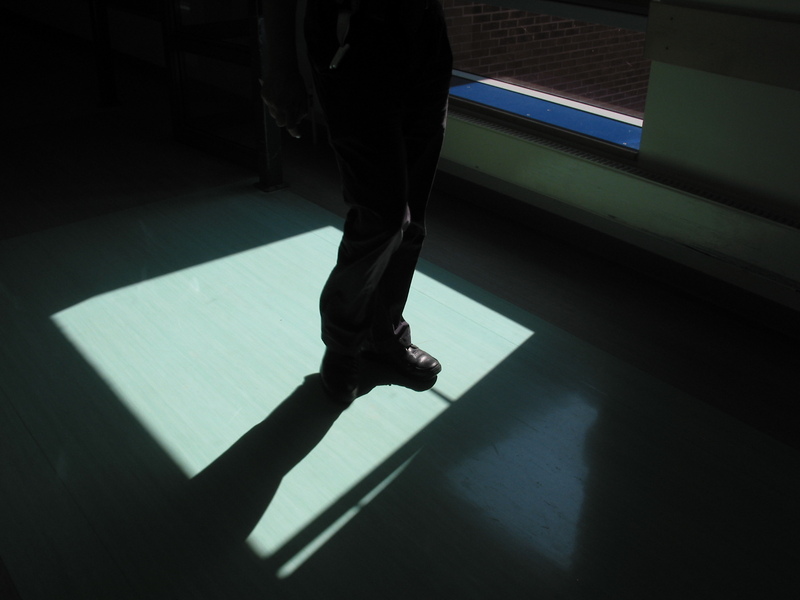 I have worked at Dorset County Hospital on two previous occasions, both memorable. 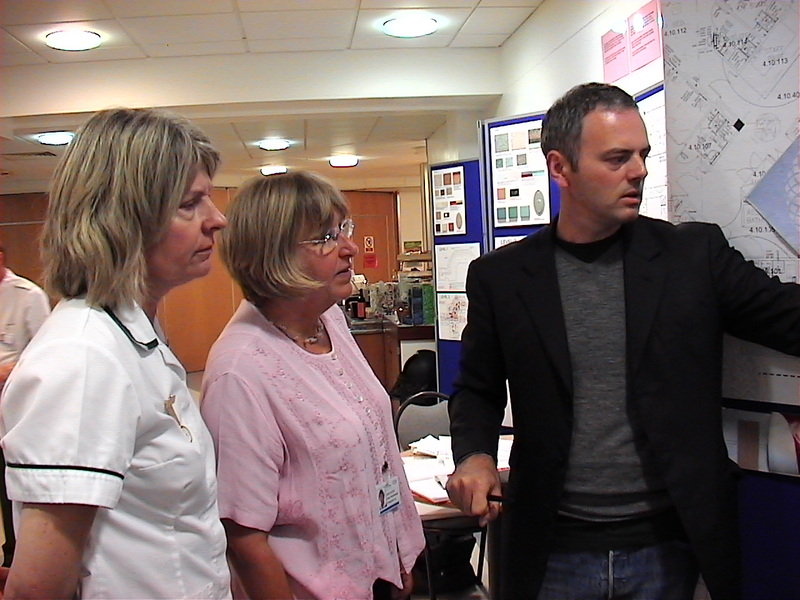 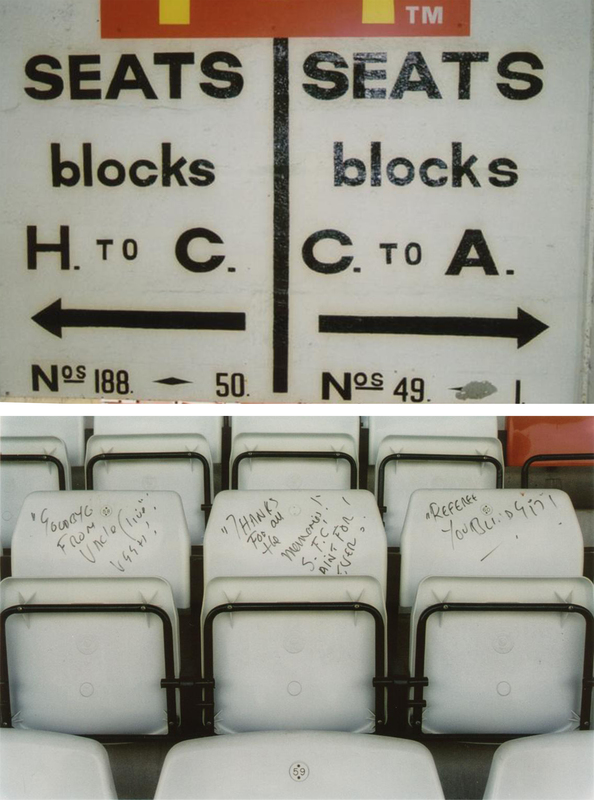 My association with the Trust and its Arts in Hospital Team goes back to 1993, some 26 years! 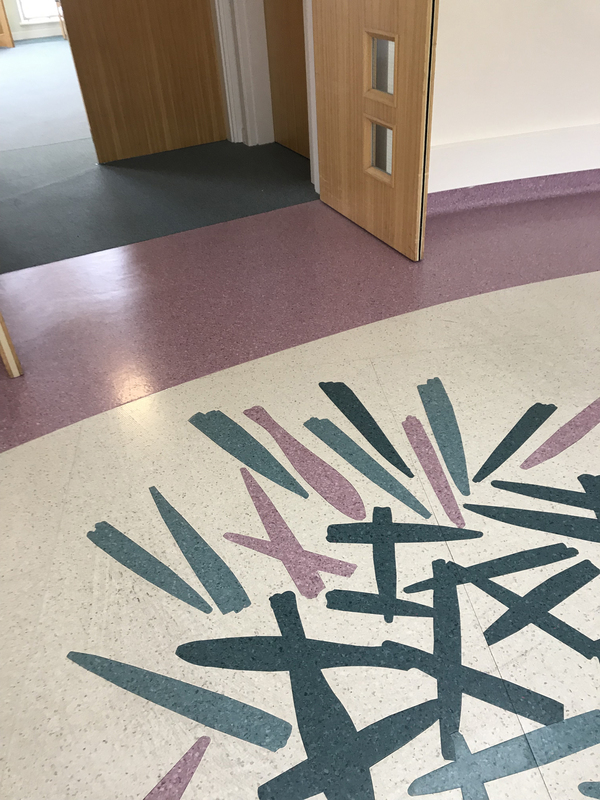 This recent visit to start a new project for the Radiotherapy Unit at the recently completed Robert White Centre, was quite poignant, because I made a concerted effort, whilst there to re-connect and revisit two commissions I had previously created for the Hospital, in 1993 and 2009 respectively. 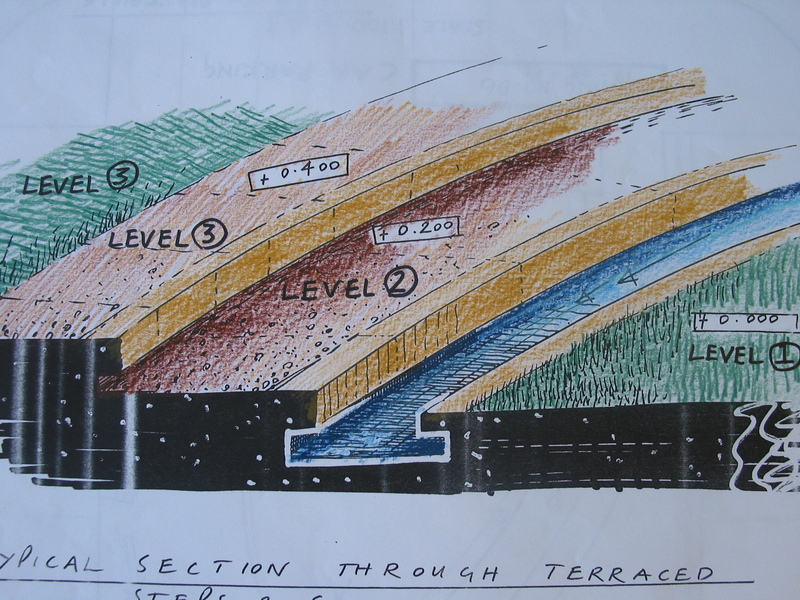 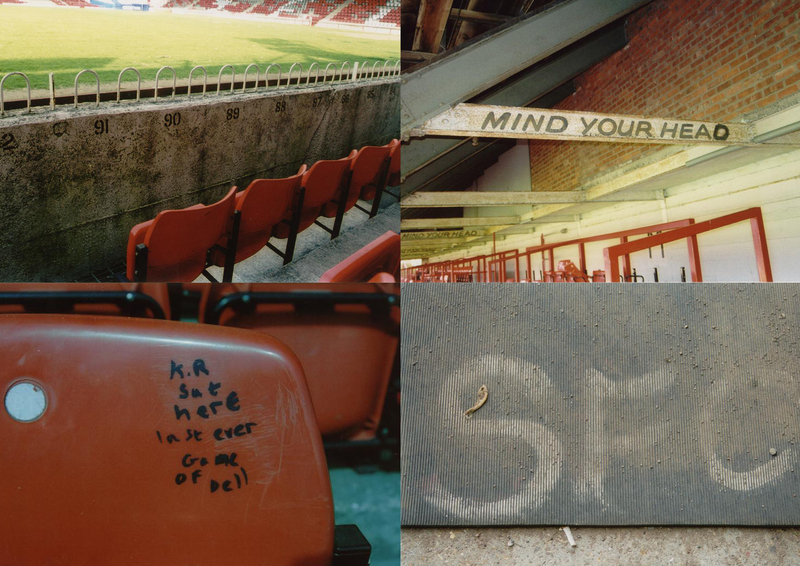 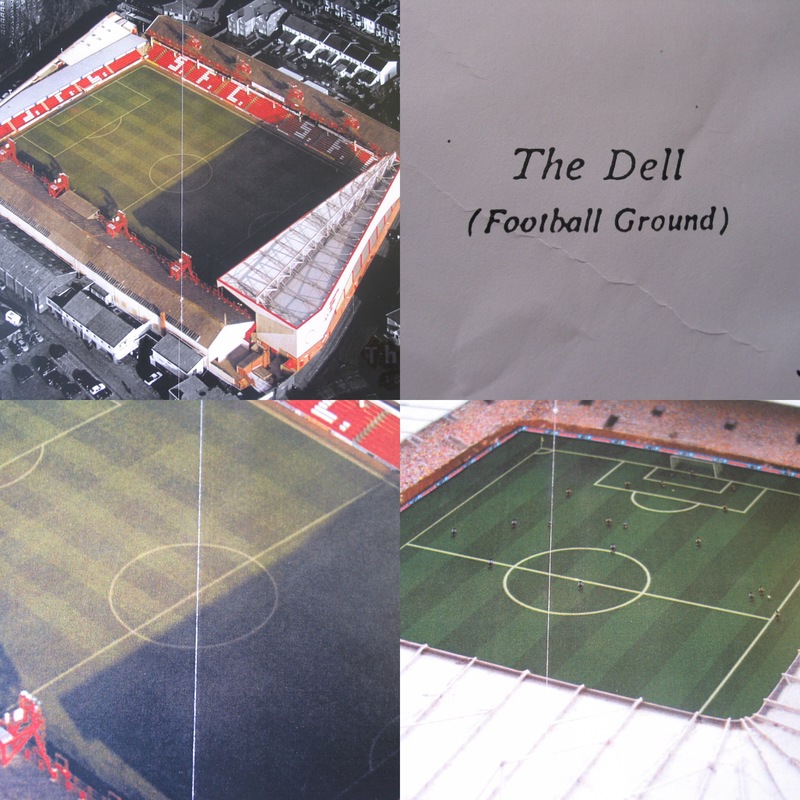 I have deliberately not looked back at the files for these projects, in fact I am not sure I still have the 1993 project on record. 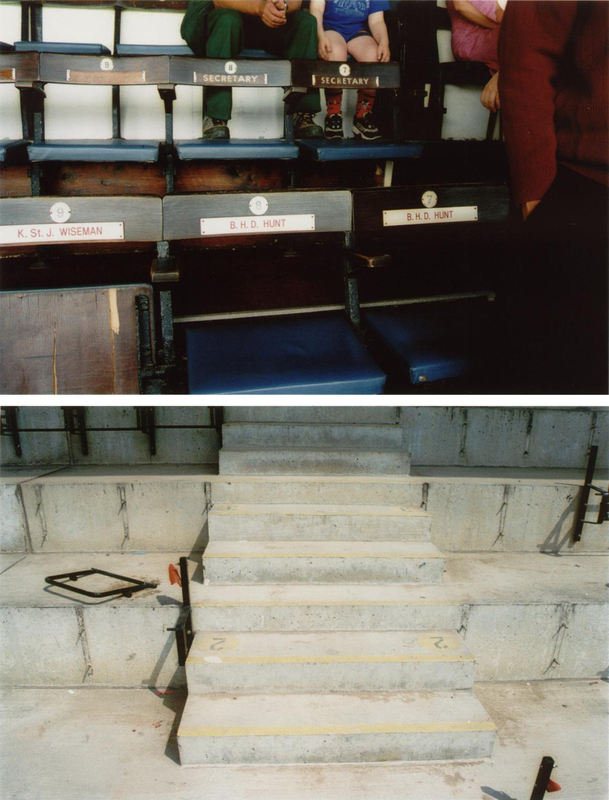 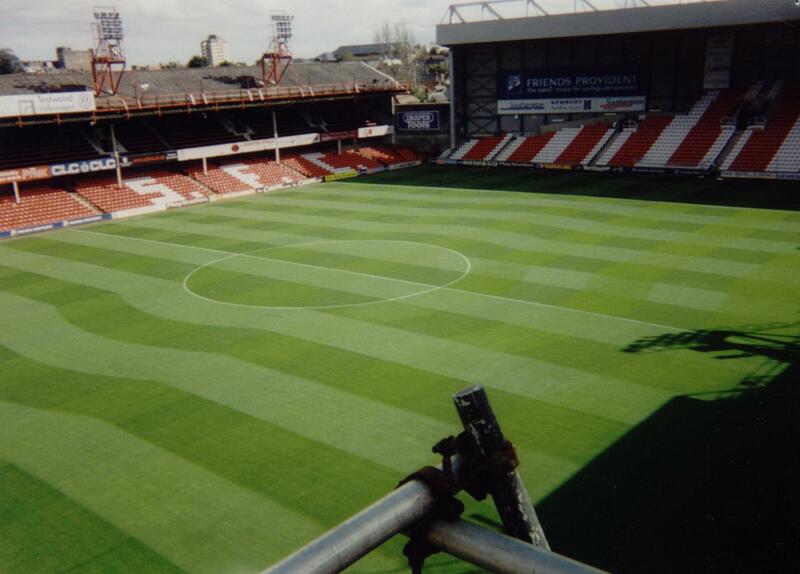 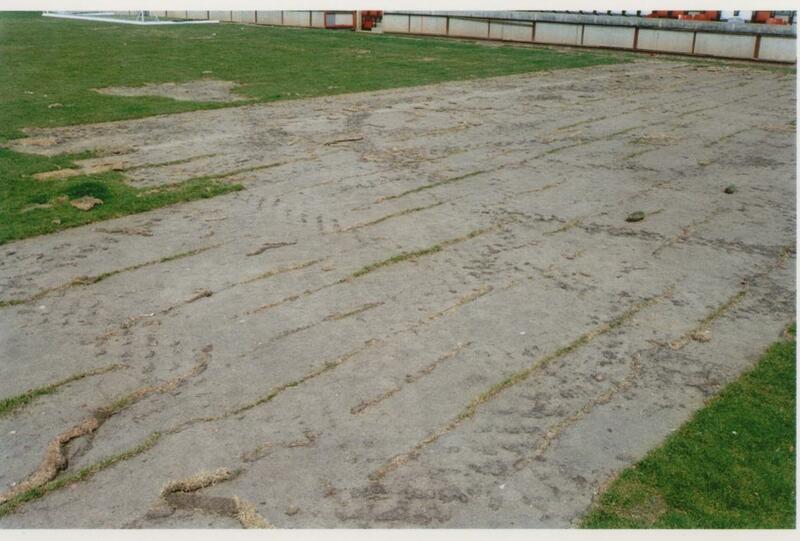 That was definitely pre-digital. 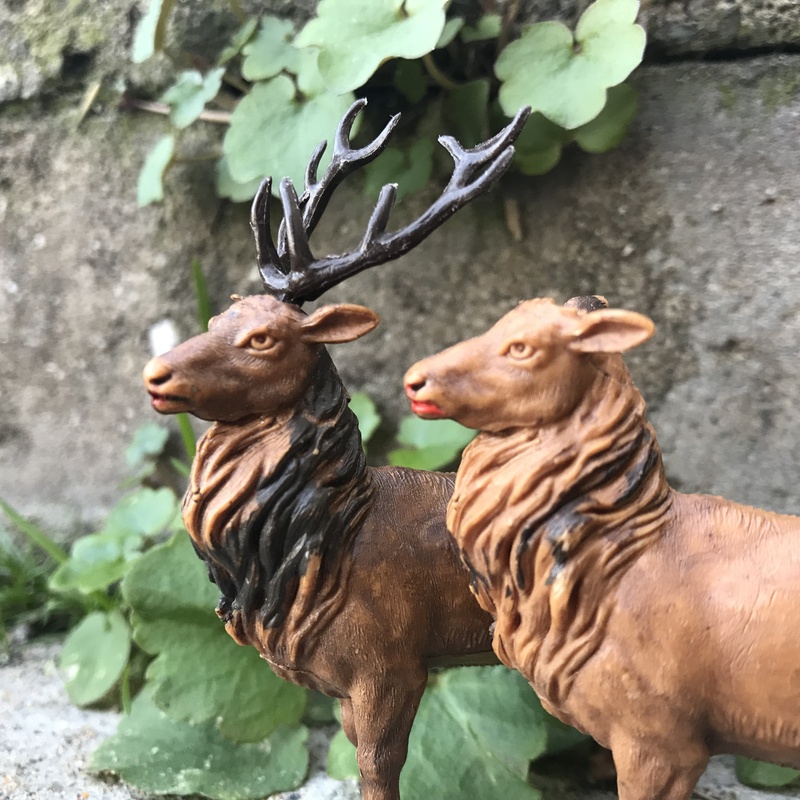 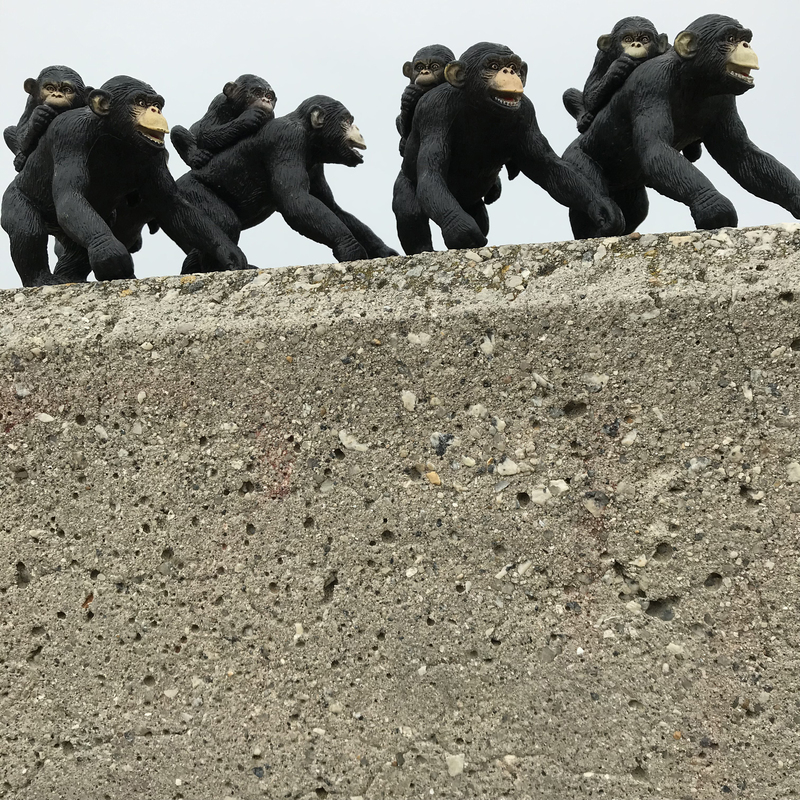 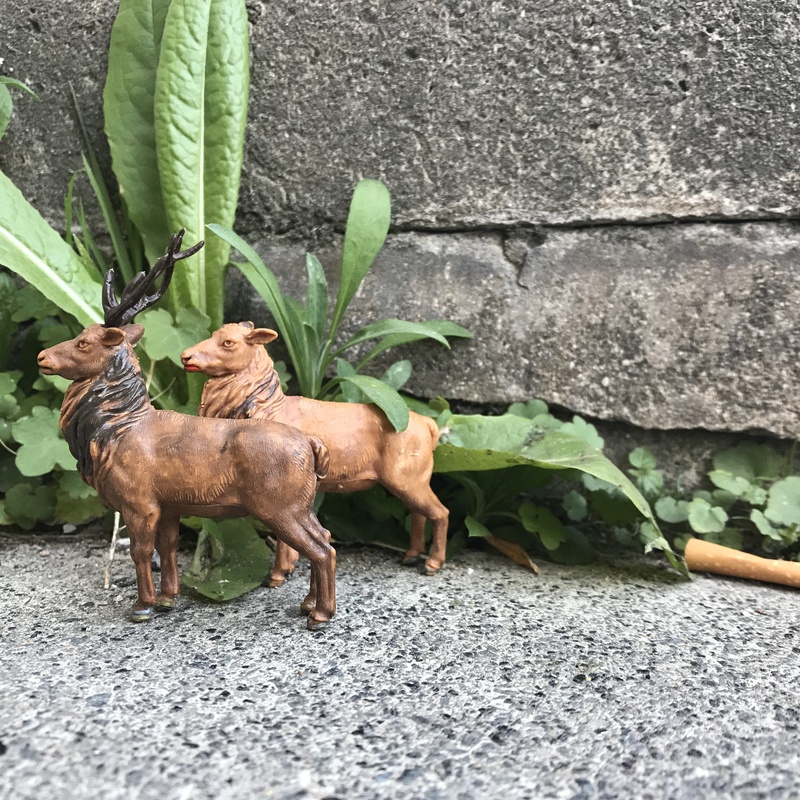 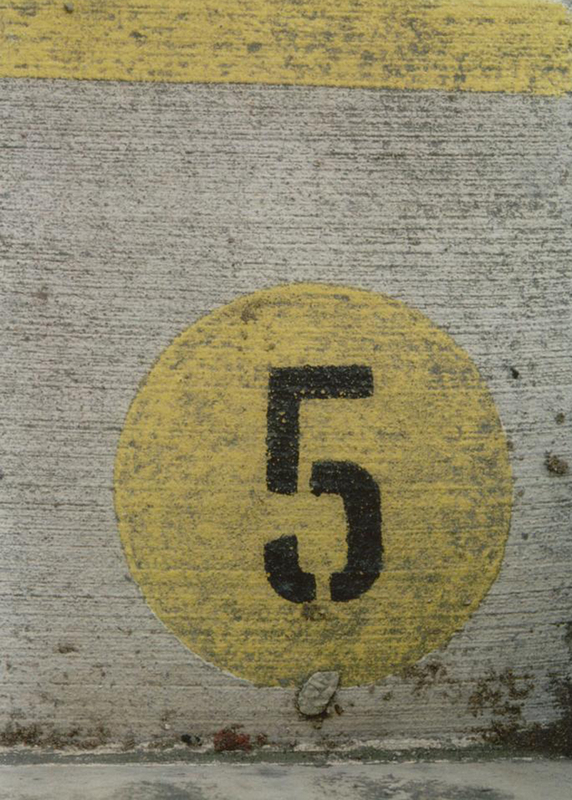 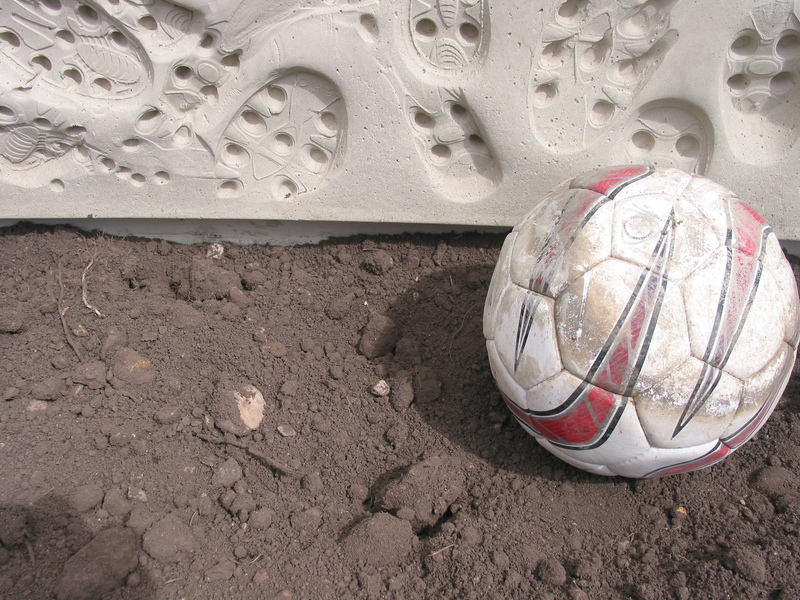 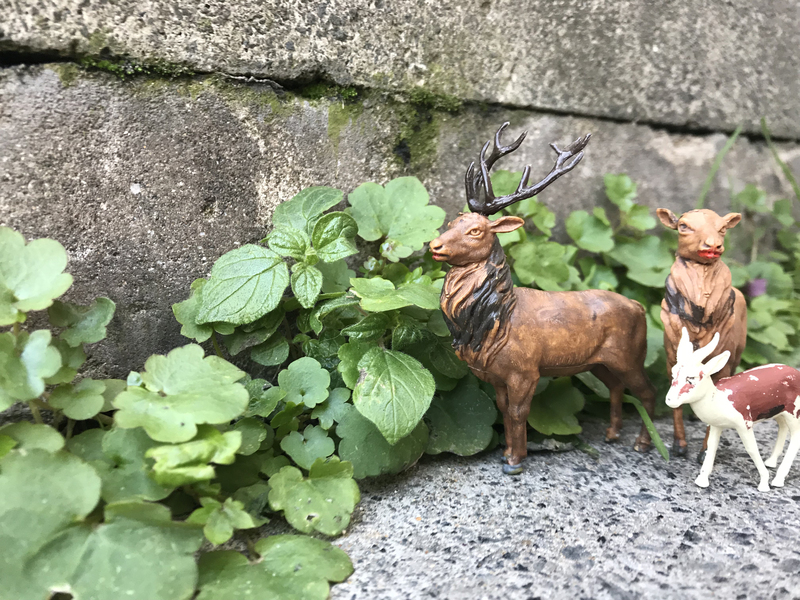 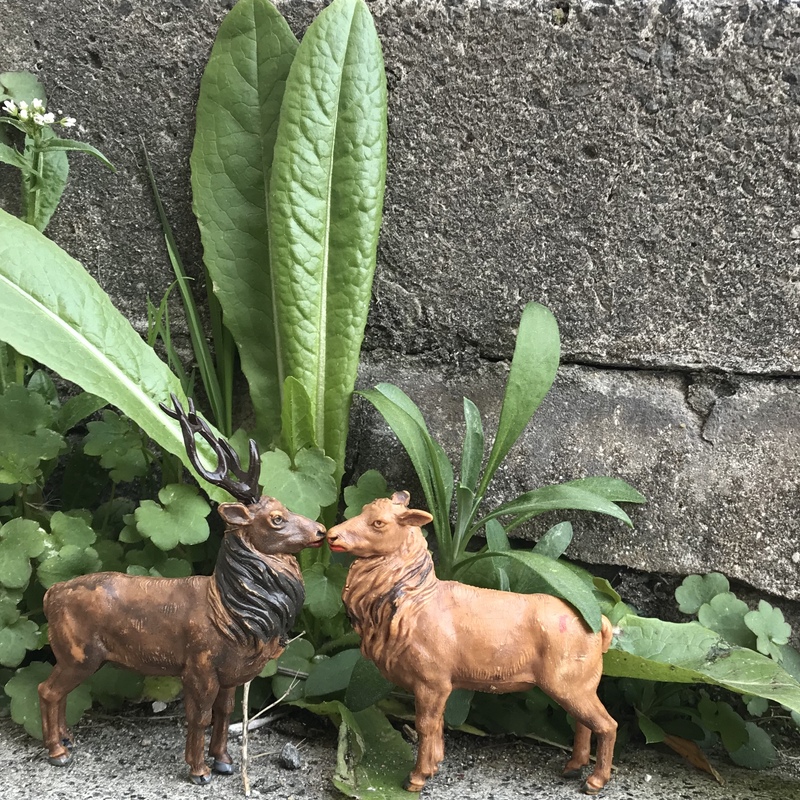 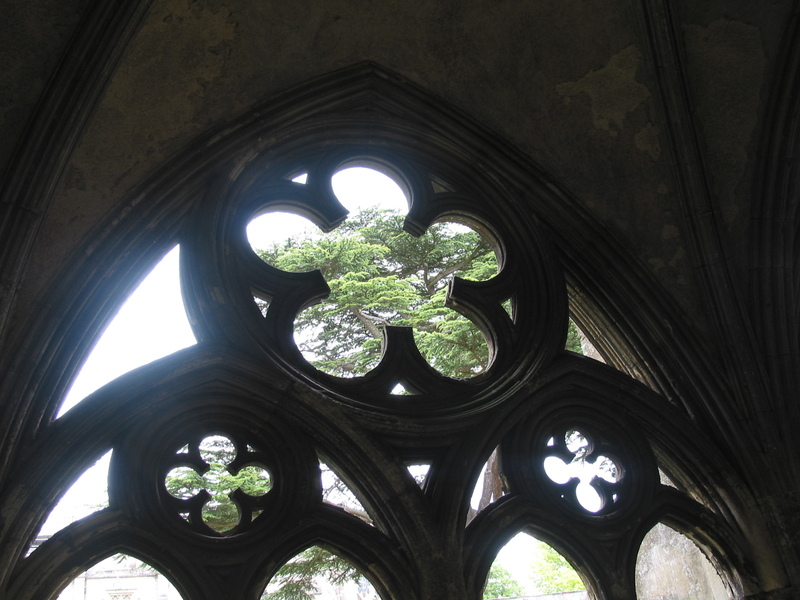 Interesting to see things again – unplanned and in the moment and experience them anew. 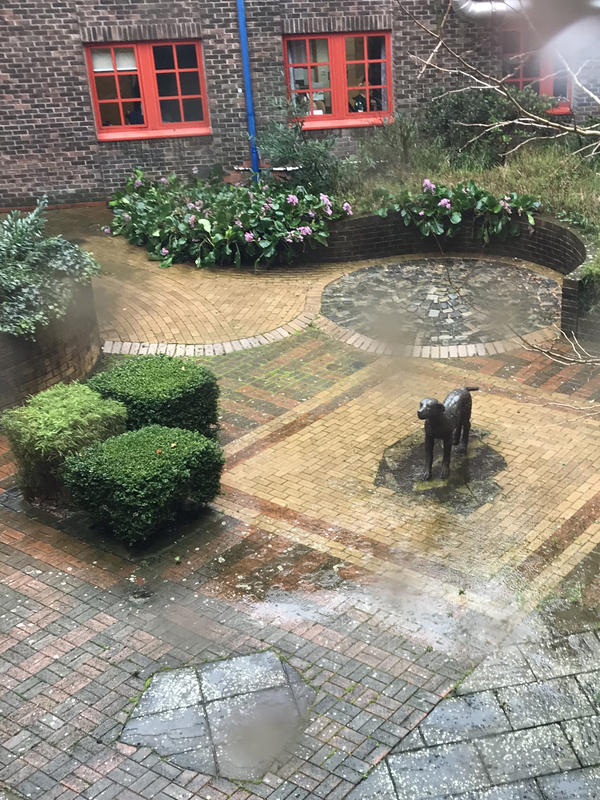 The Dog Courtyard at Dorset County Hospital seen through rain spattered windows on a bad weather day. 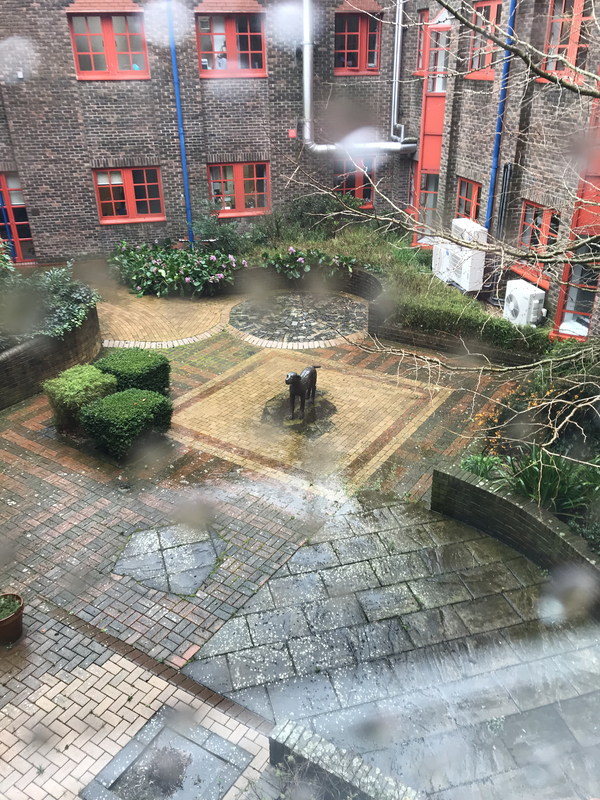 I couldn’t access the courtyard directly yesterday due to the weather. 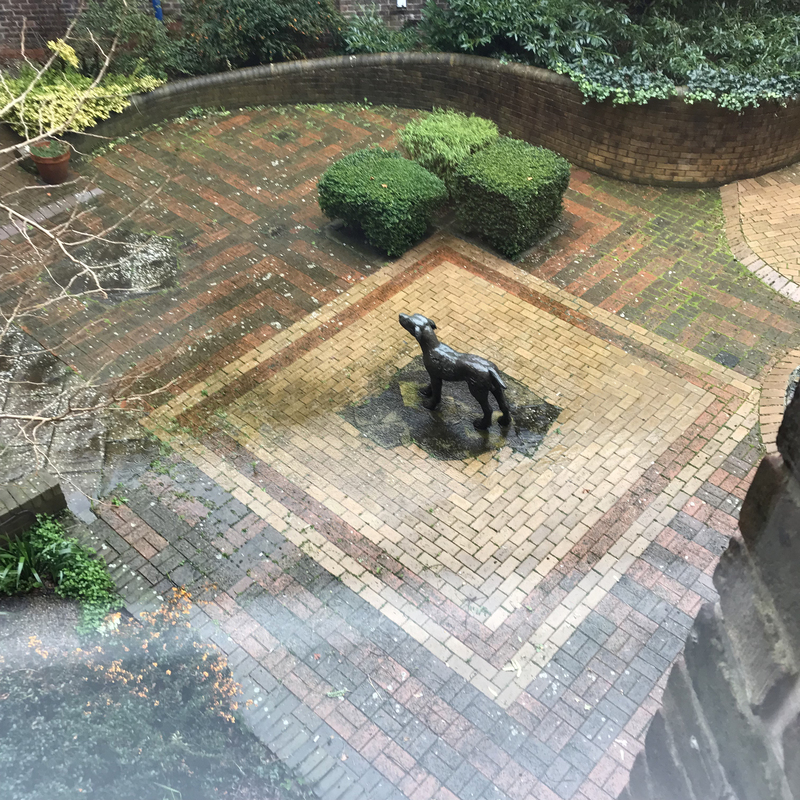 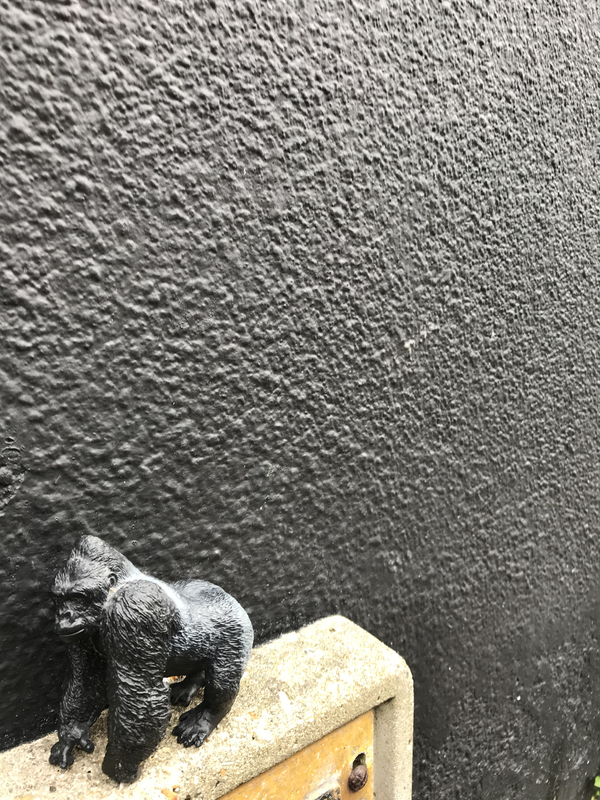 The bronze dog is by Dame Elisabeth Frink, who I was extremely privileged to meet at her home in Blandford Forum in 1992, when I was taken there by my commissioner Val Pitt-Rivers, the founder of Arts in Hospital and a great friend of Elisabeth’s. 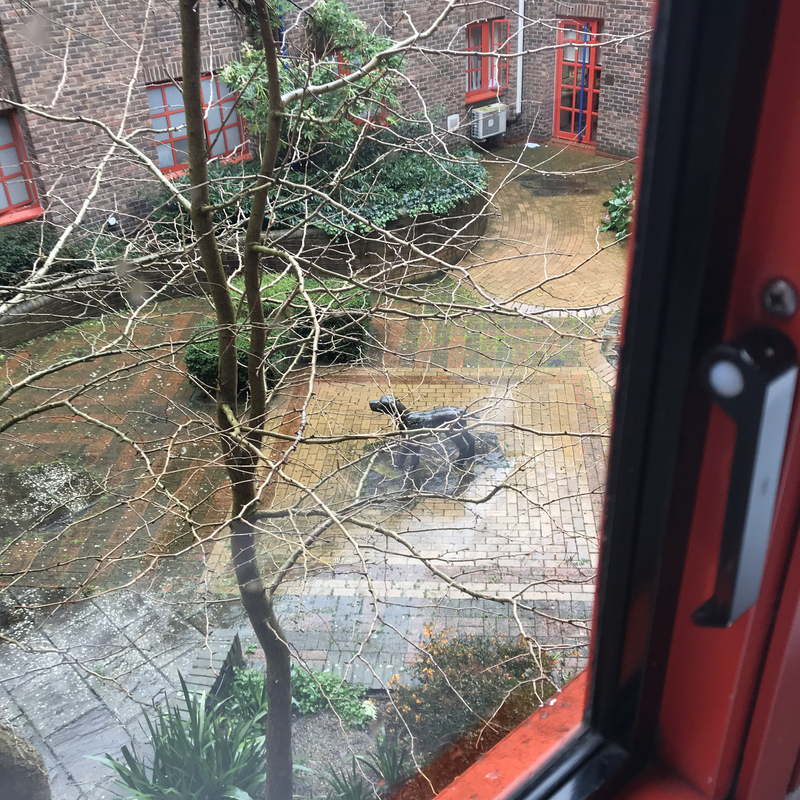 Elisabeth Frink died in 1993. 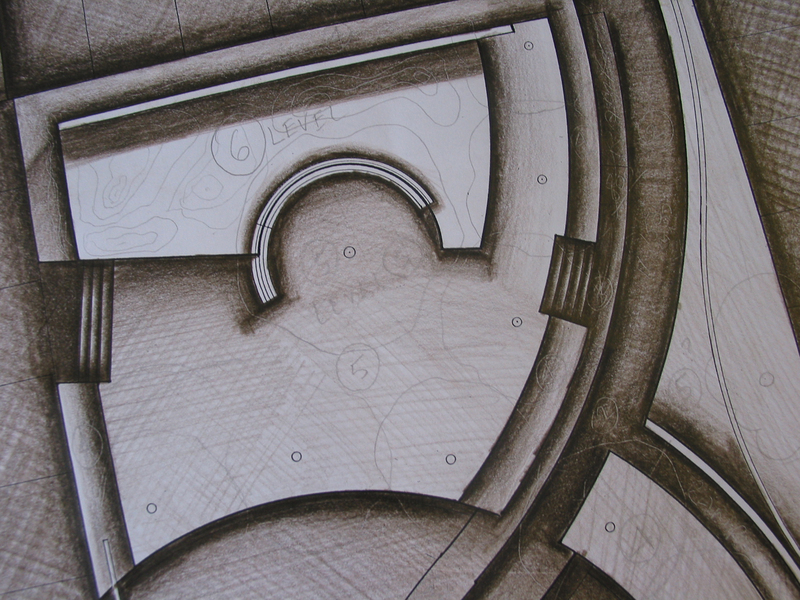 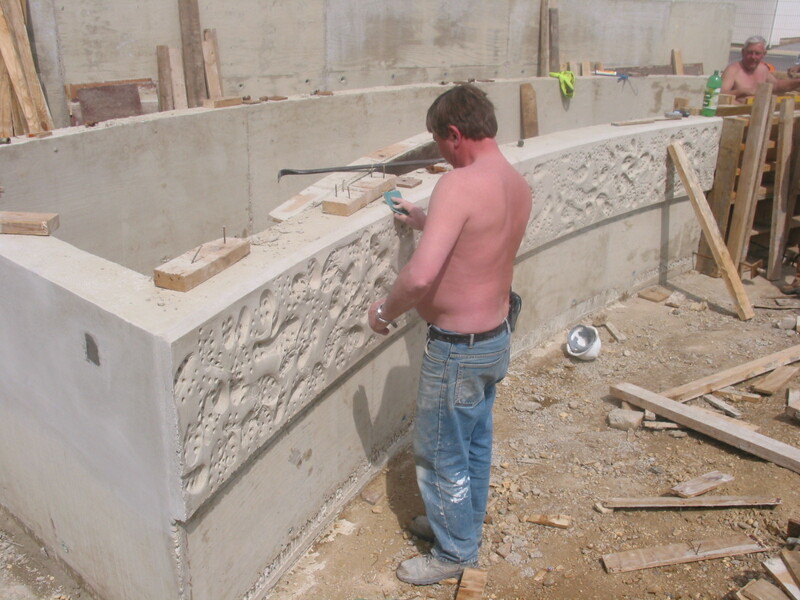 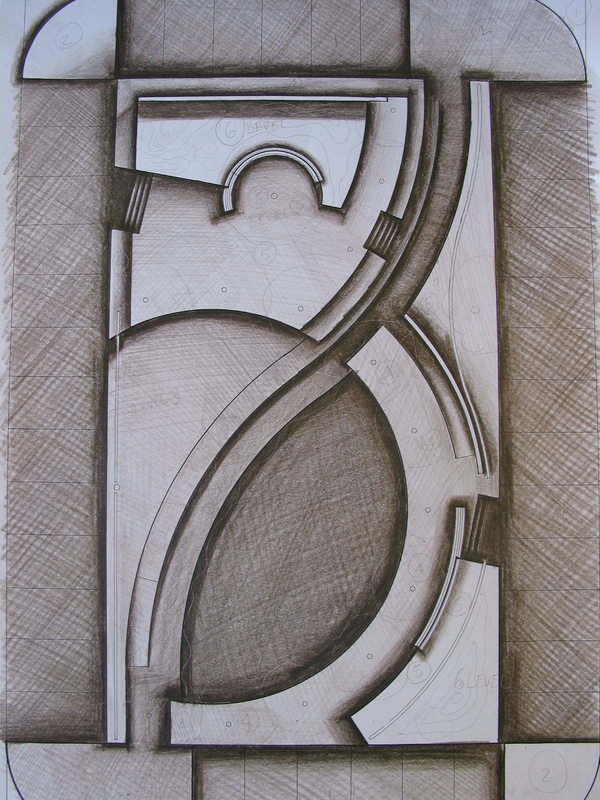 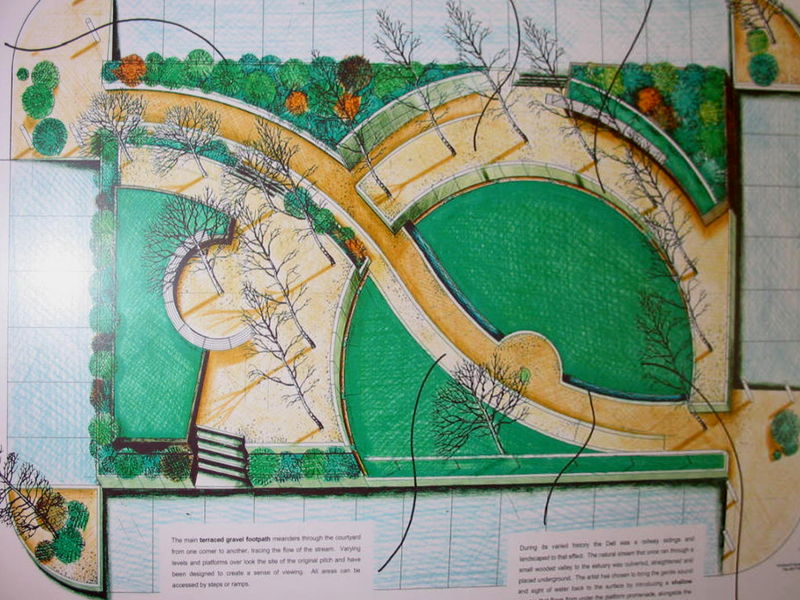 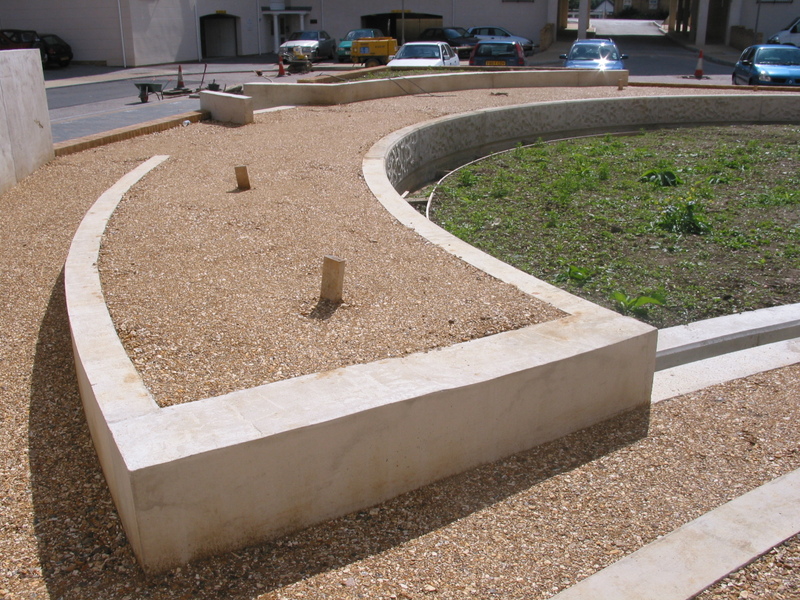 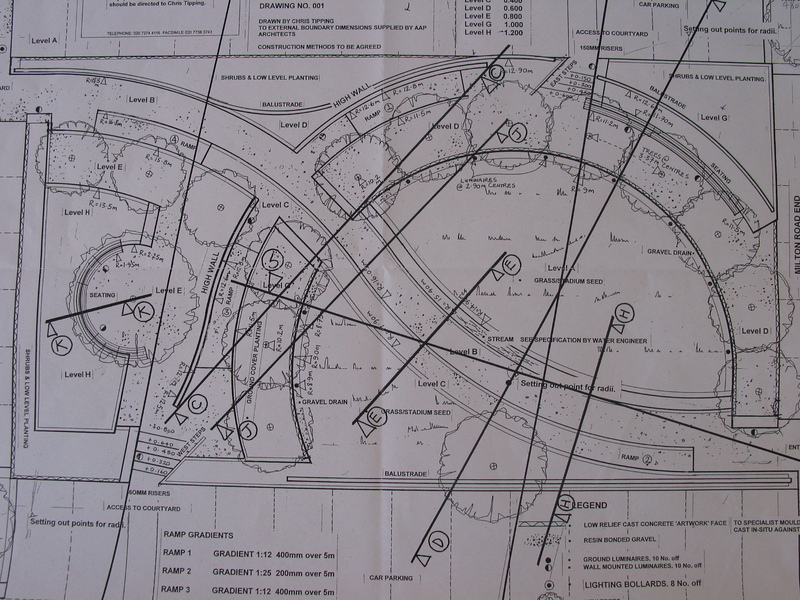 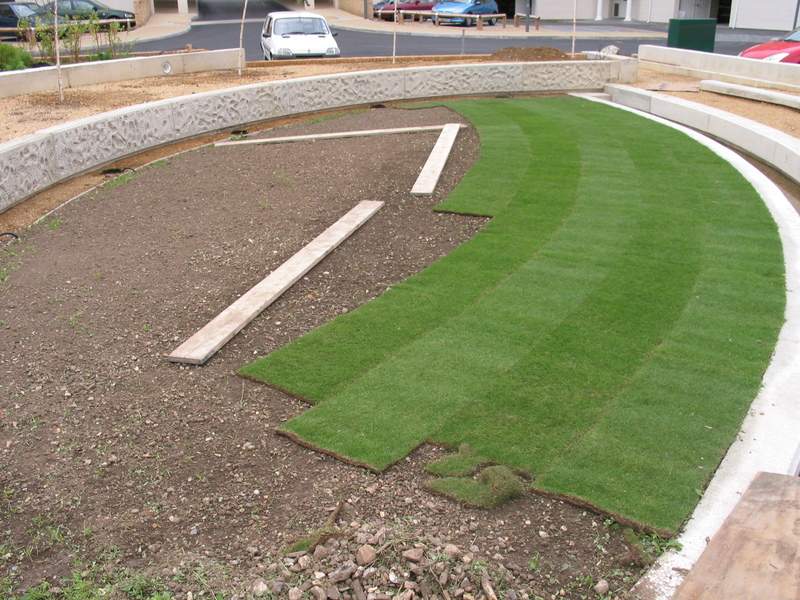 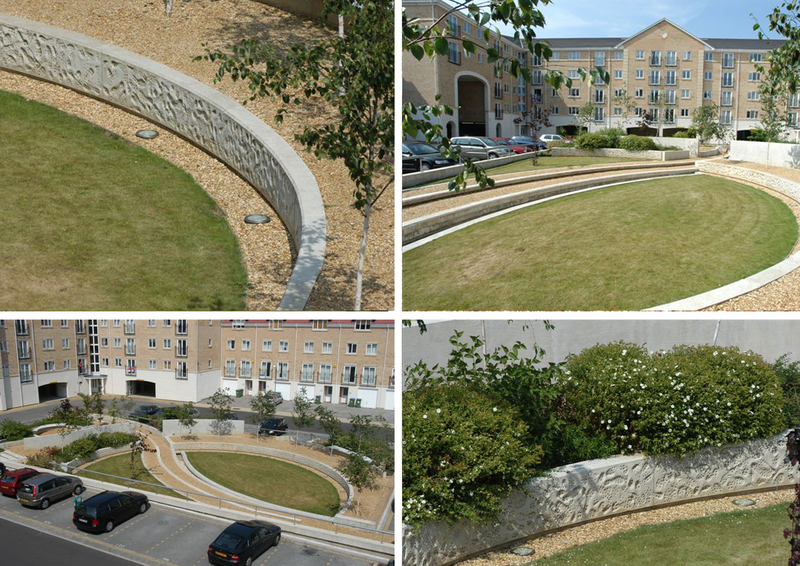 The courtyard was designed and created around this beautiful sculpture and was loosely based upon a roman villa garden. 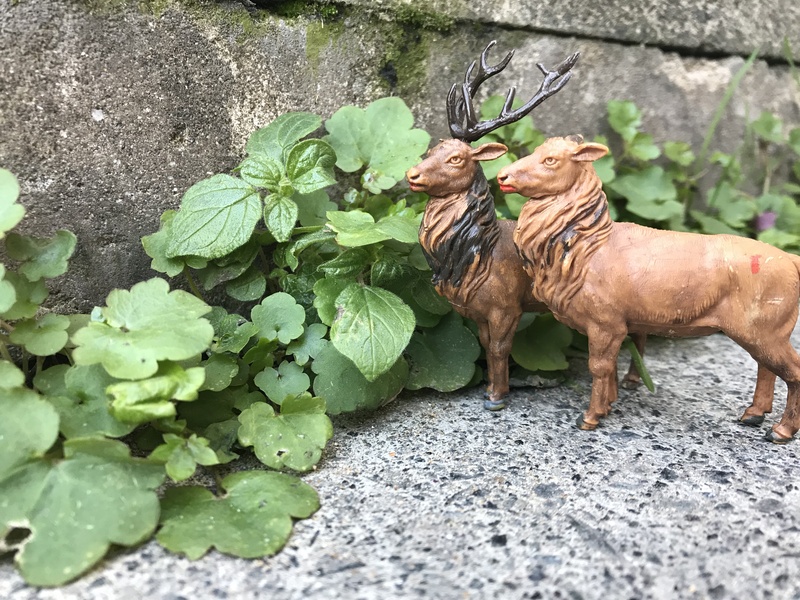 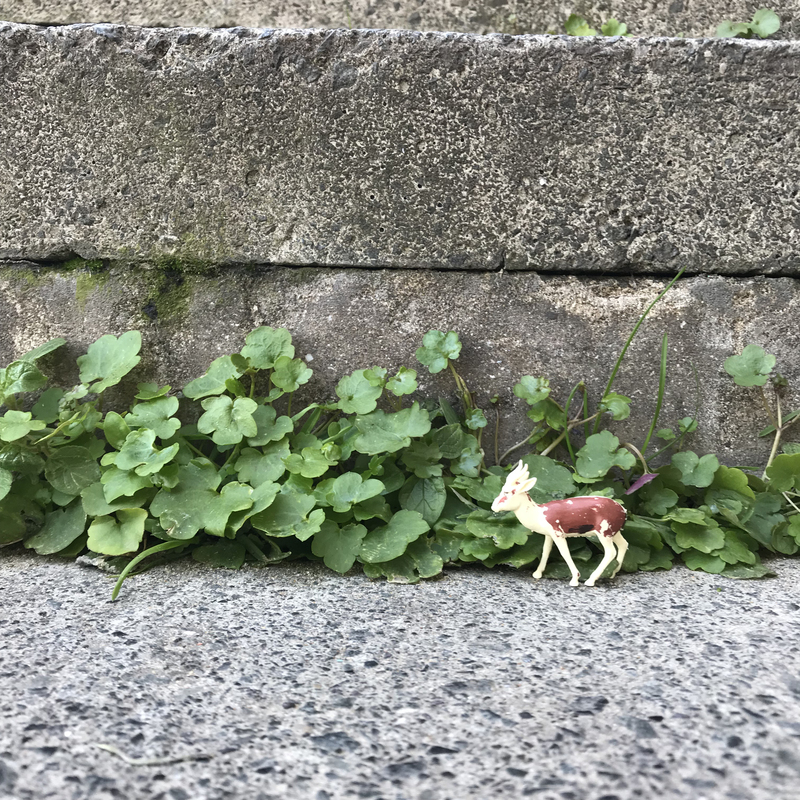 I love to see the lichens growing everywhere…a sign of age…as well as the Box and Bamboo topiary, maintained as cubes as per the original design. 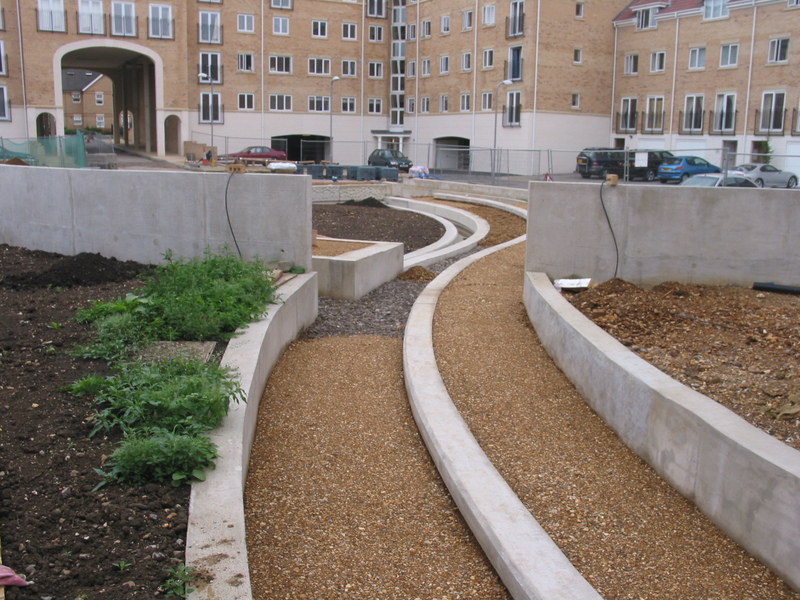 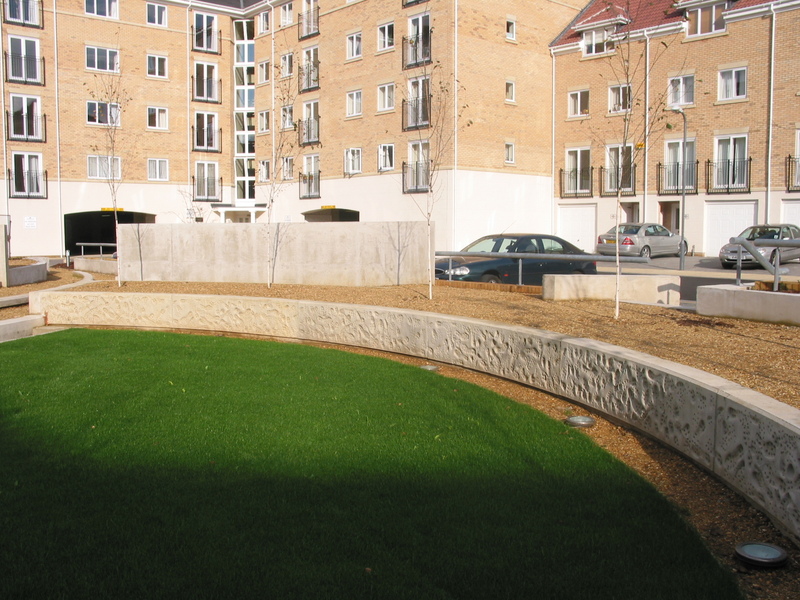 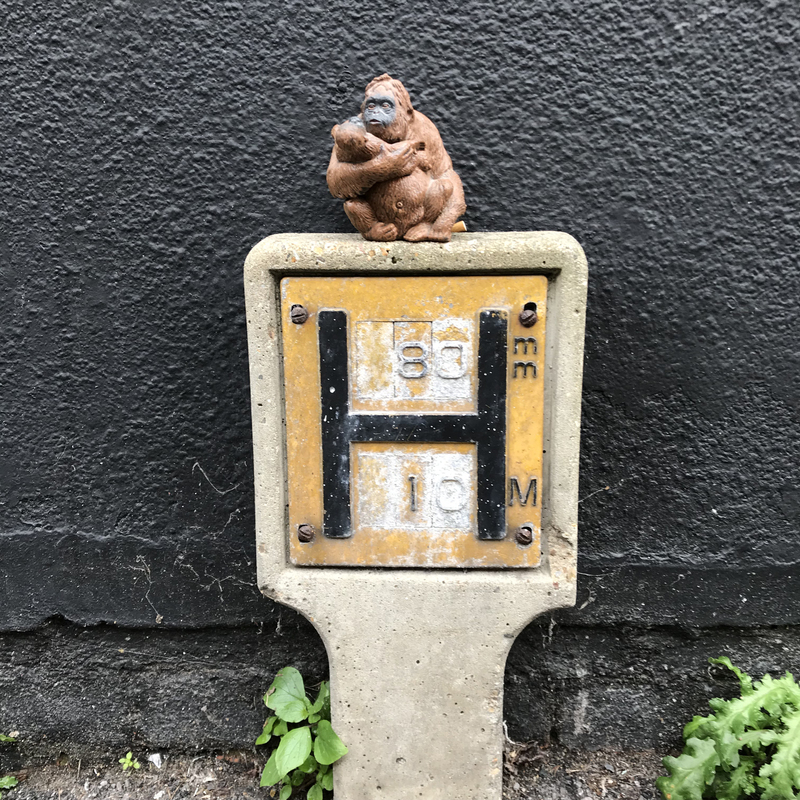 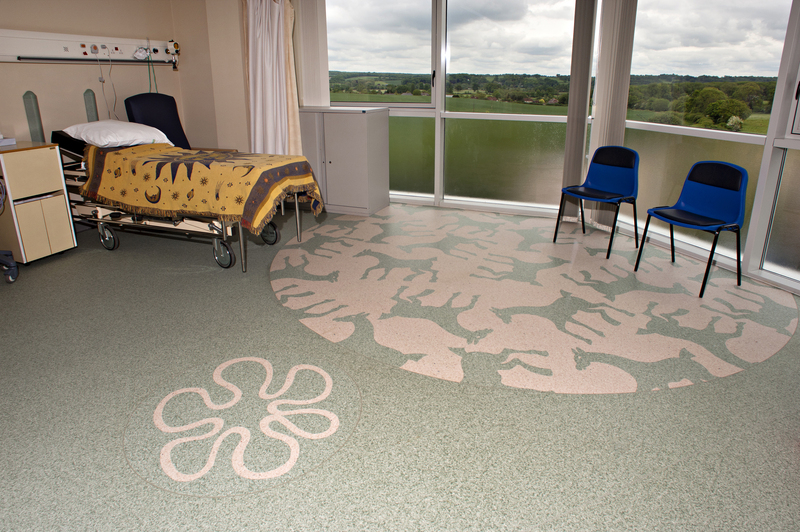 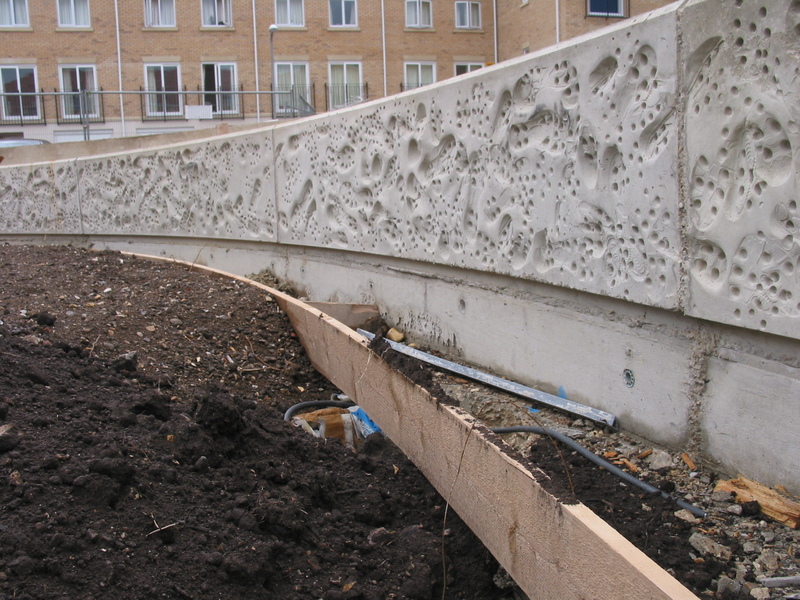 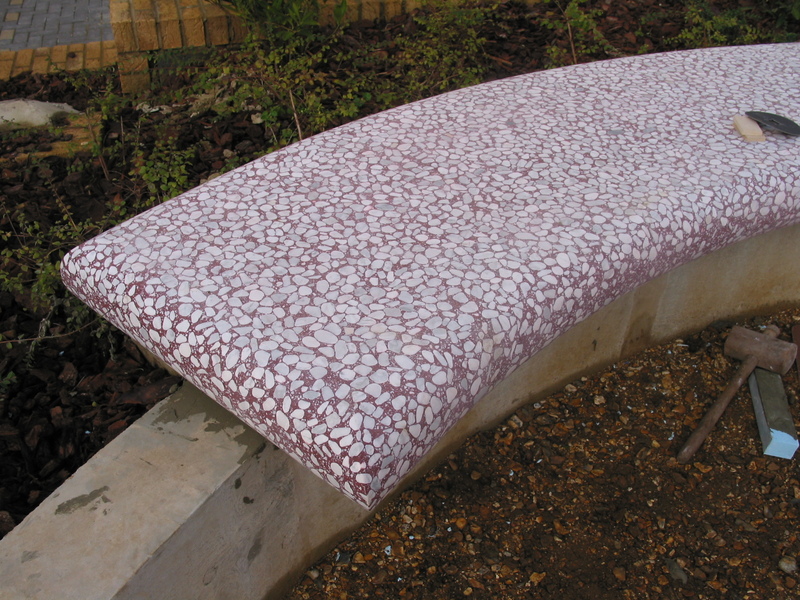 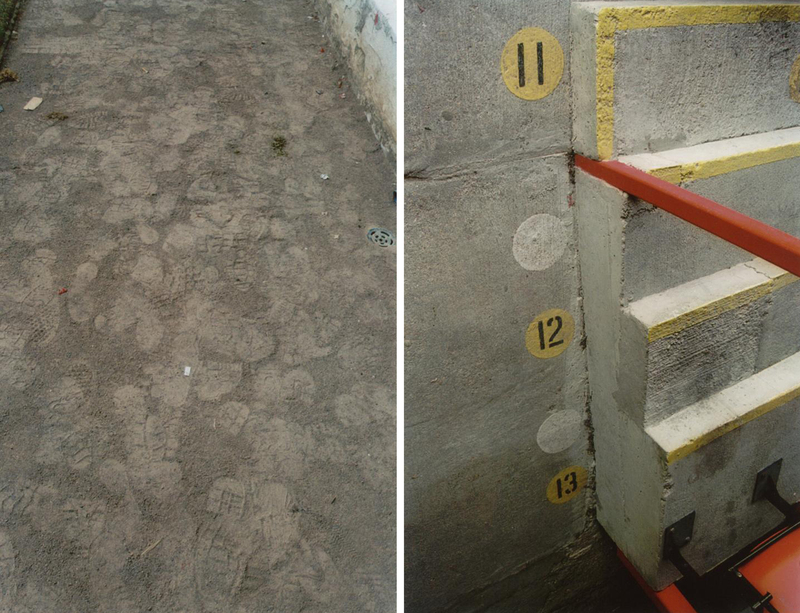 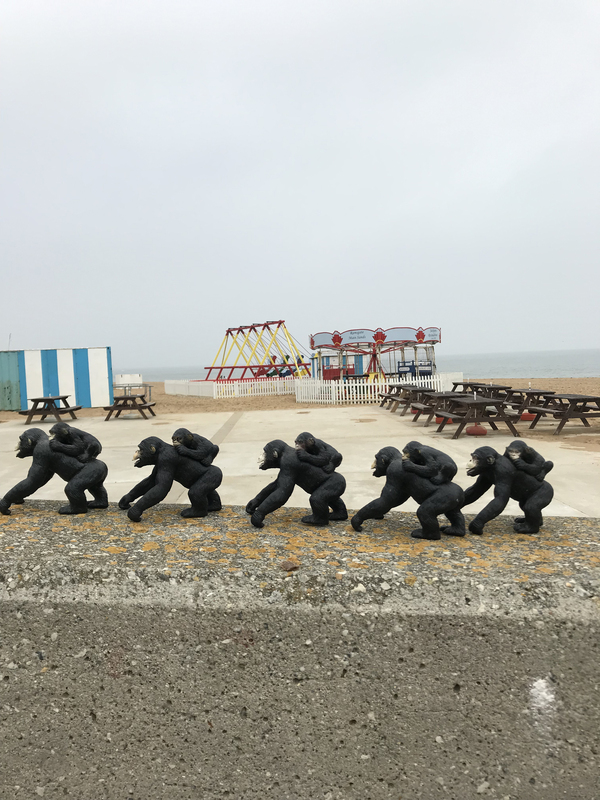 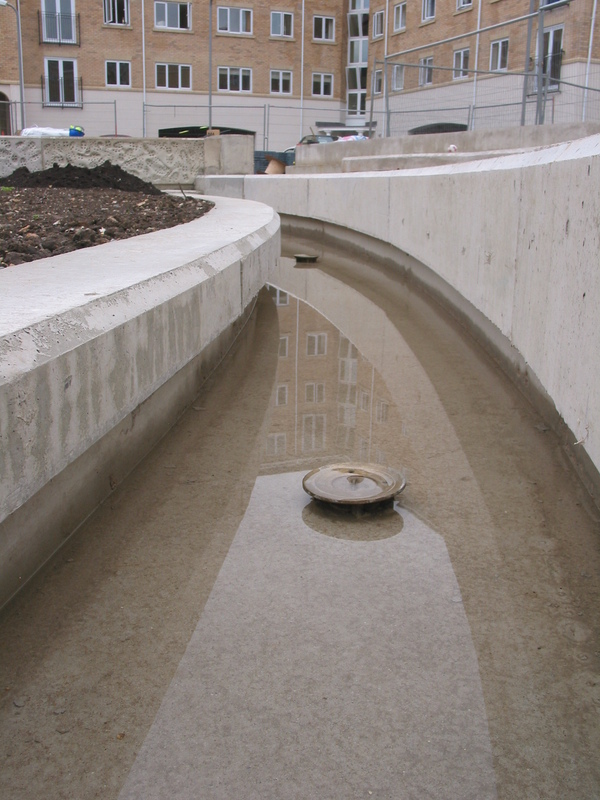 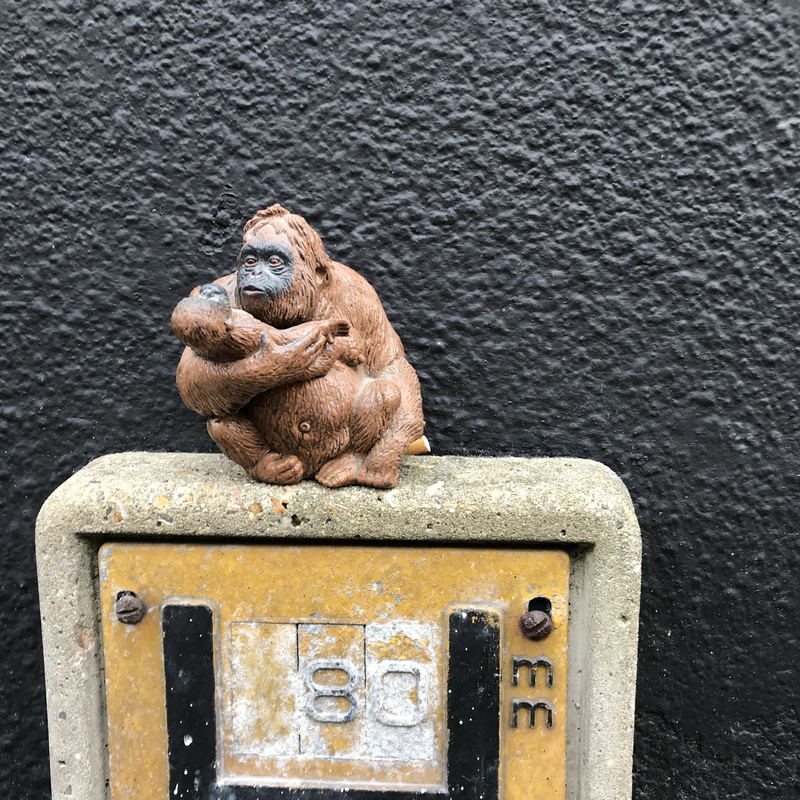 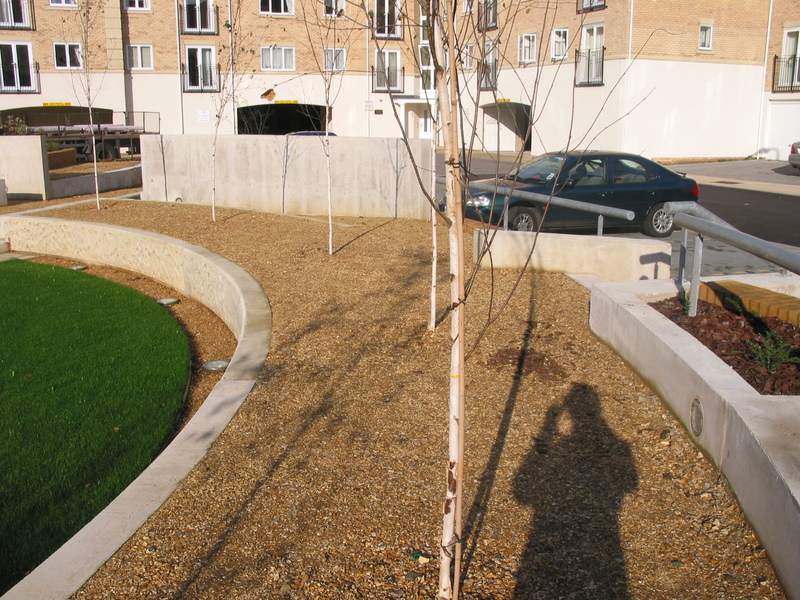 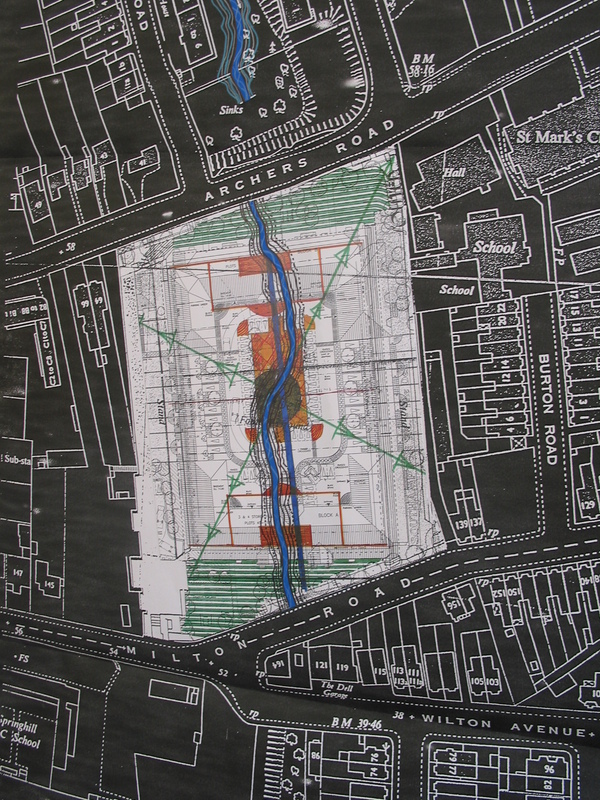 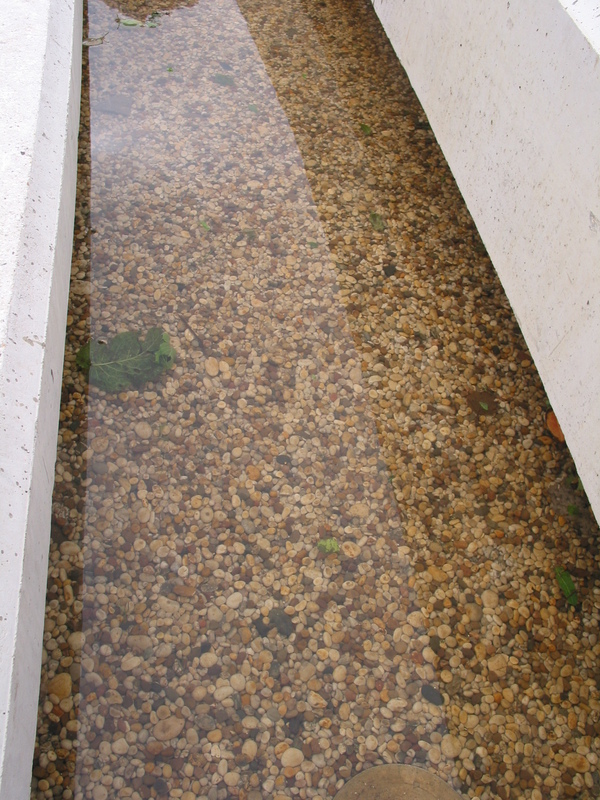 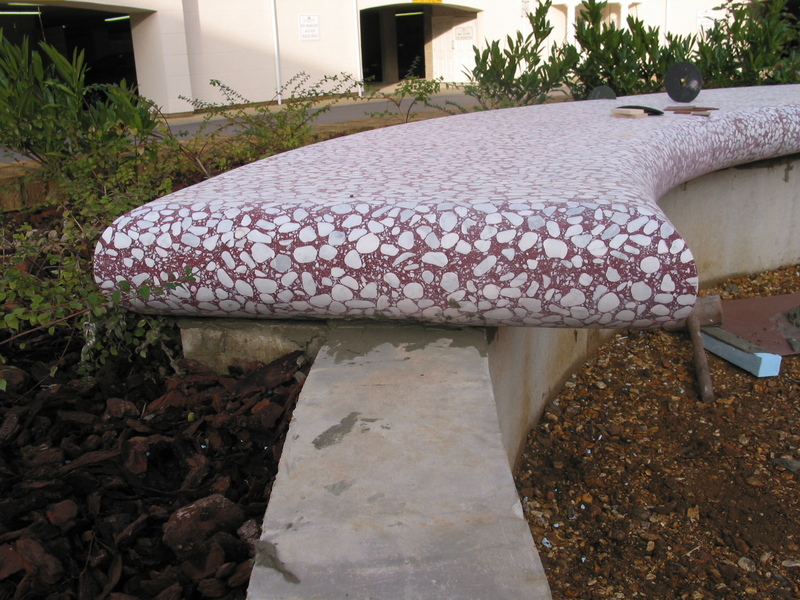 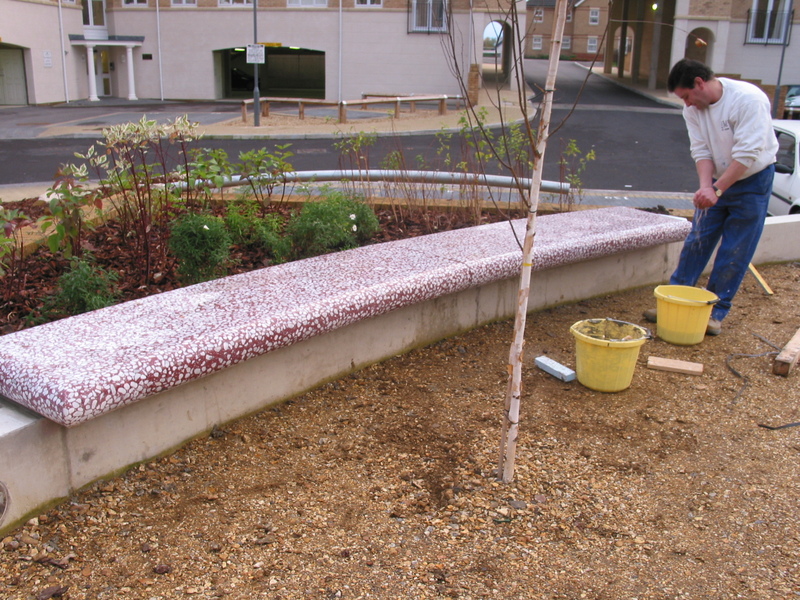 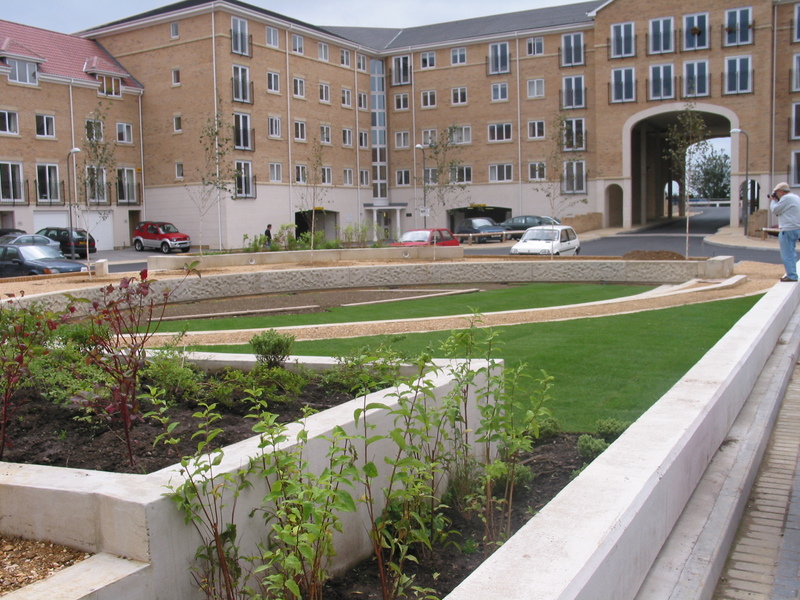 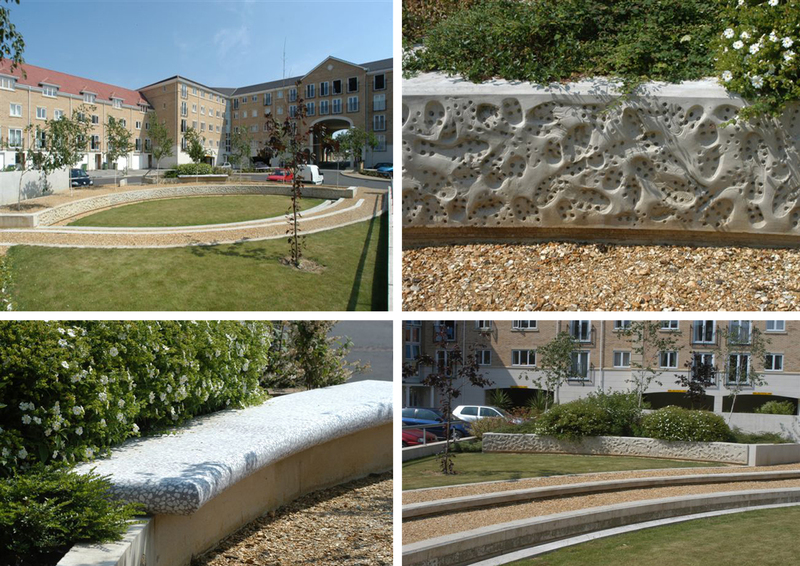 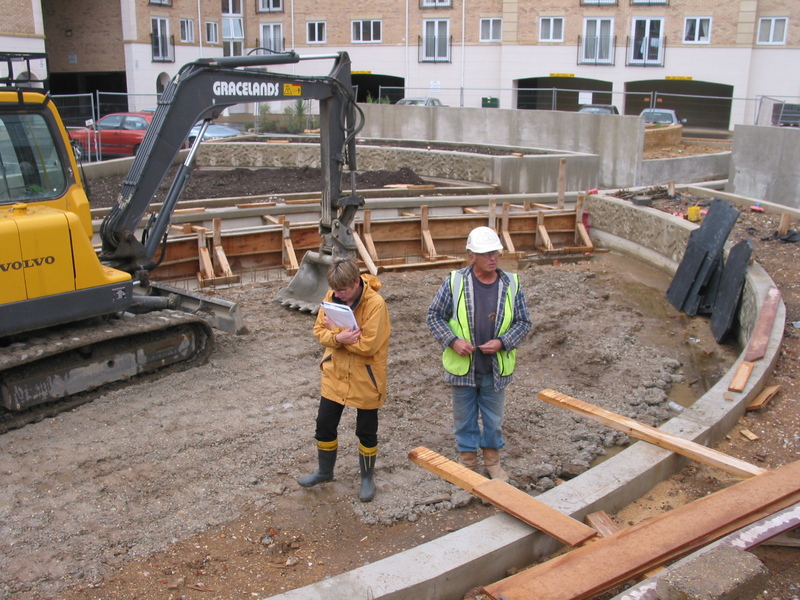 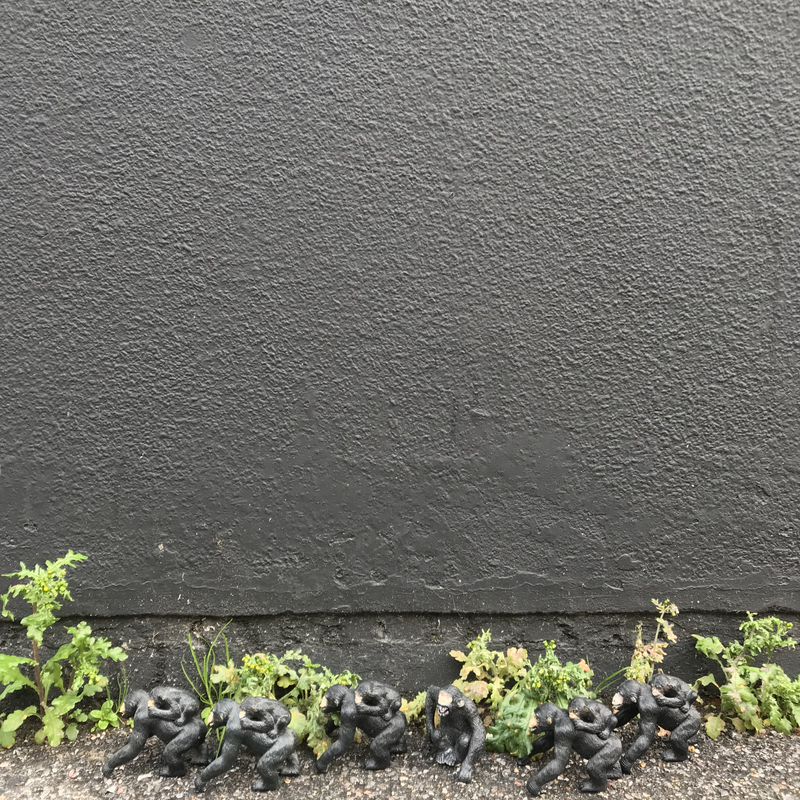 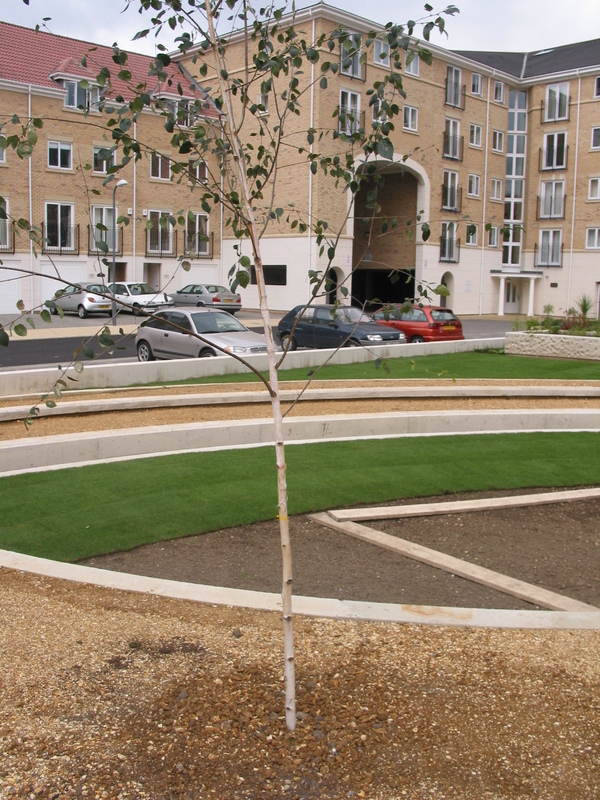 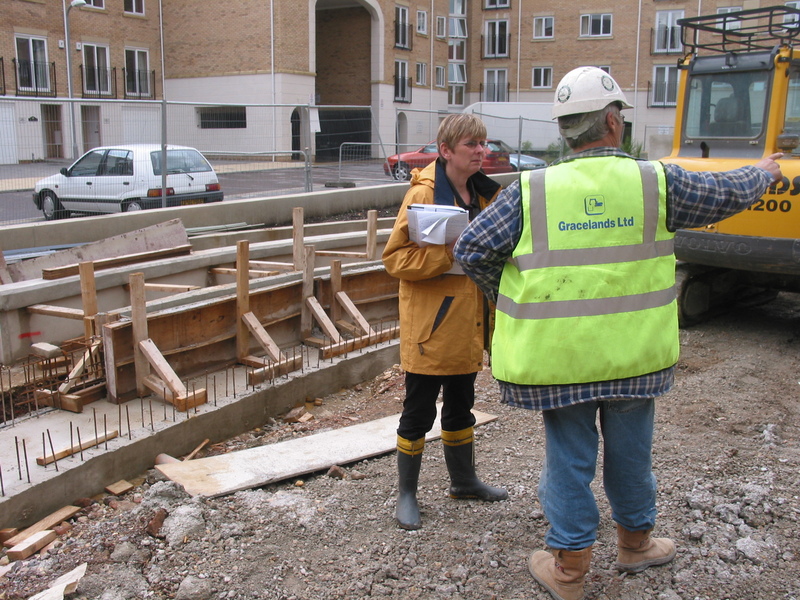 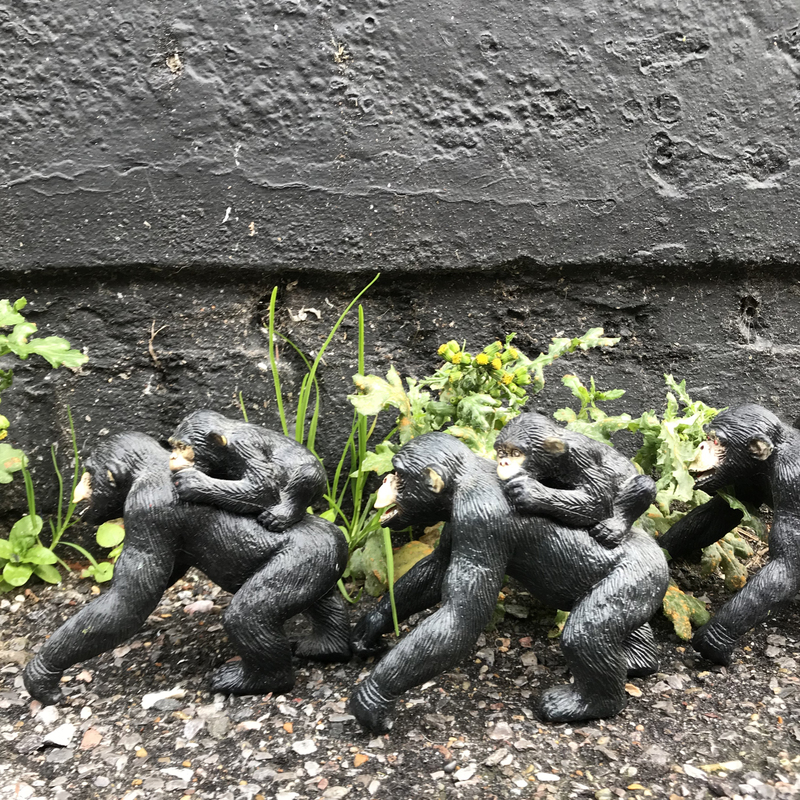 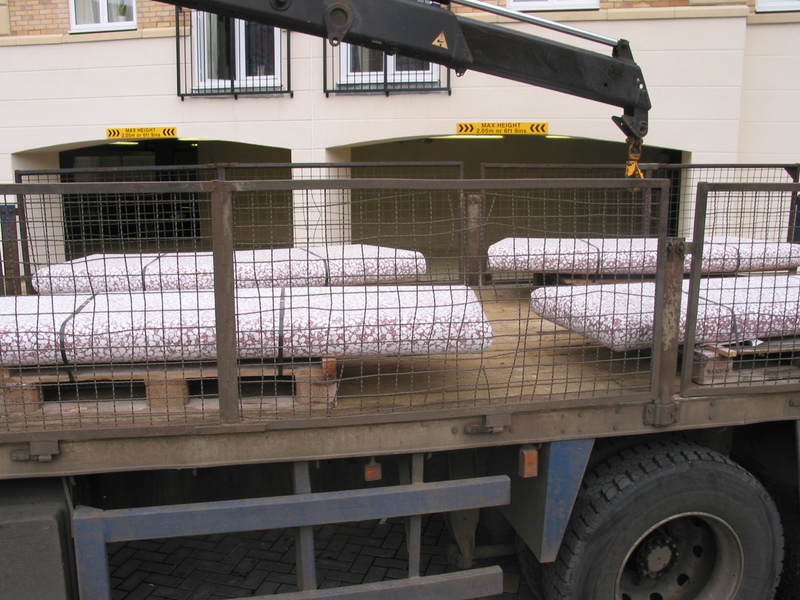 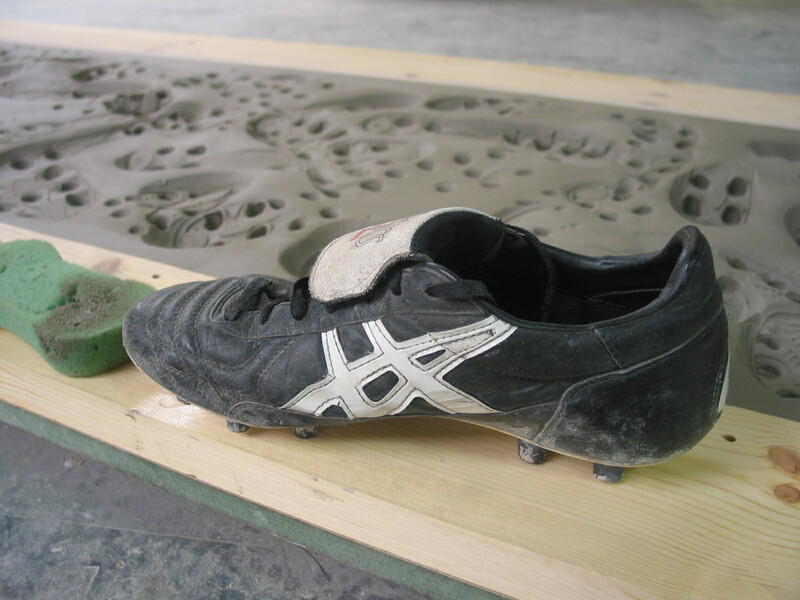 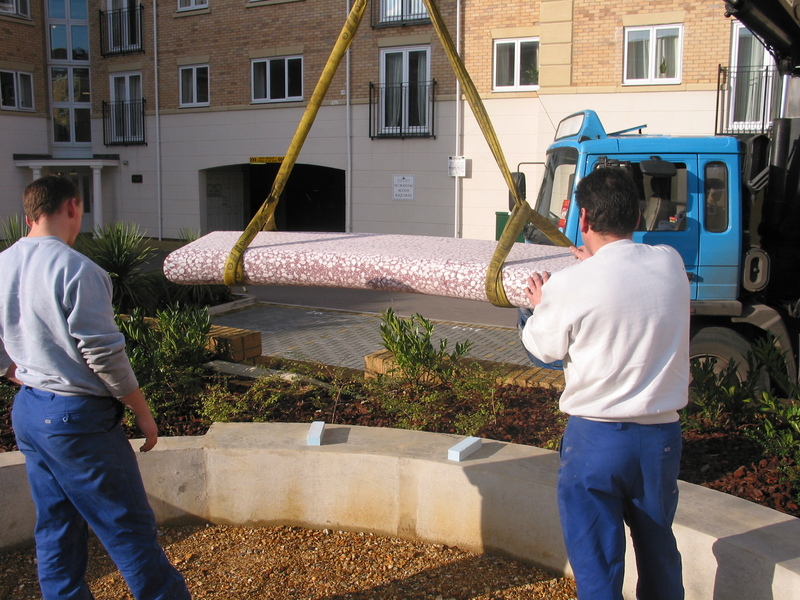 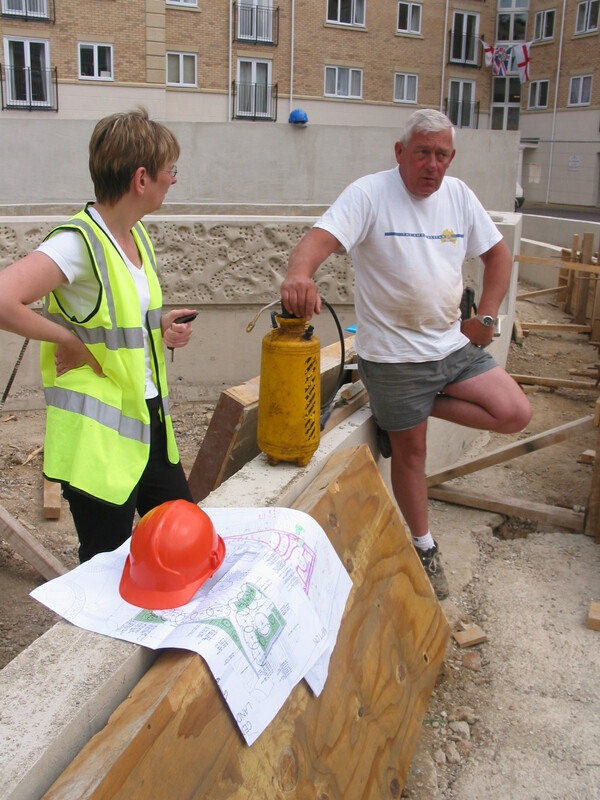 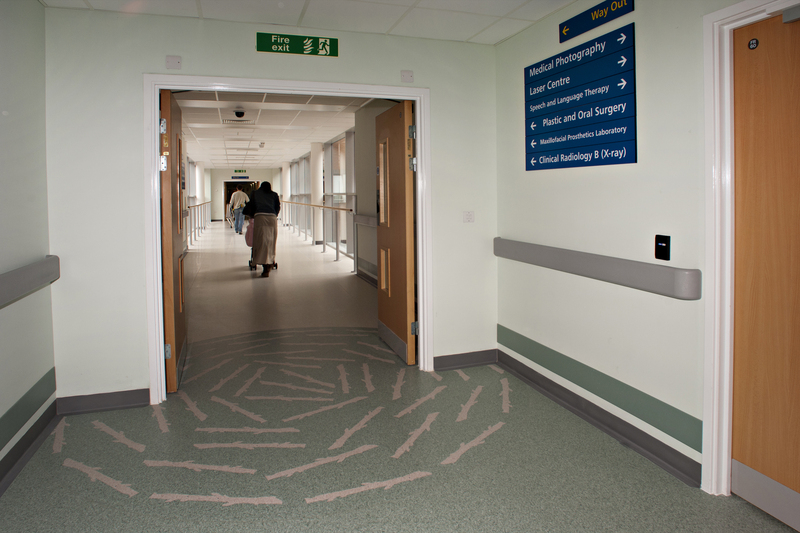 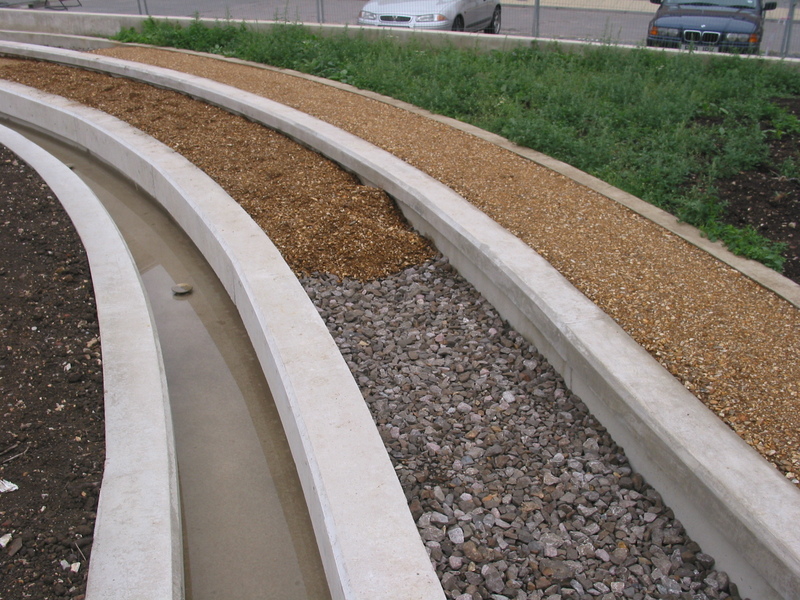 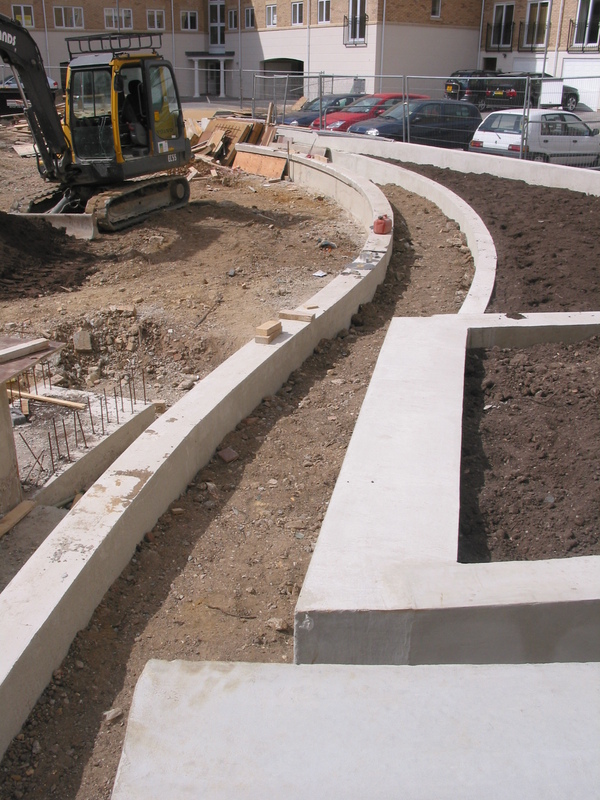 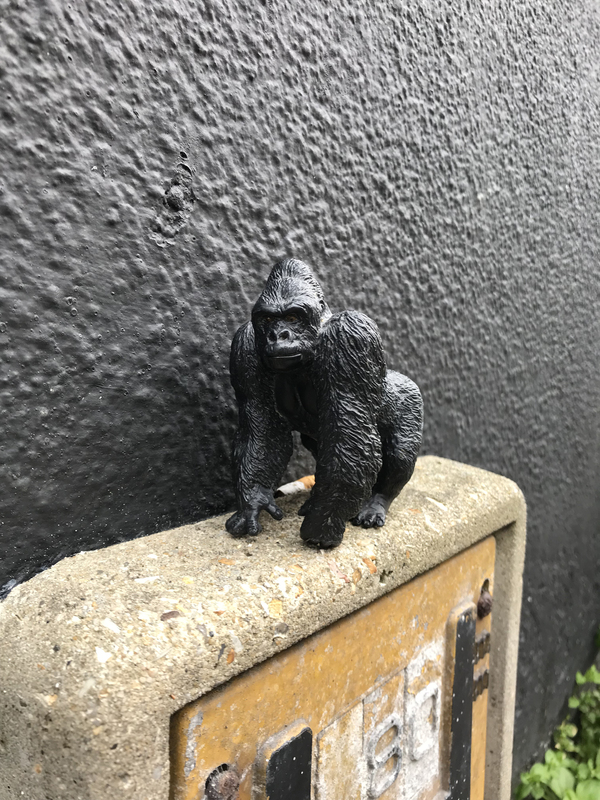 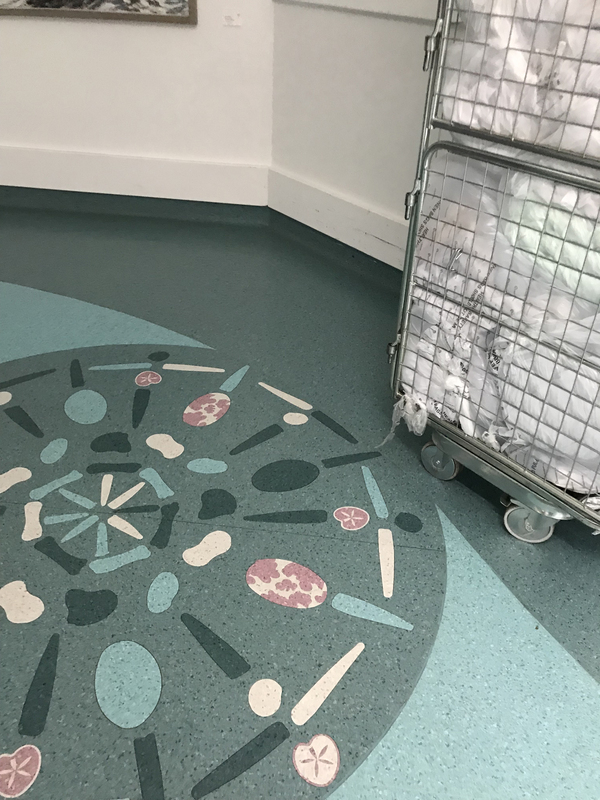 The Hospital Streets project was completed in 2009 & was commissioned by the then director of Arts in Hospital, Alexandra Coulter. 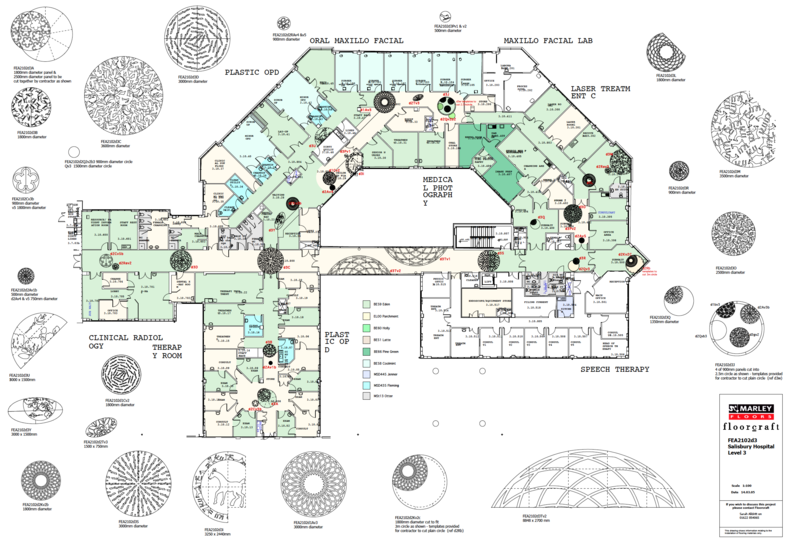 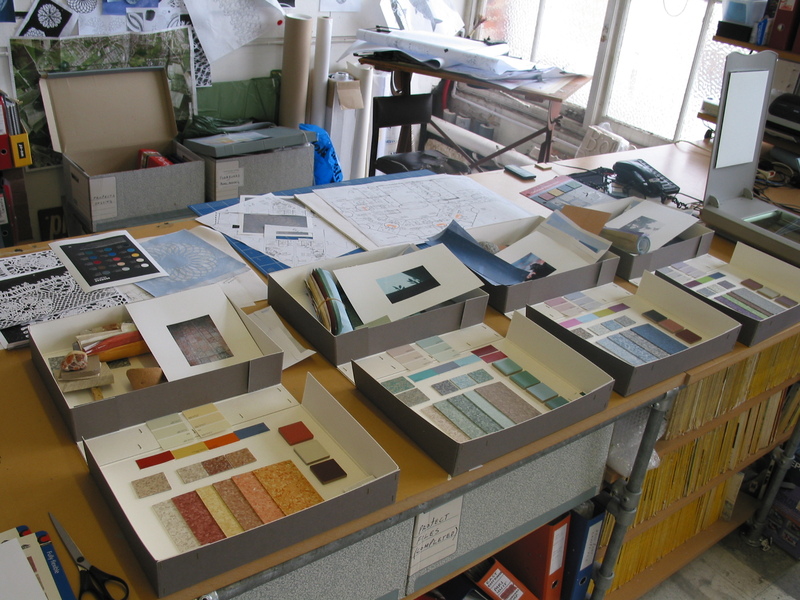 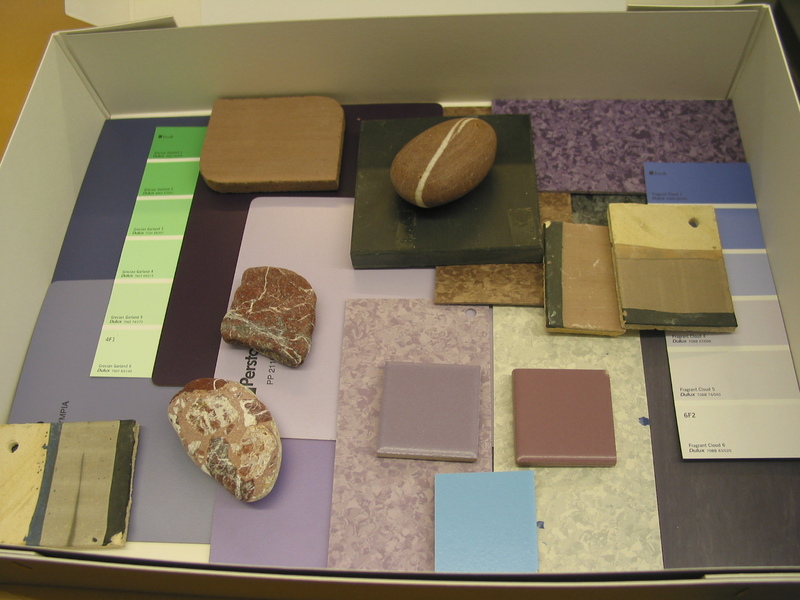 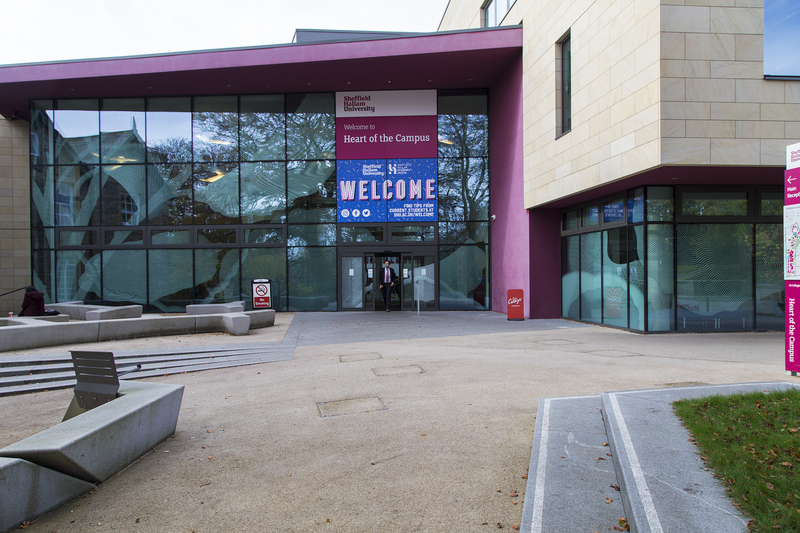 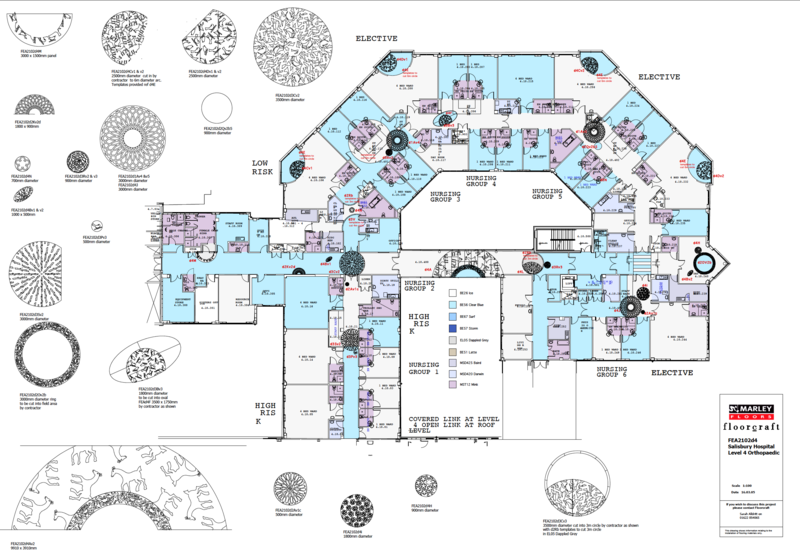 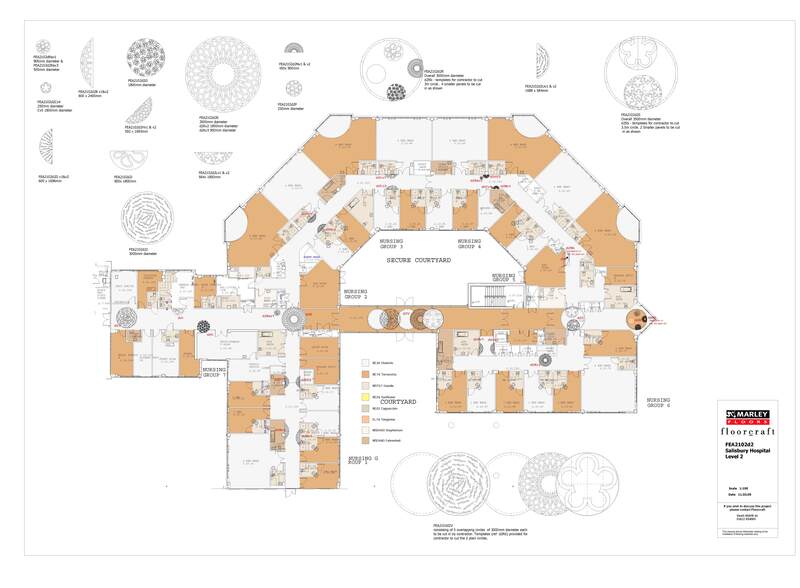 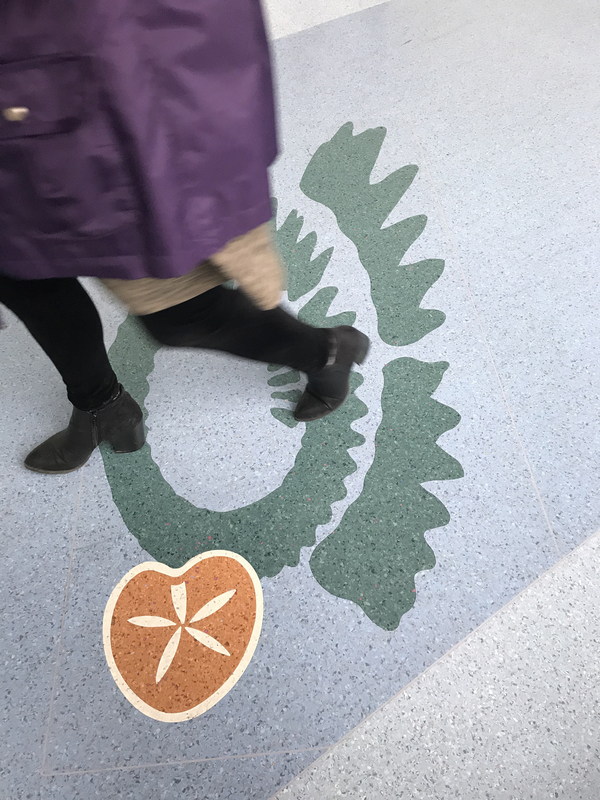 The project was focussed on colour and wayfinding over three floors of the hospital, with the inspiration coming from two days spent walking & exploring along the Jurassic Coast and another day buried deep in the archives of the Dorset County Museum fossil collections. 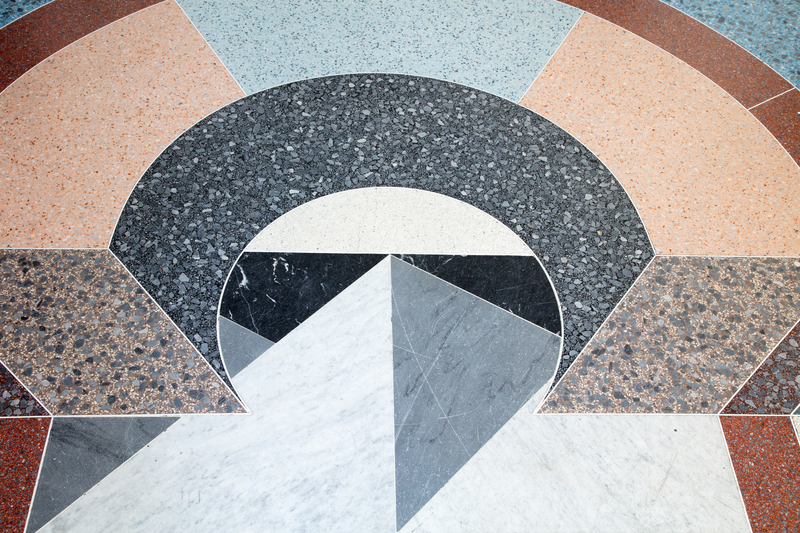 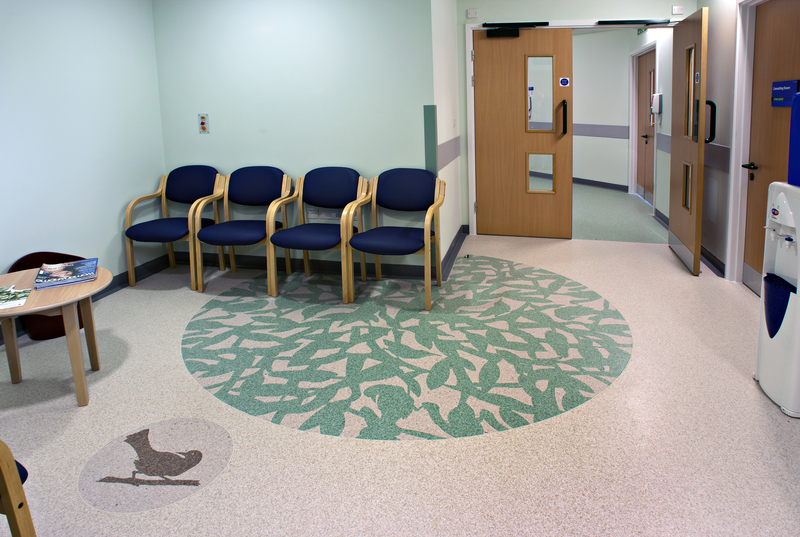 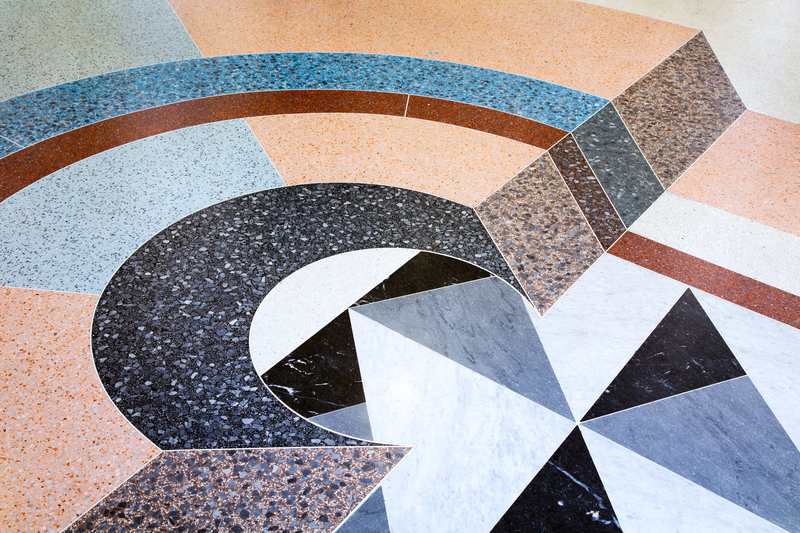 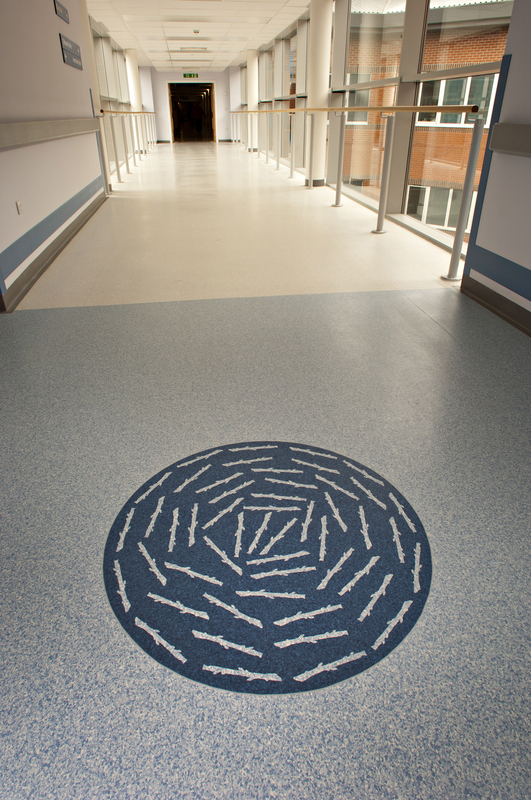 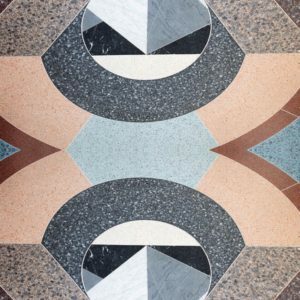 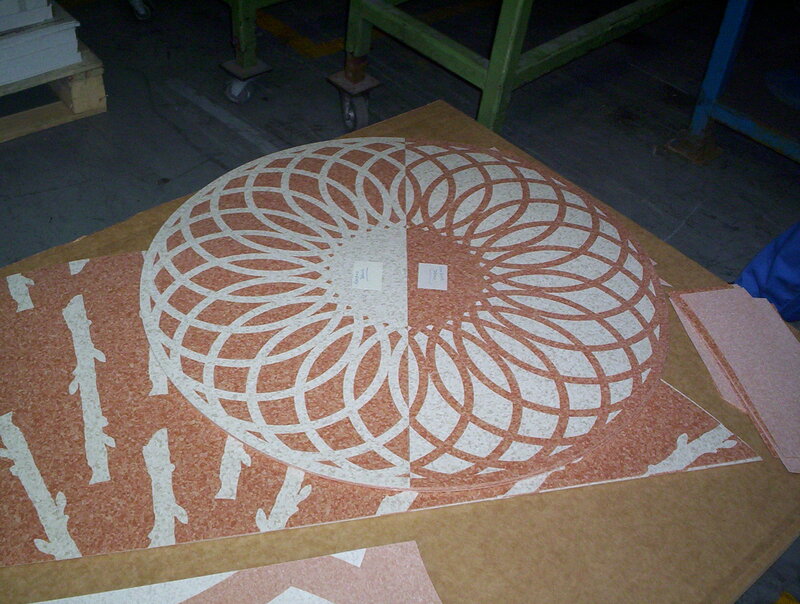 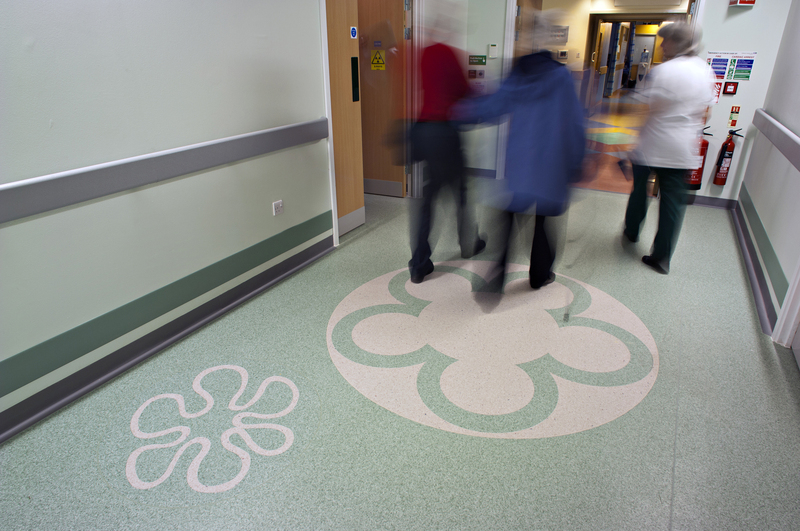 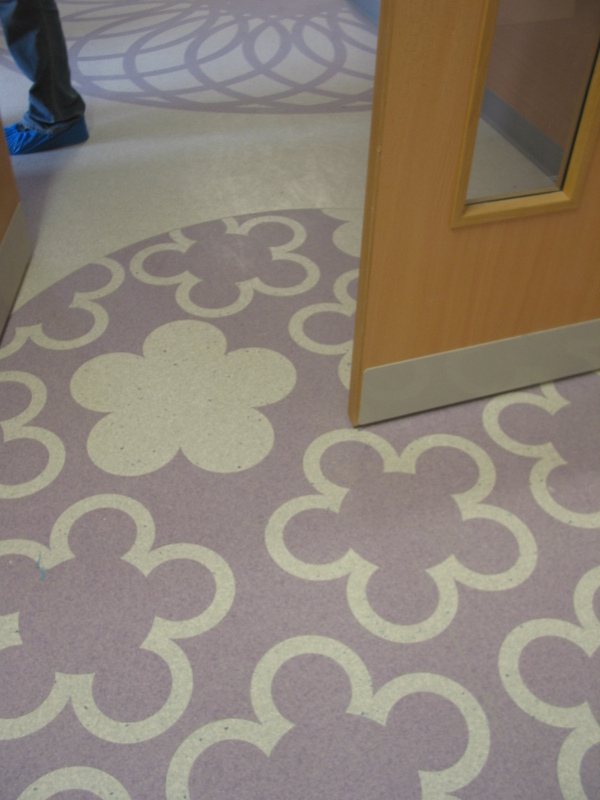 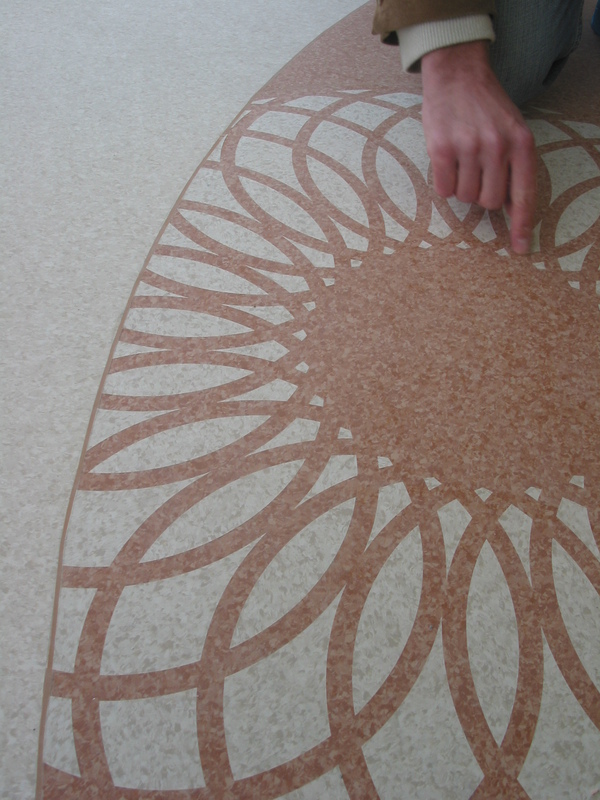 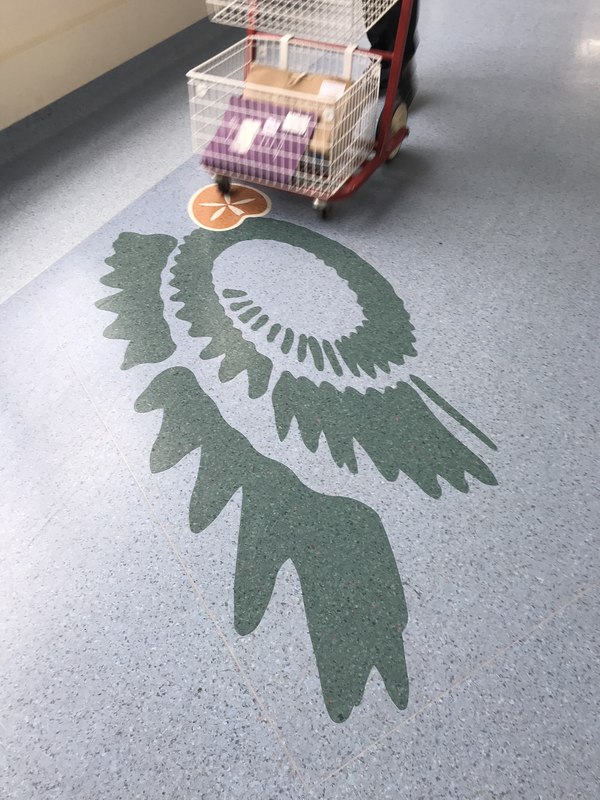 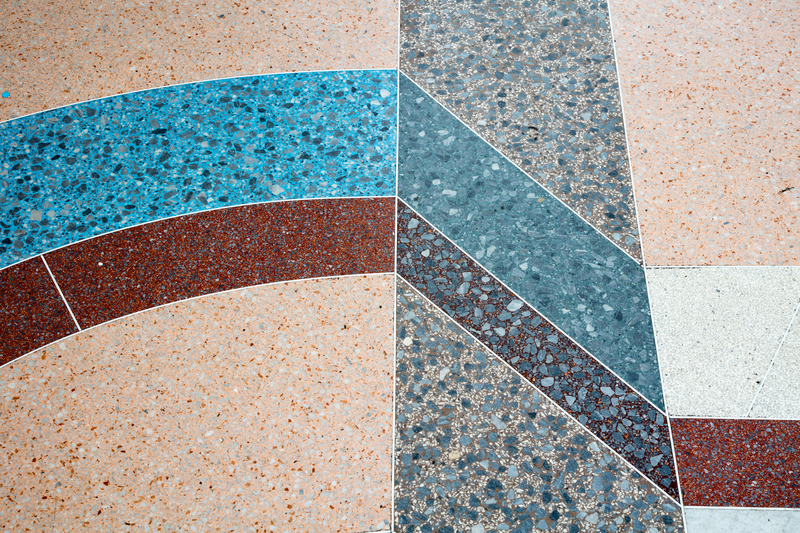 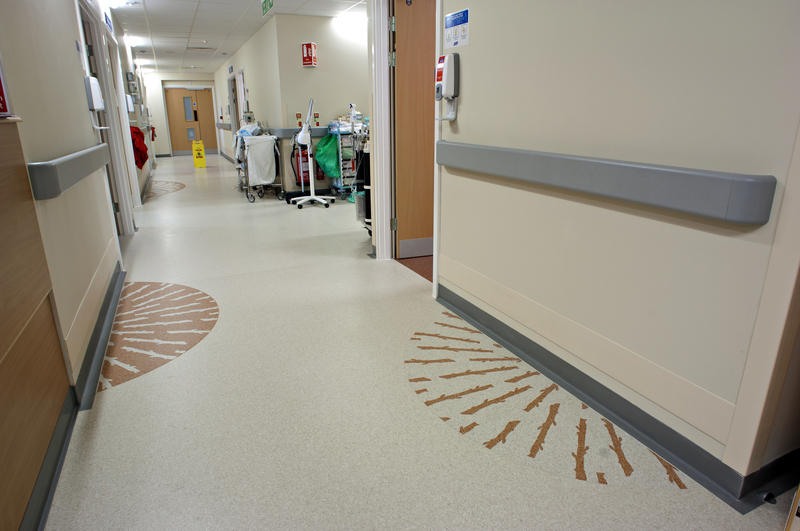 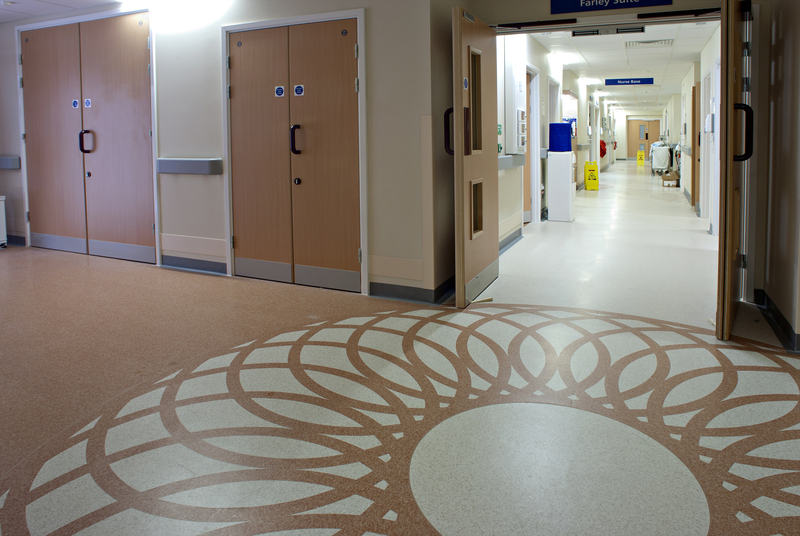 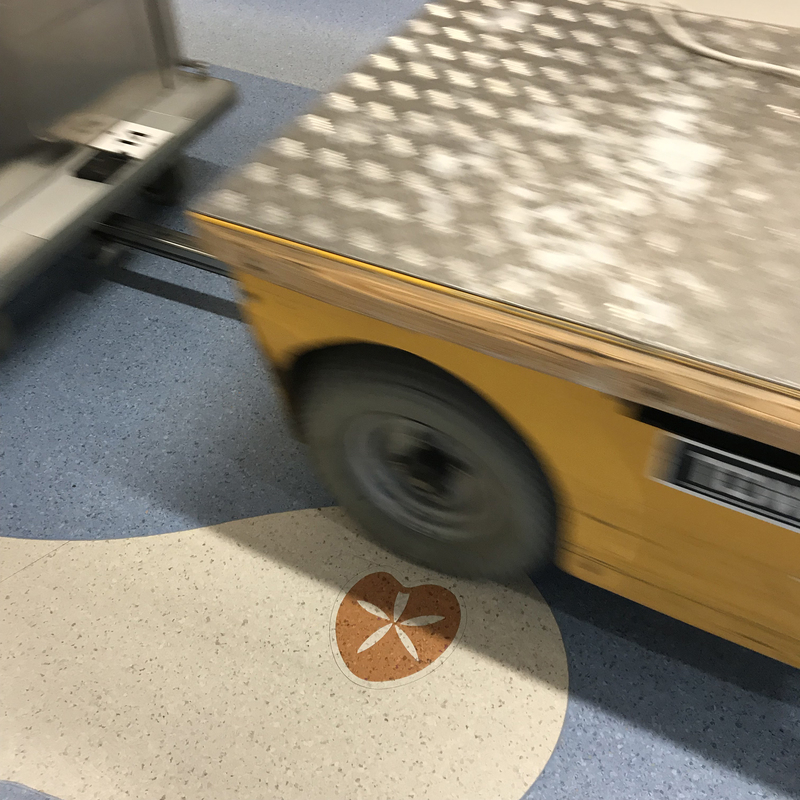 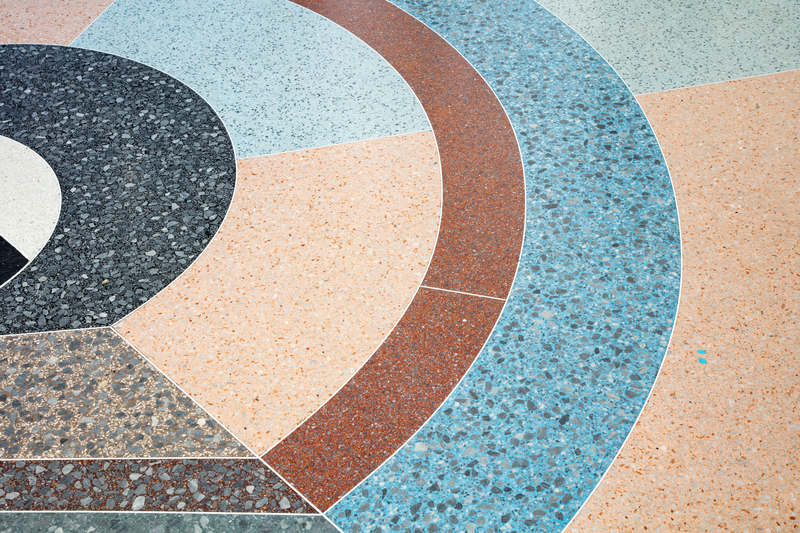 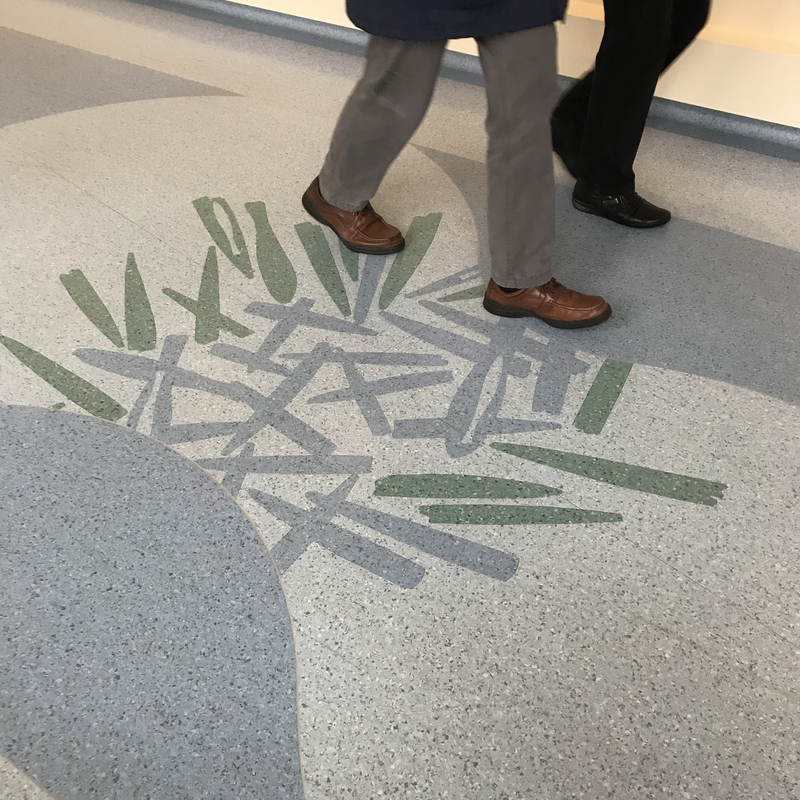 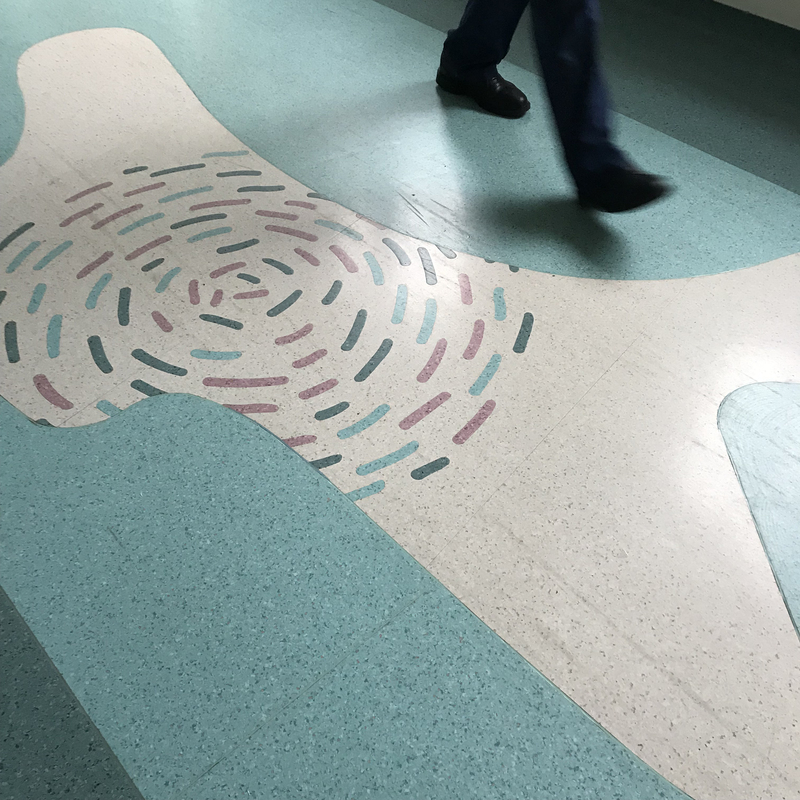 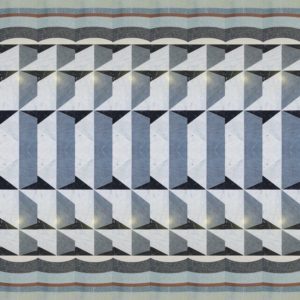 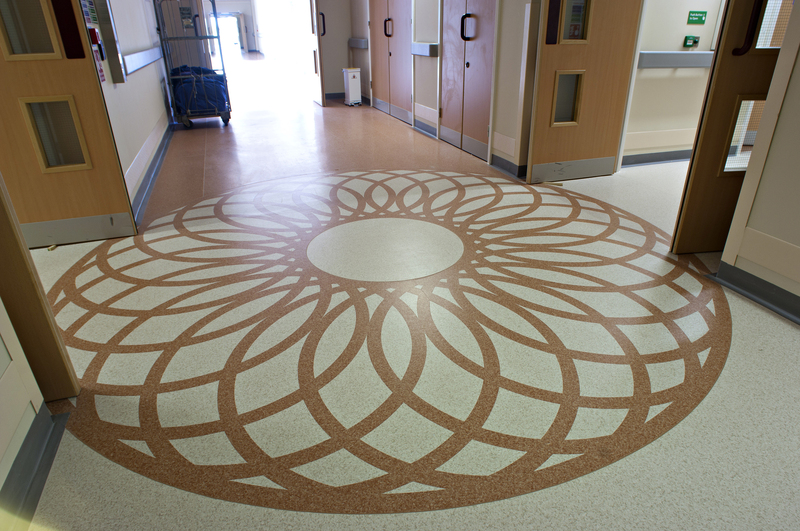 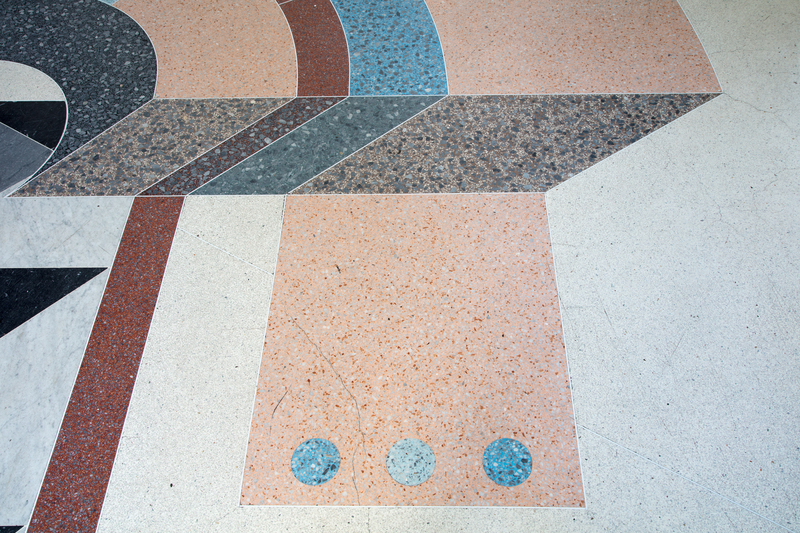 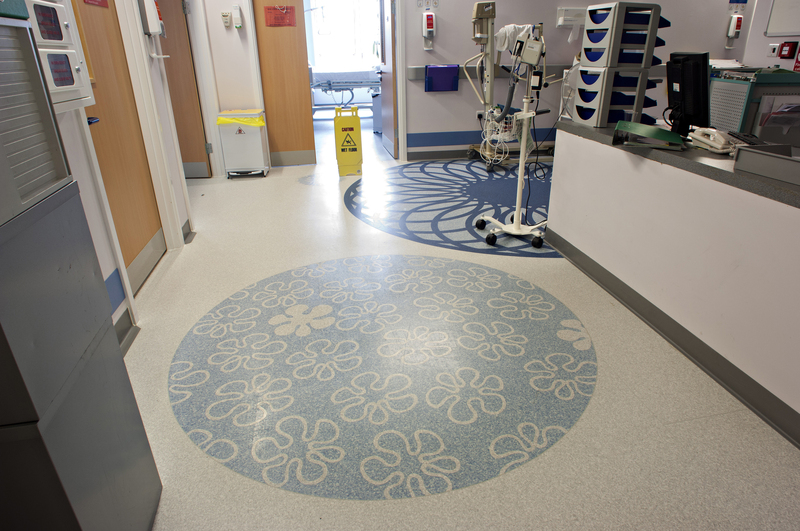 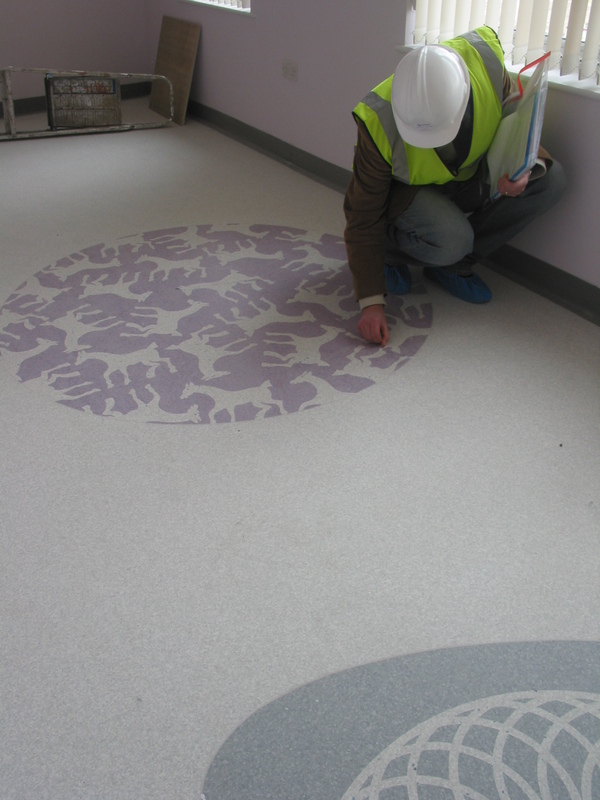 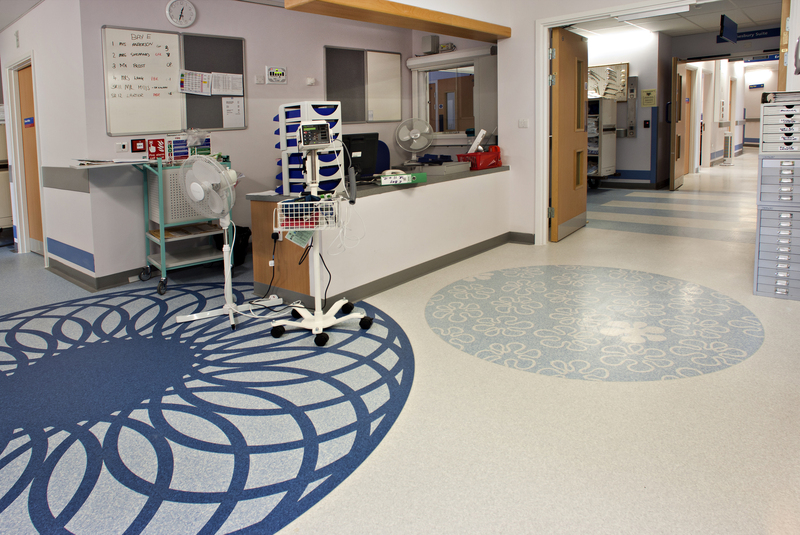 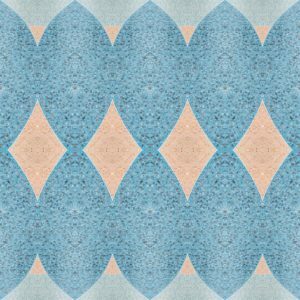 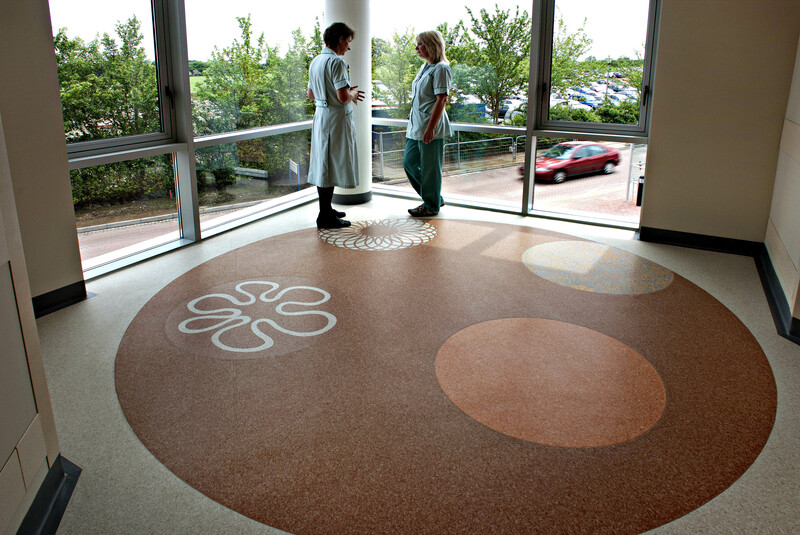 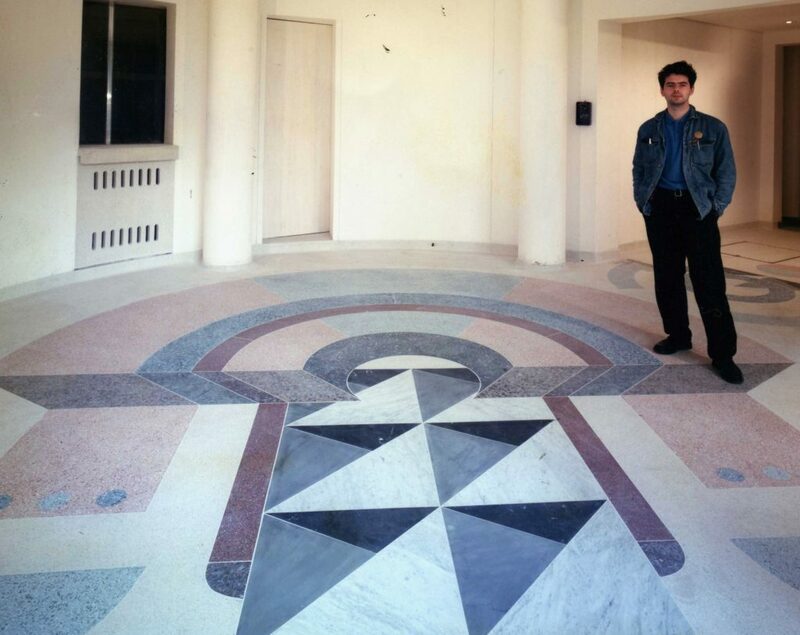 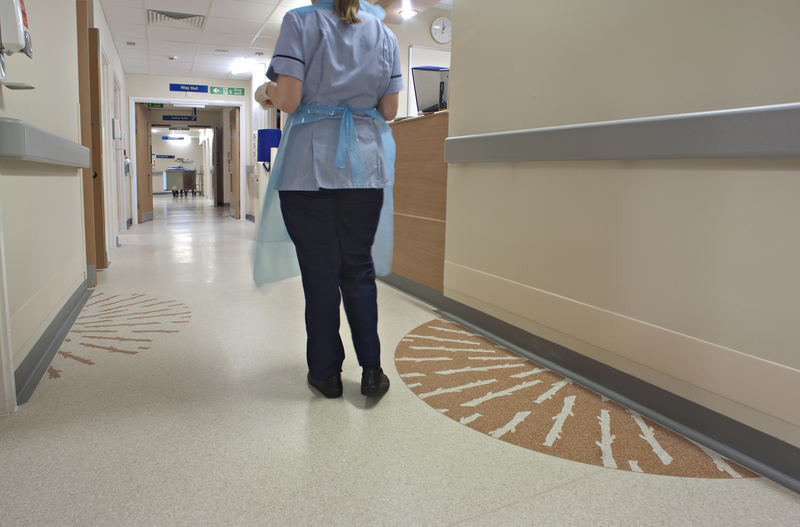 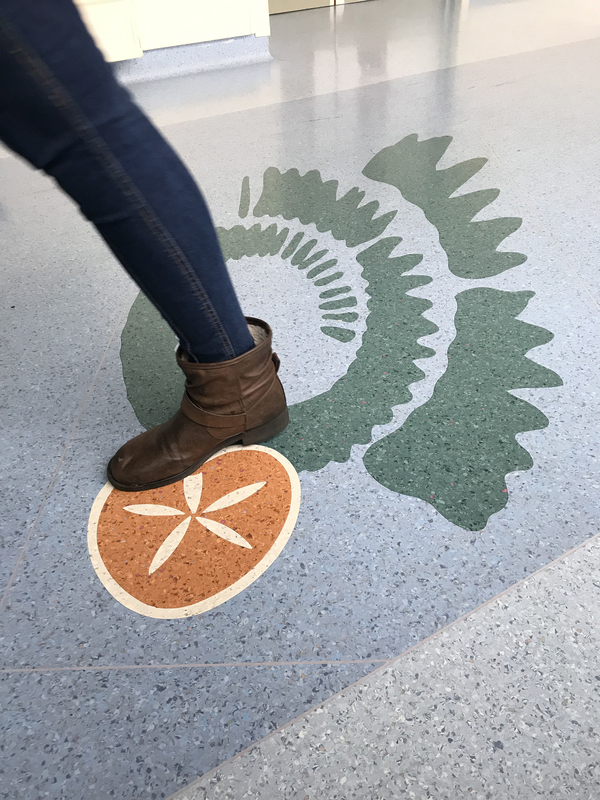 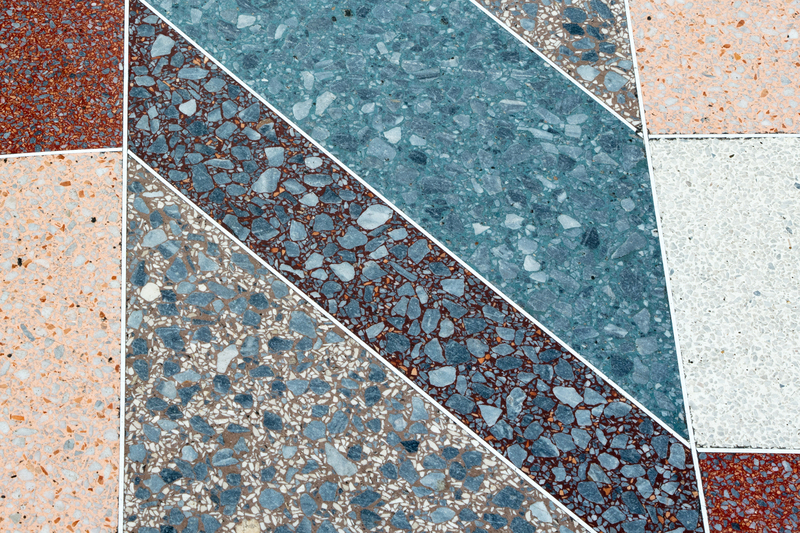 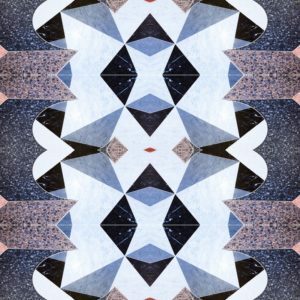 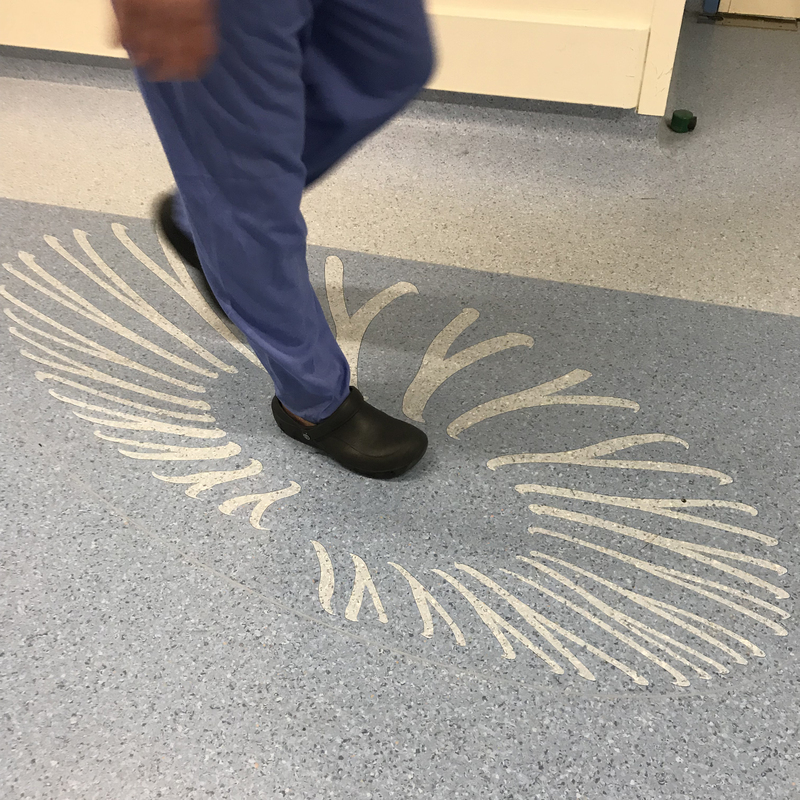 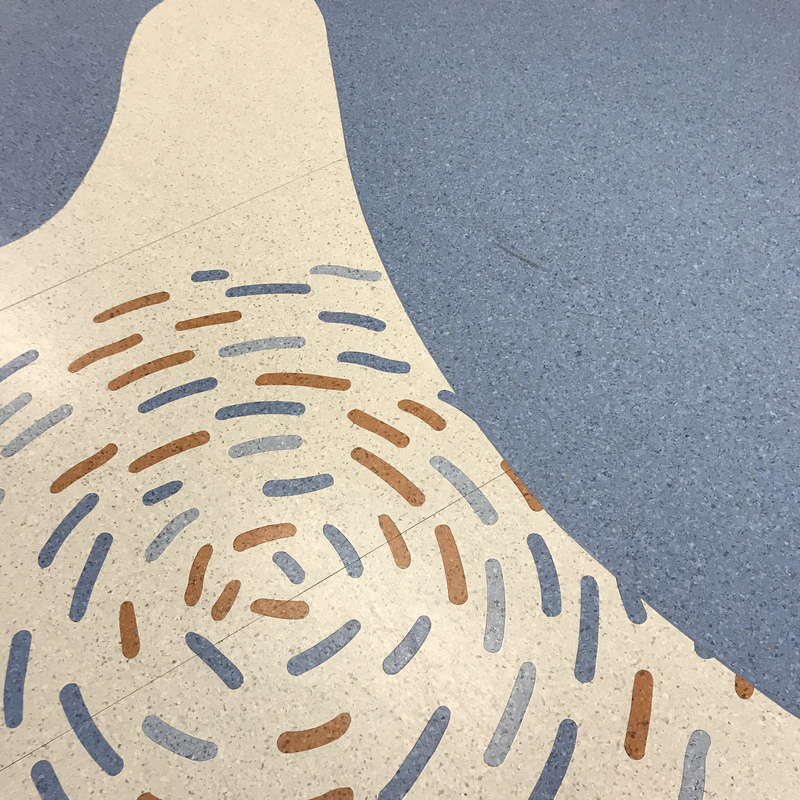 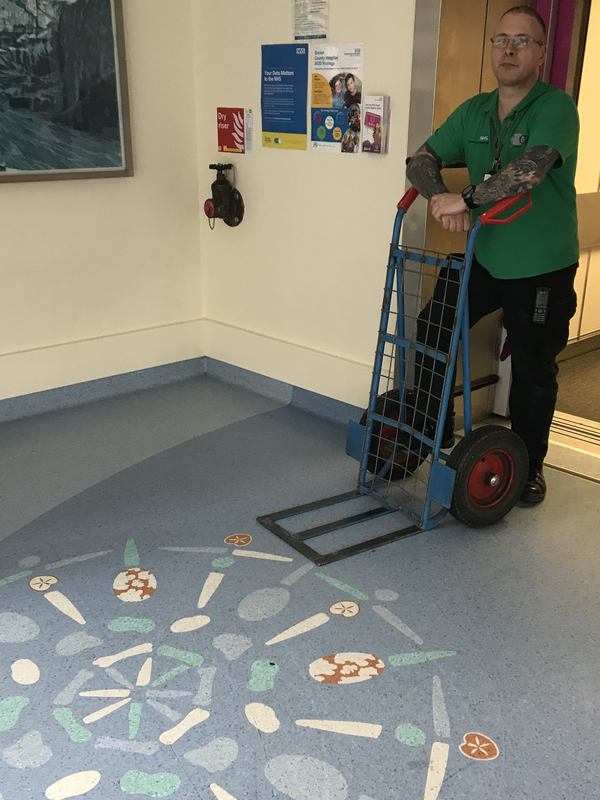 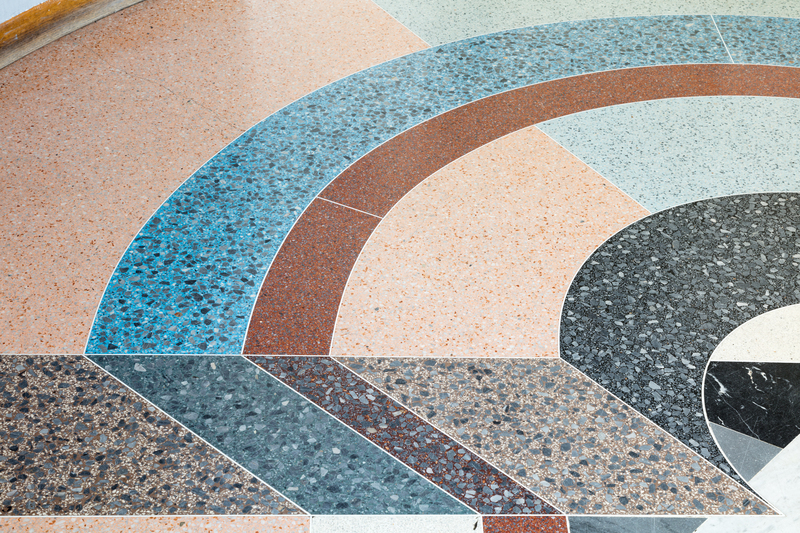 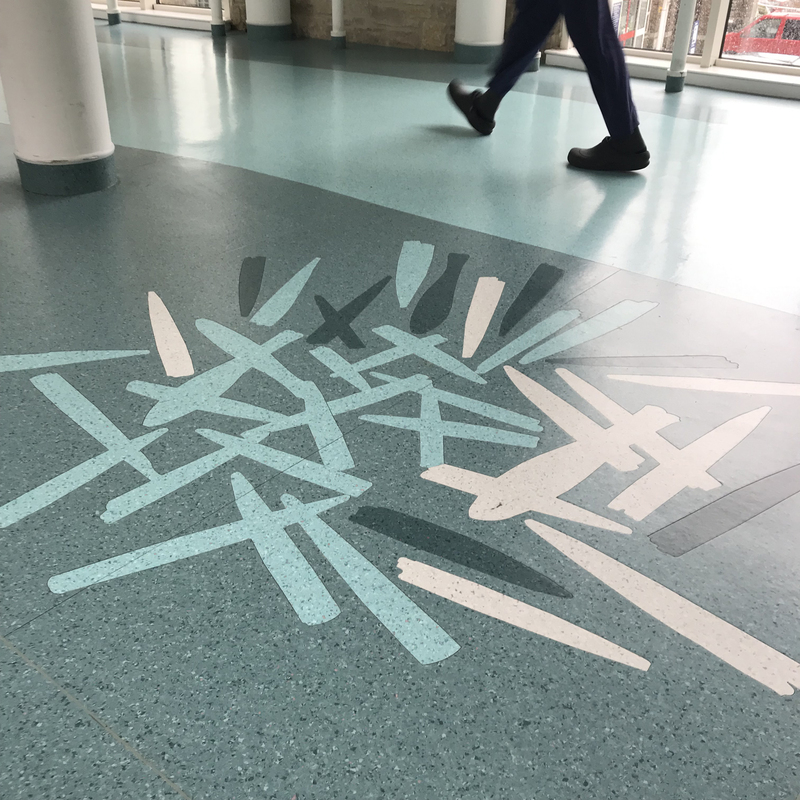 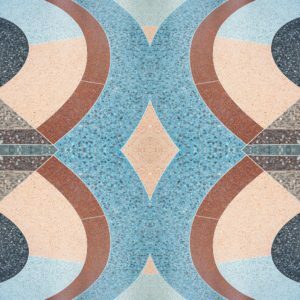 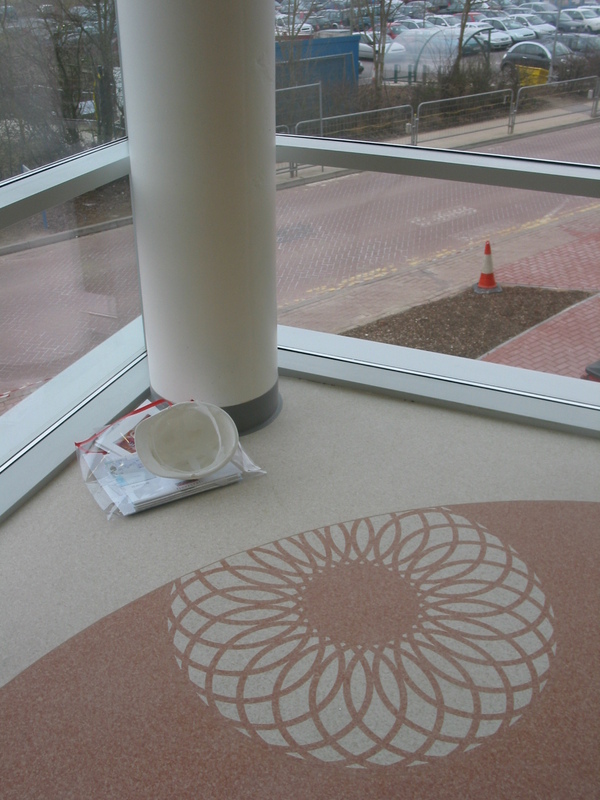 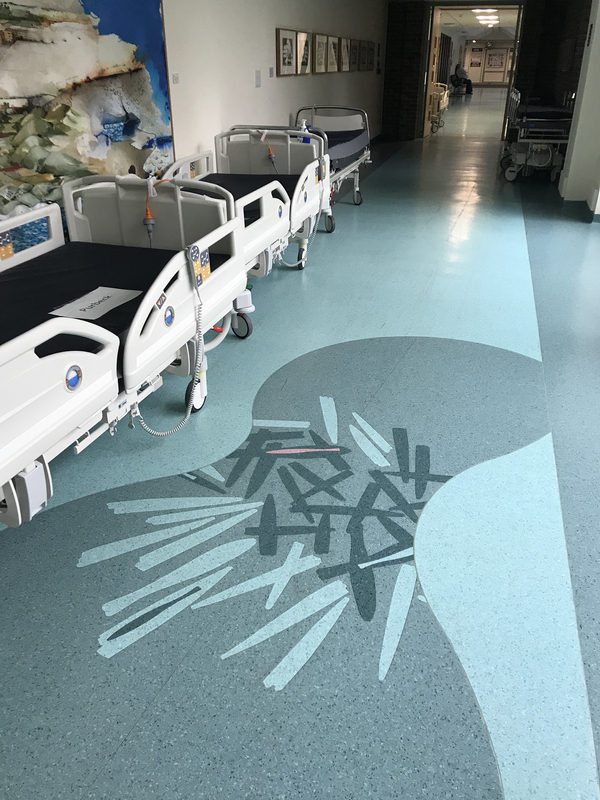 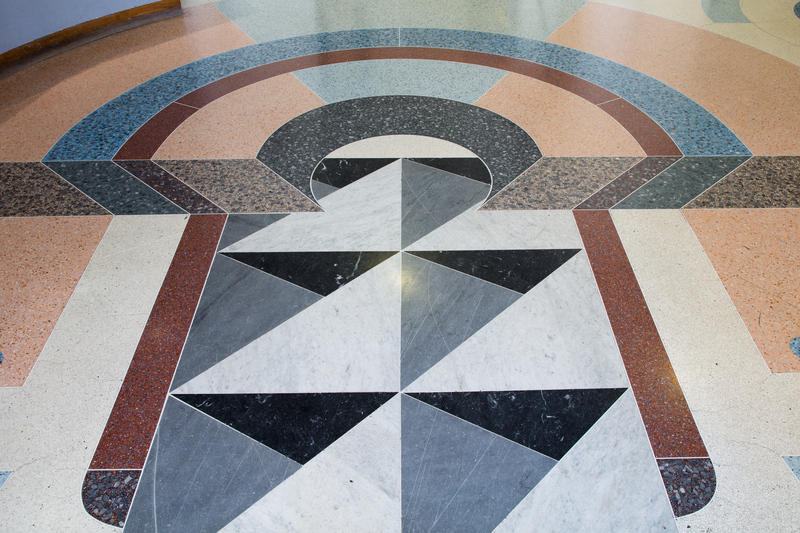 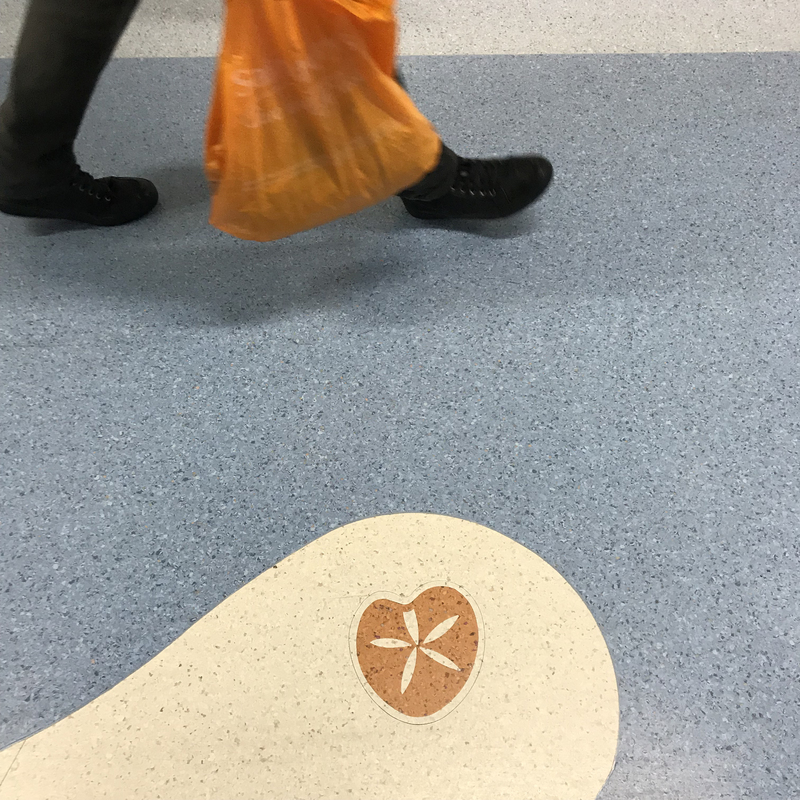 We collaborated with Tarkett flooring and created bespoke motifs which were inlaid at key points along the Hospital Streets such as lift lobbies and stairs. 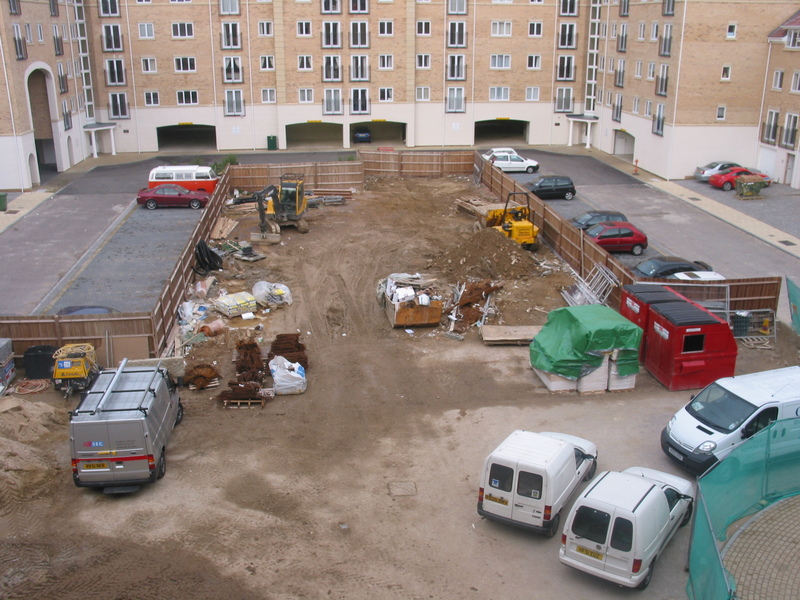 The work is now almost 10 years old and still looks remarkably fresh considering the heavy traffic.